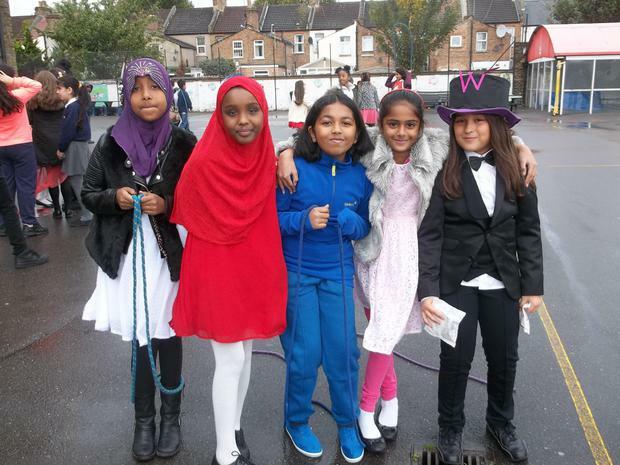 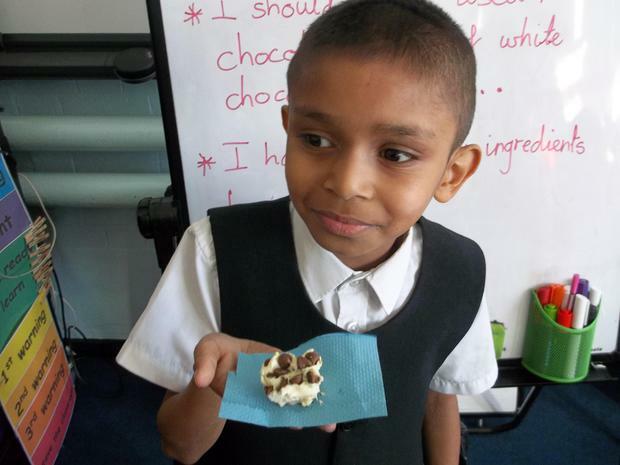 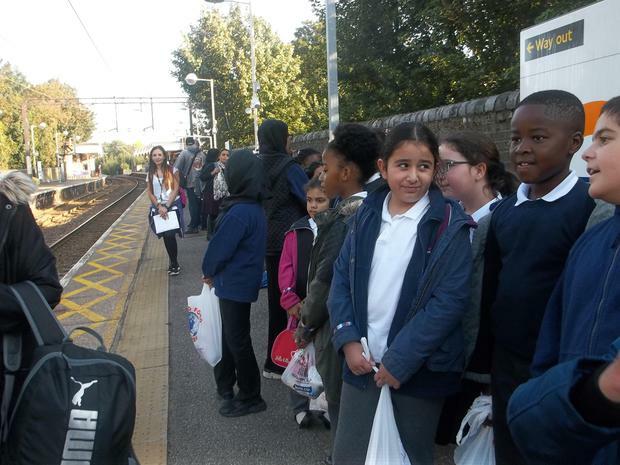 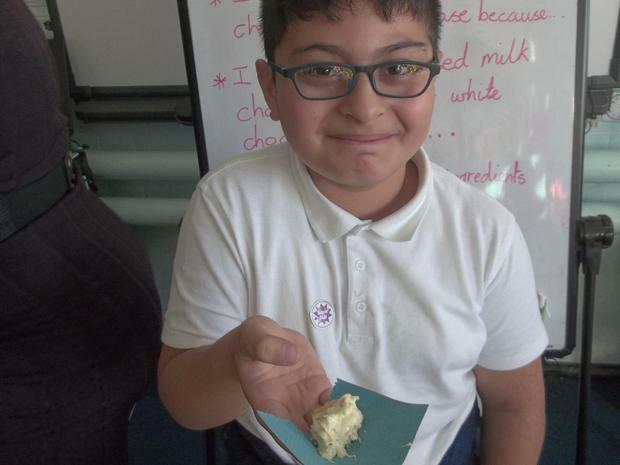 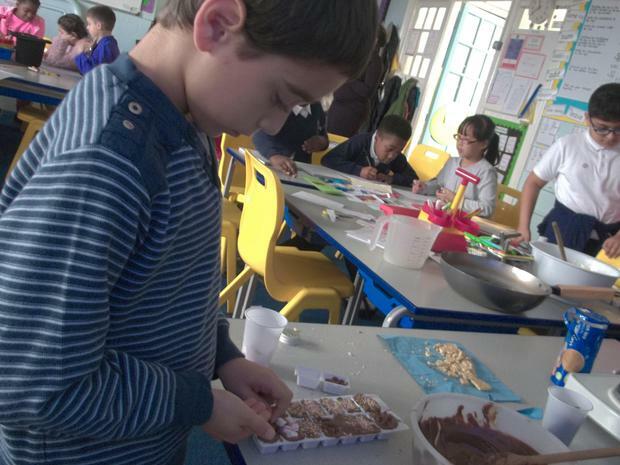 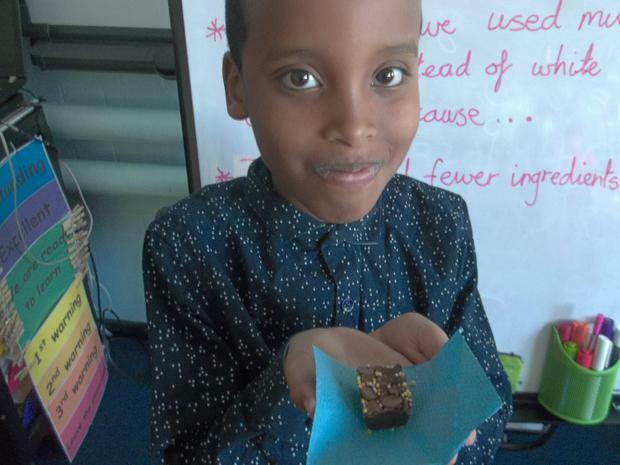 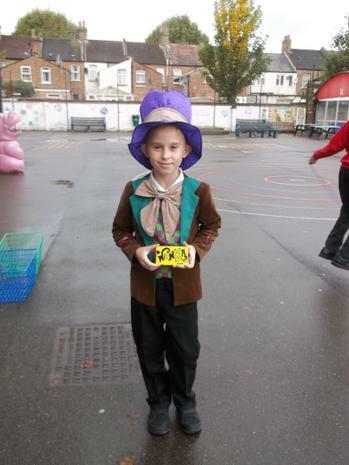 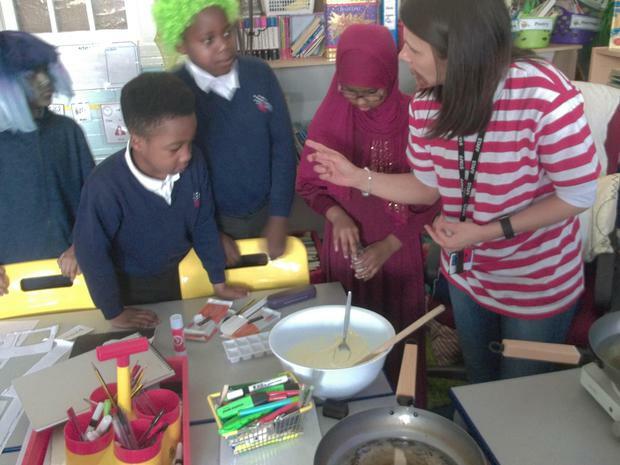 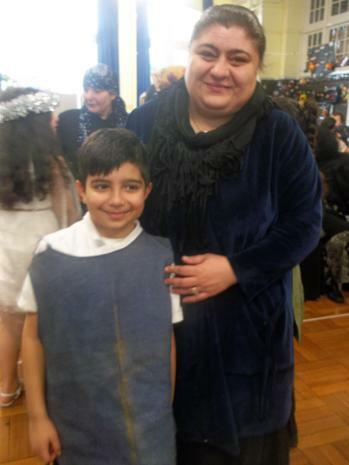 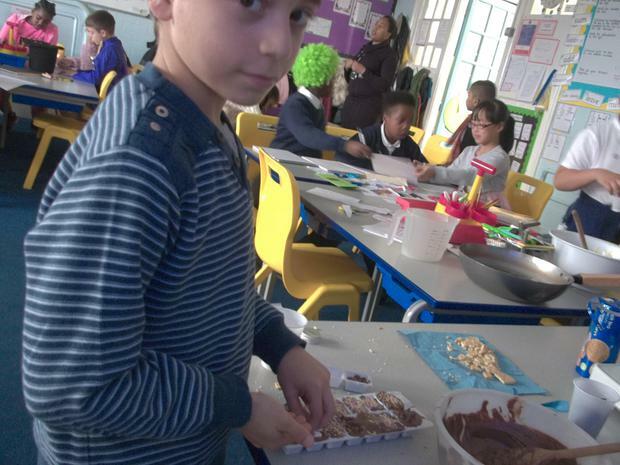 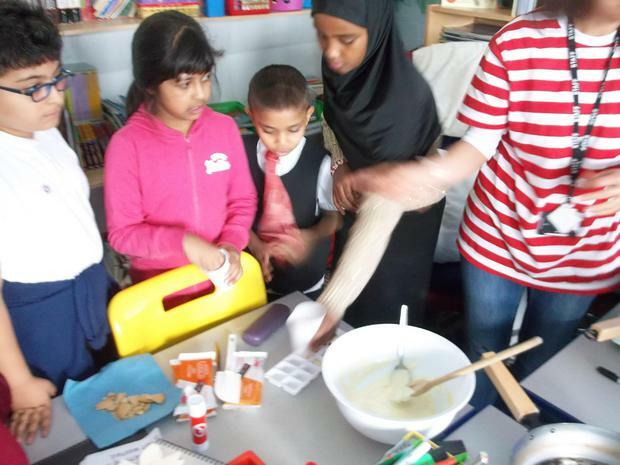 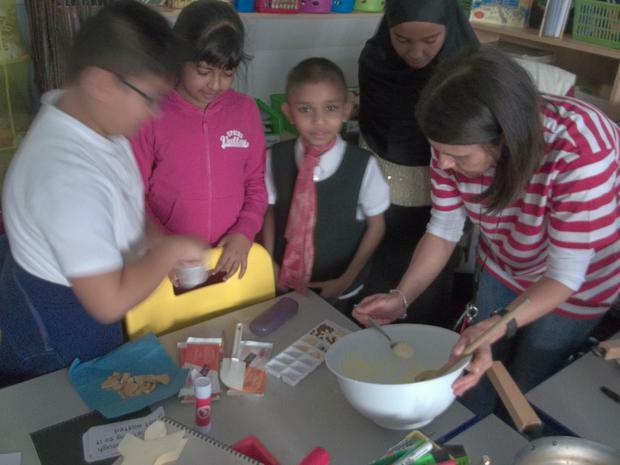 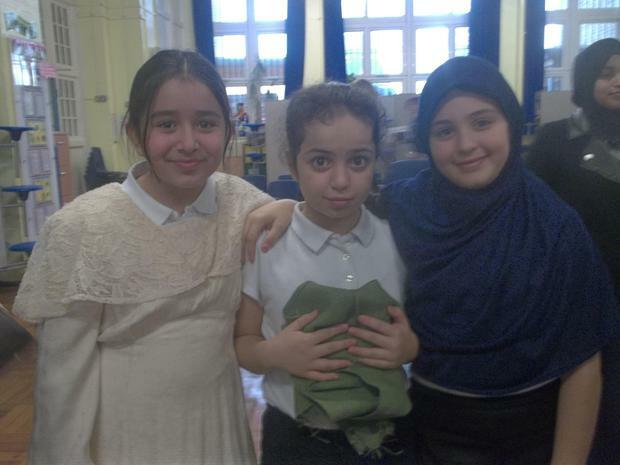 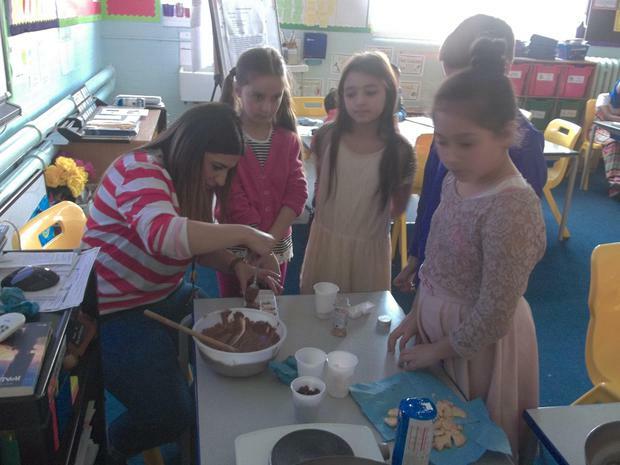 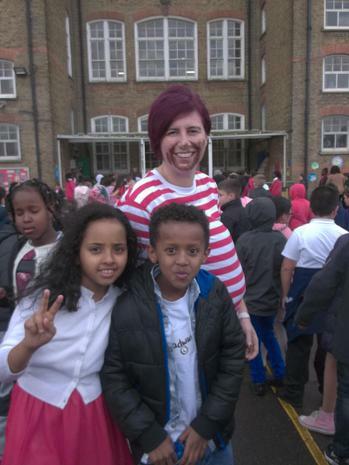 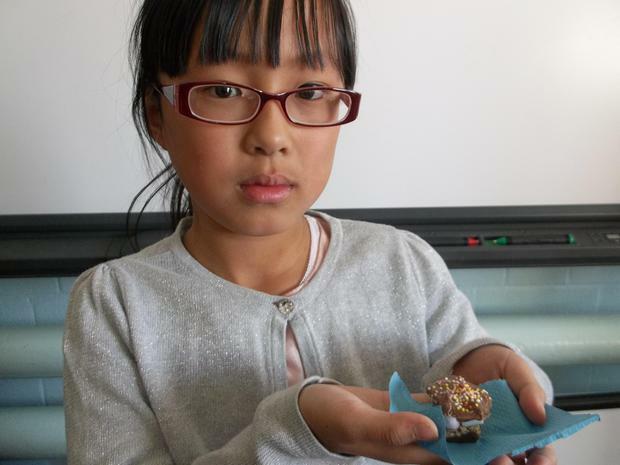 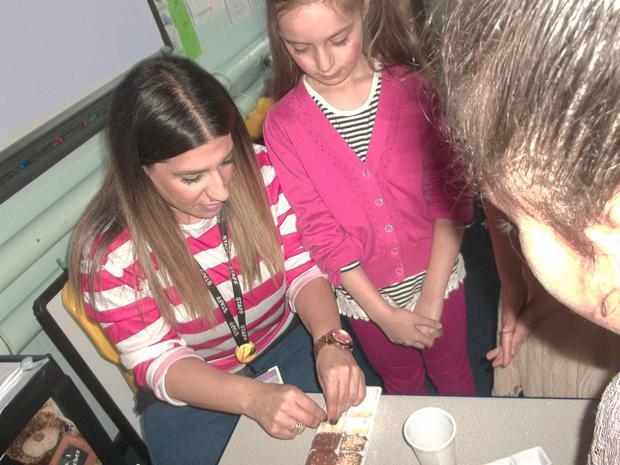 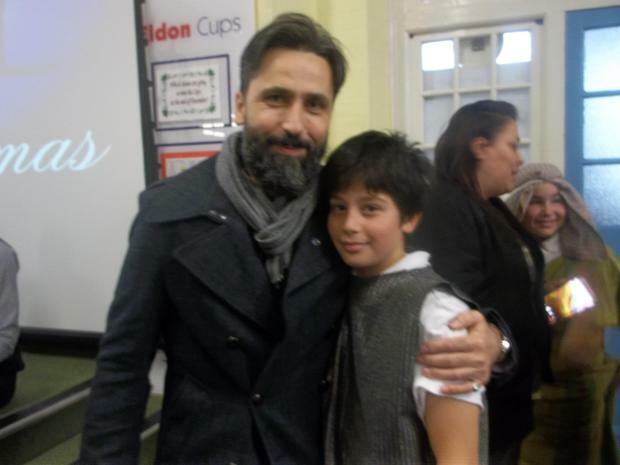 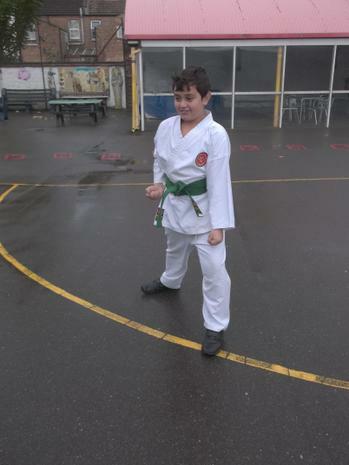 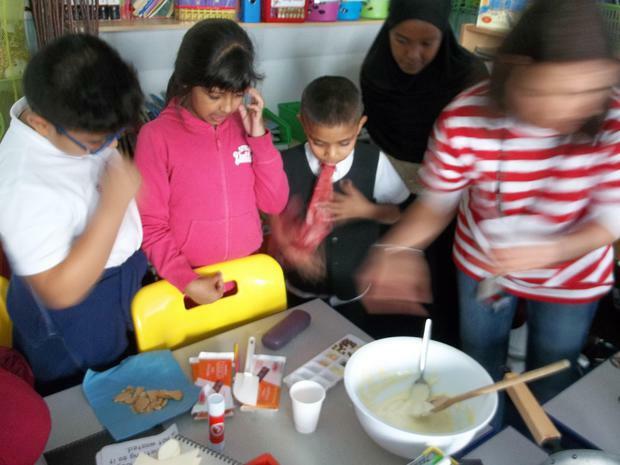 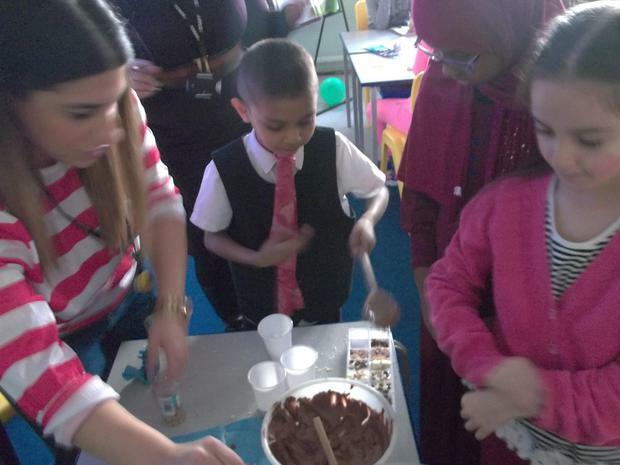 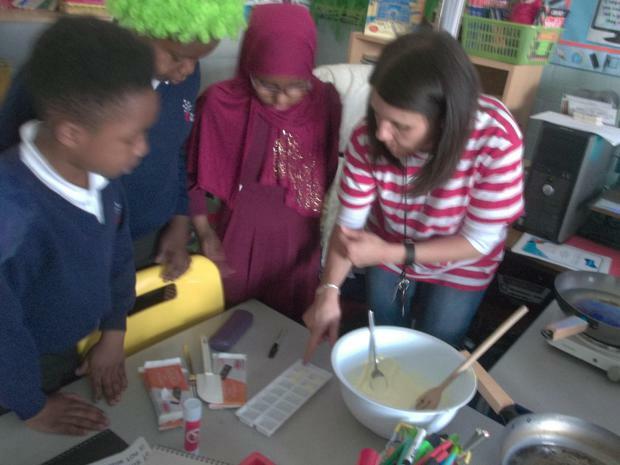 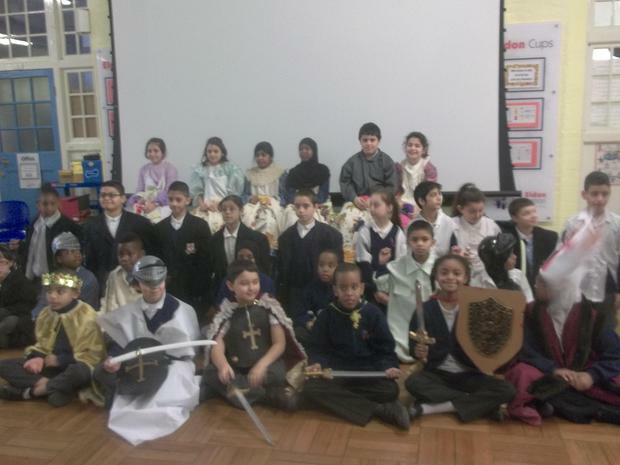 Year 5 is an extremely exciting year for your child/children. 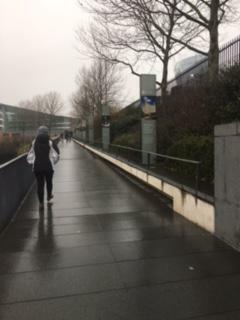 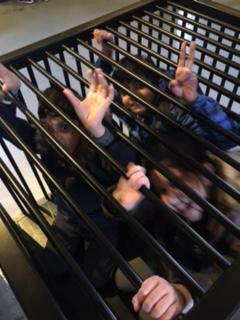 The jump may be scary for them. 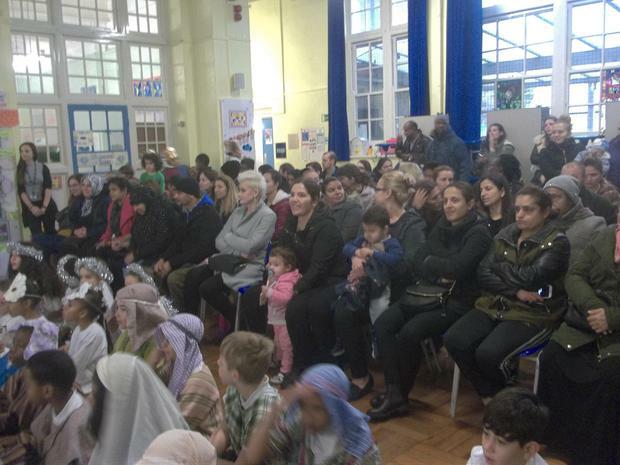 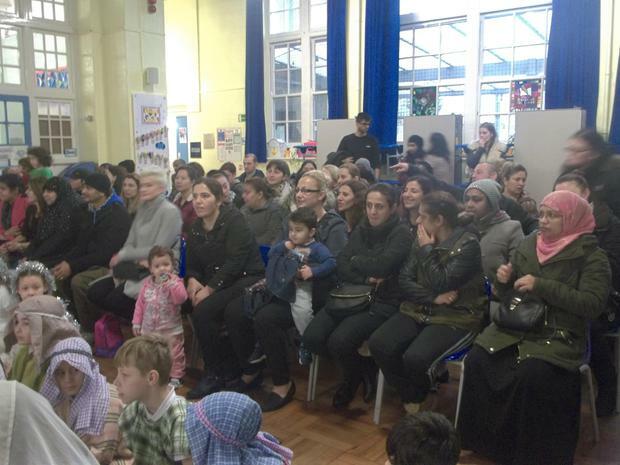 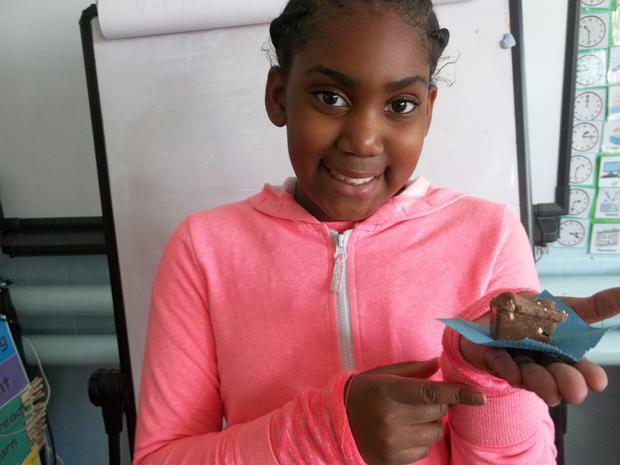 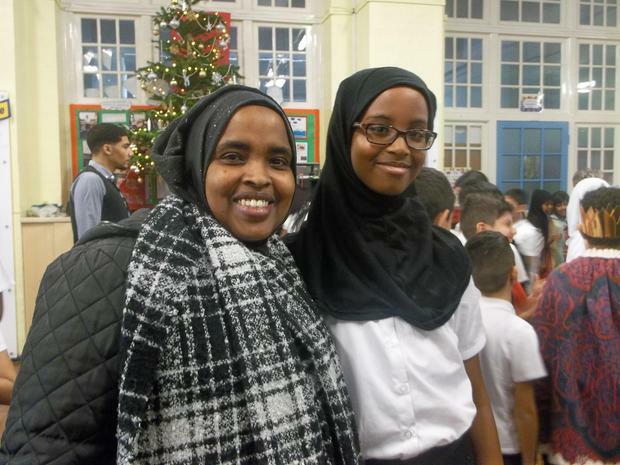 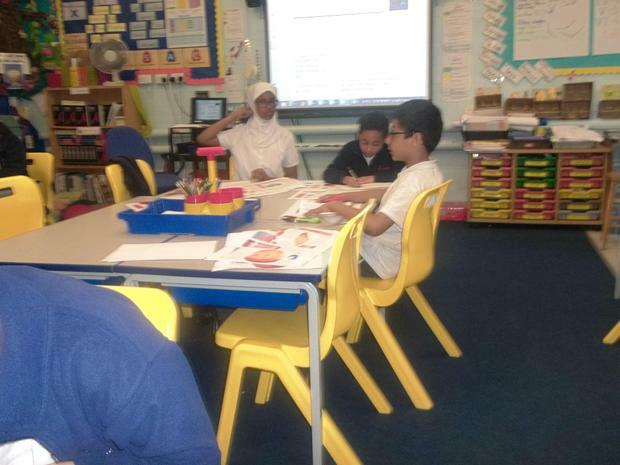 We work very hard to ensure all children settle in comfortably to the new academic year. 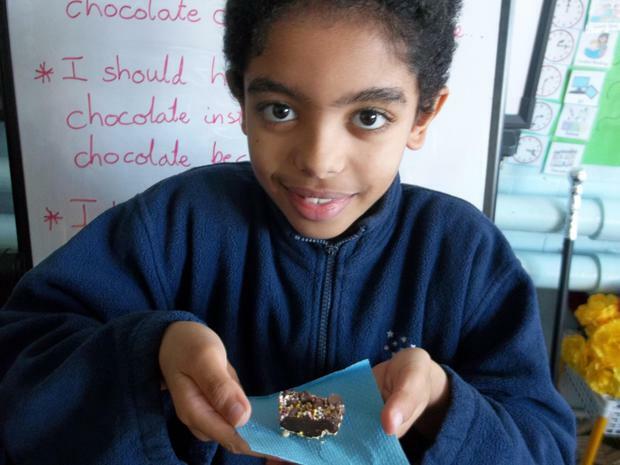 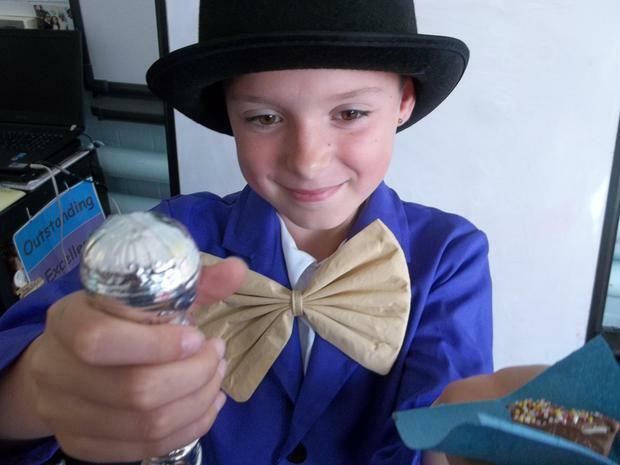 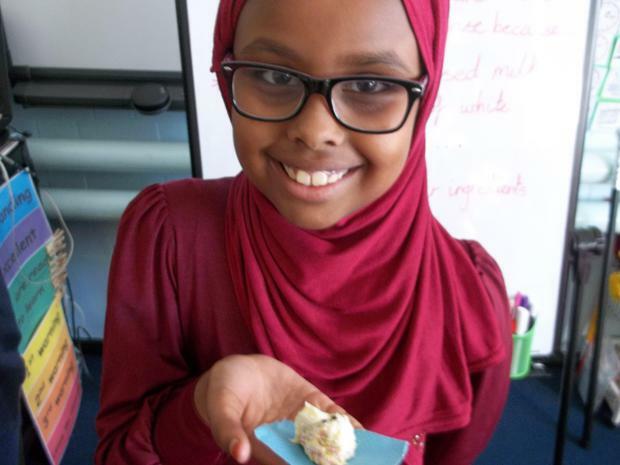 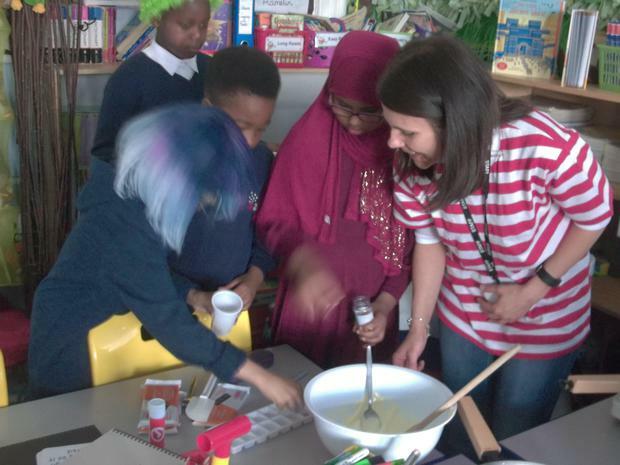 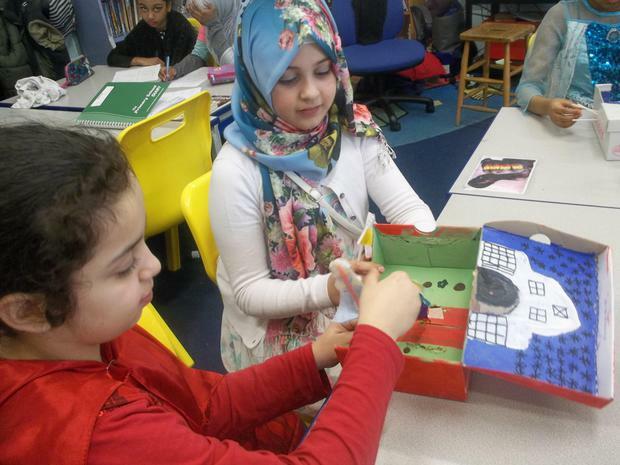 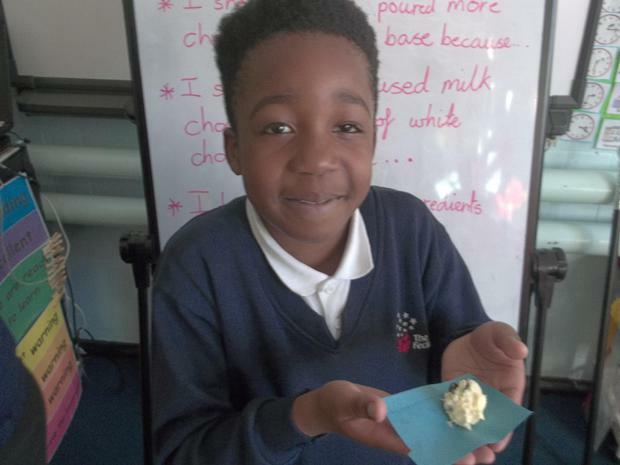 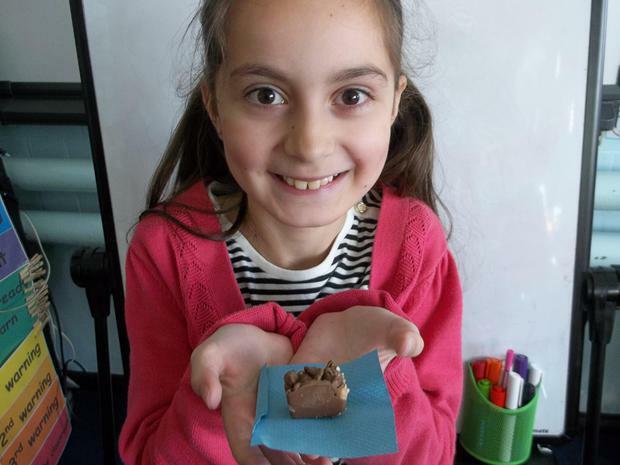 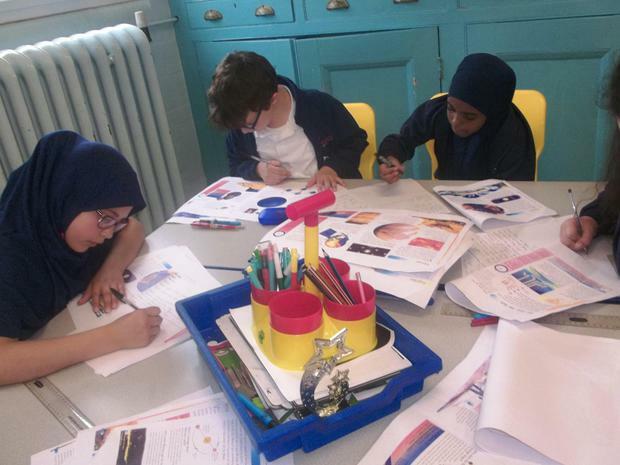 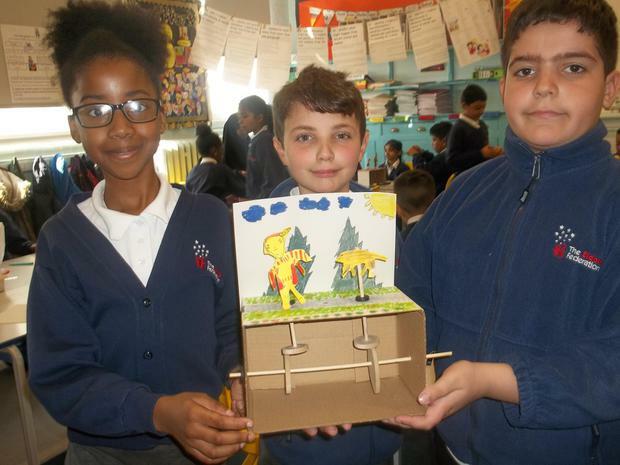 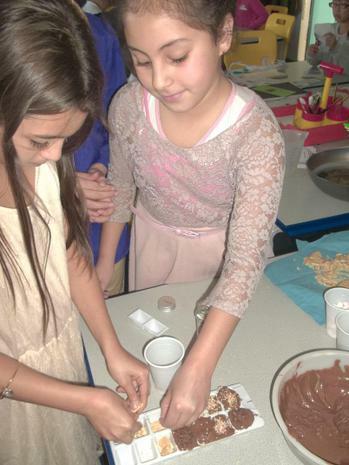 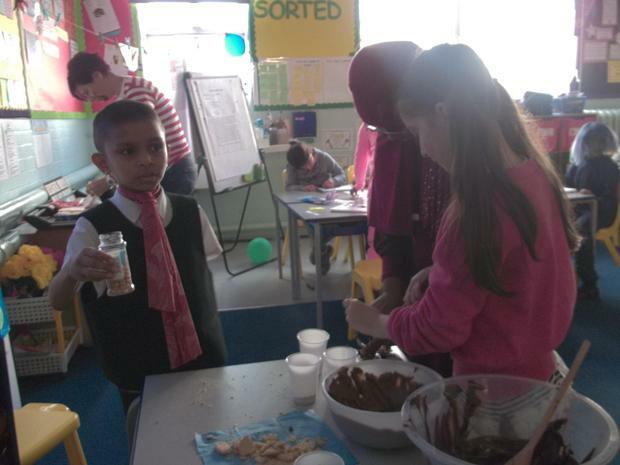 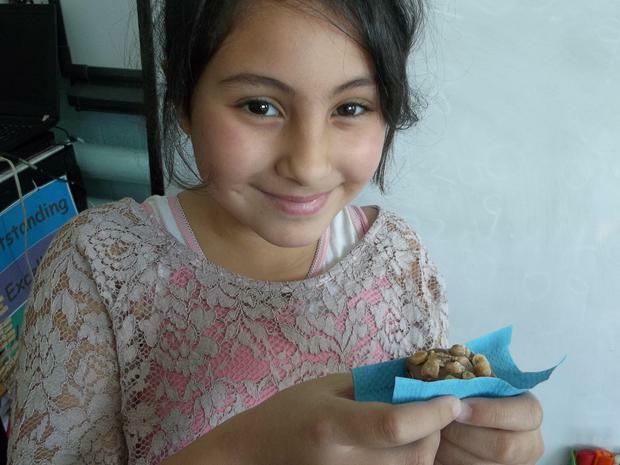 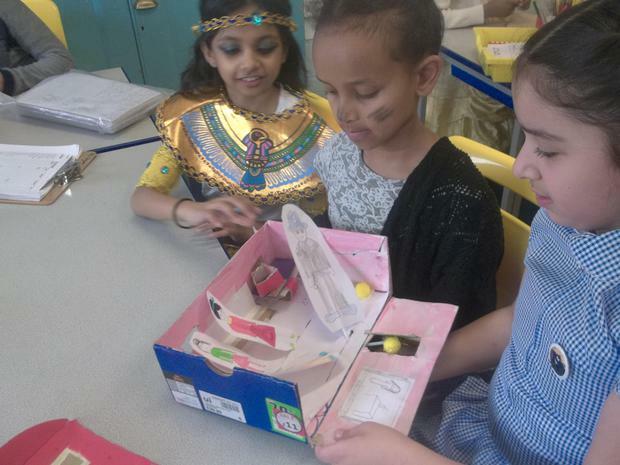 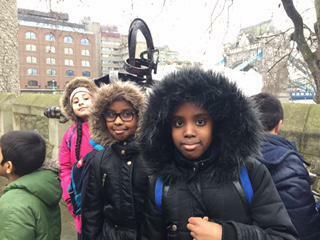 Our Year 5 curriculum covers an exciting range of topics, with interesting and fun trips to extend their learning opportunities. 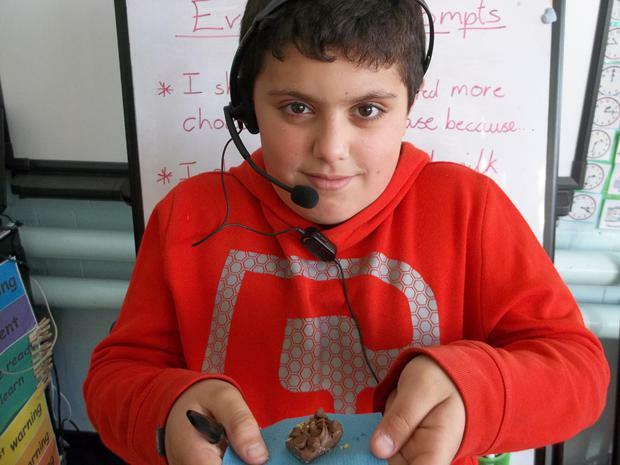 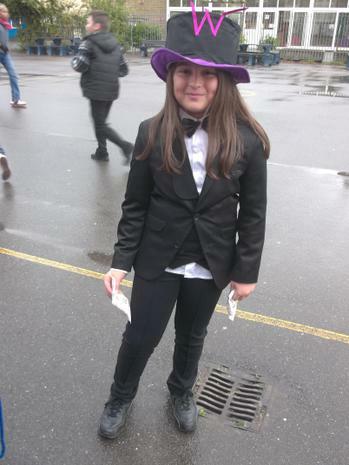 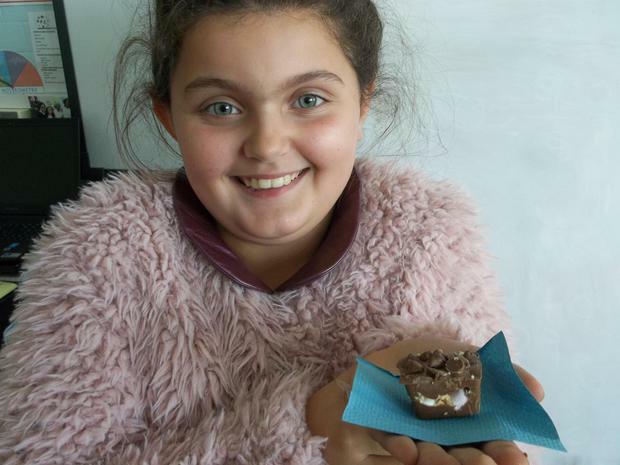 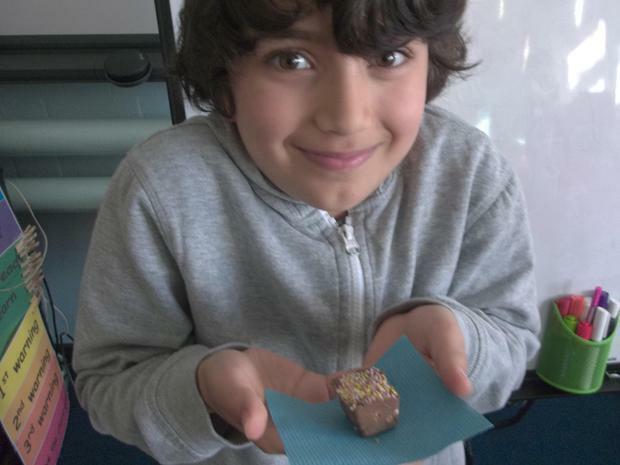 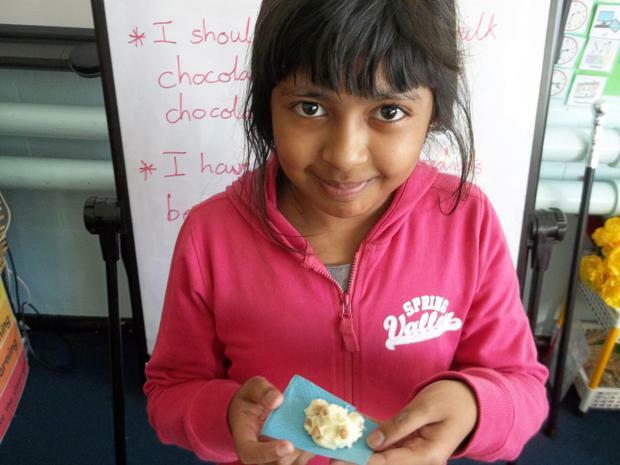 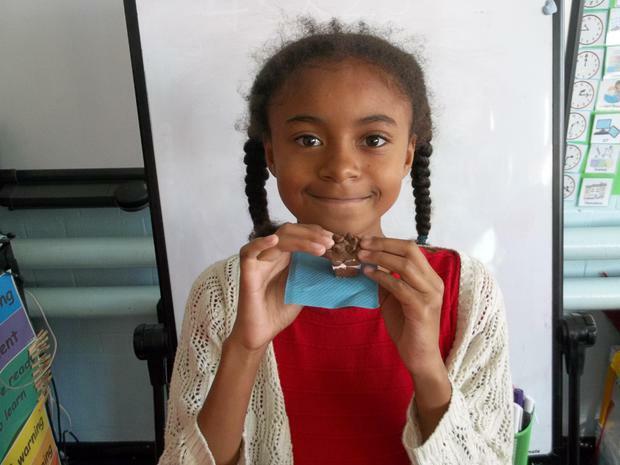 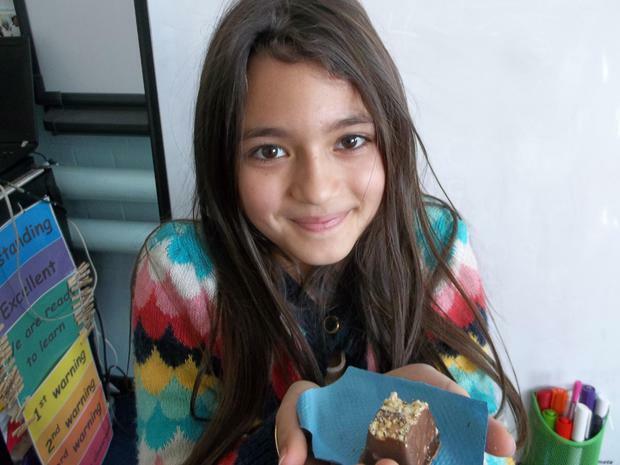 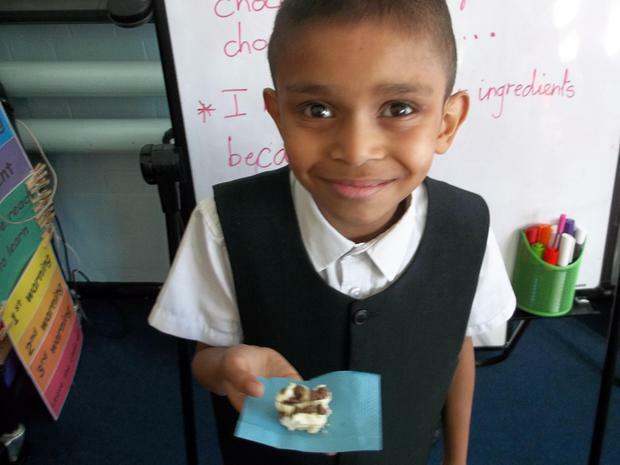 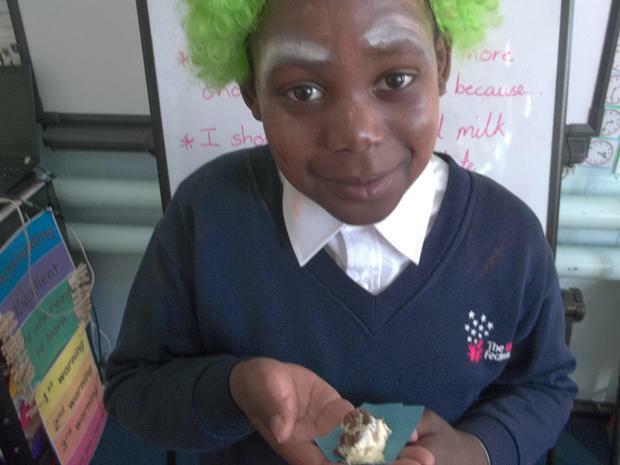 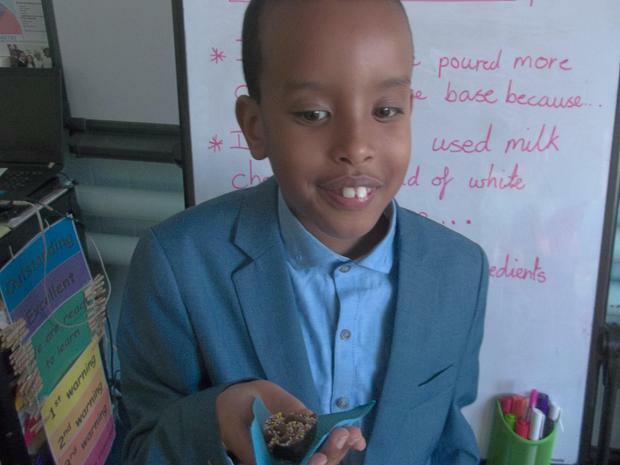 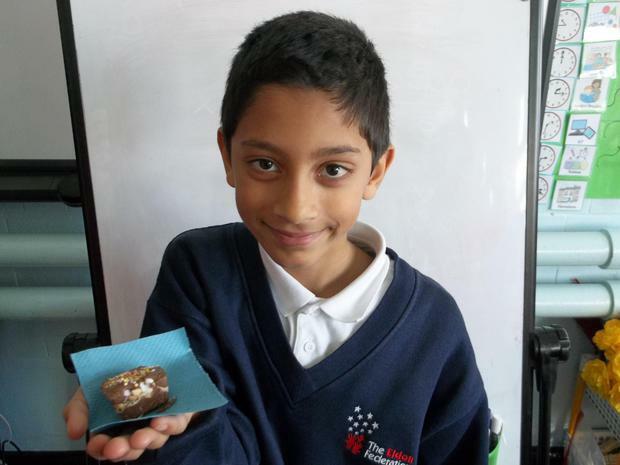 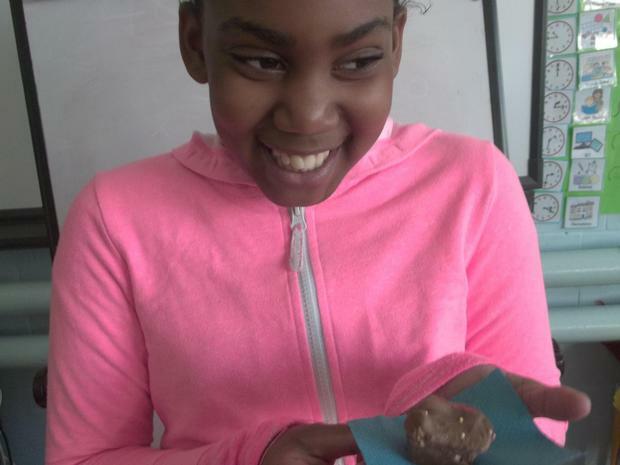 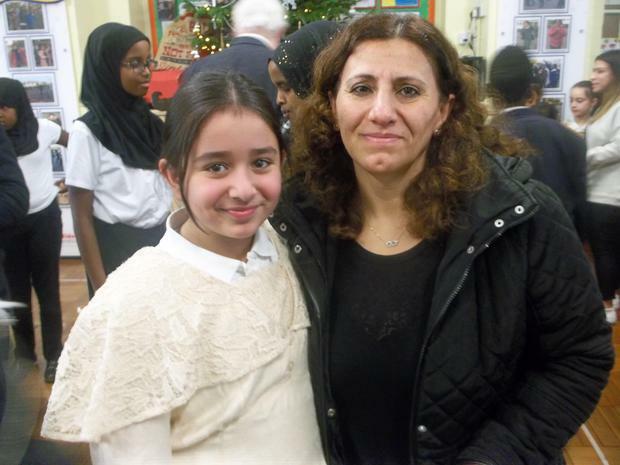 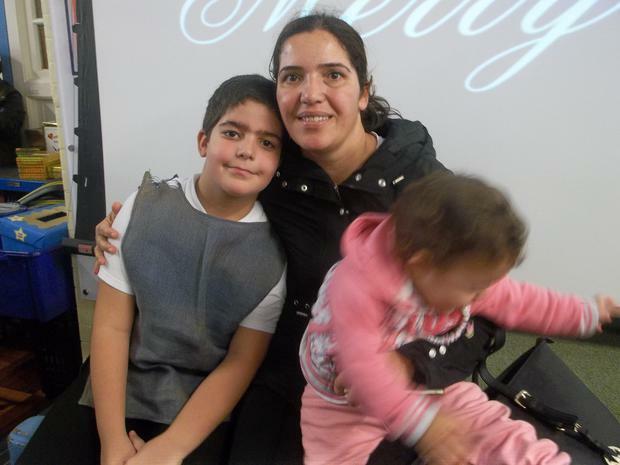 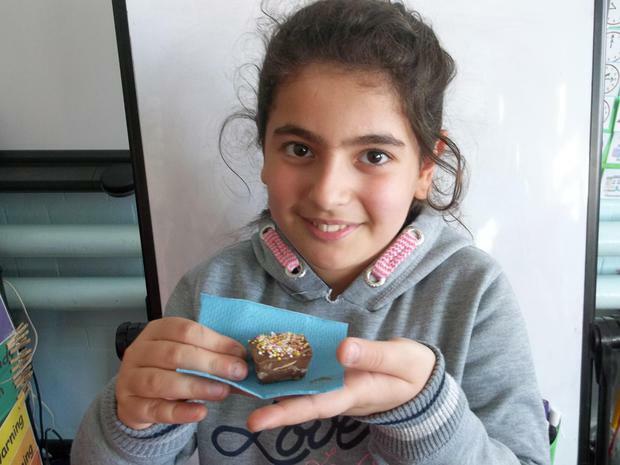 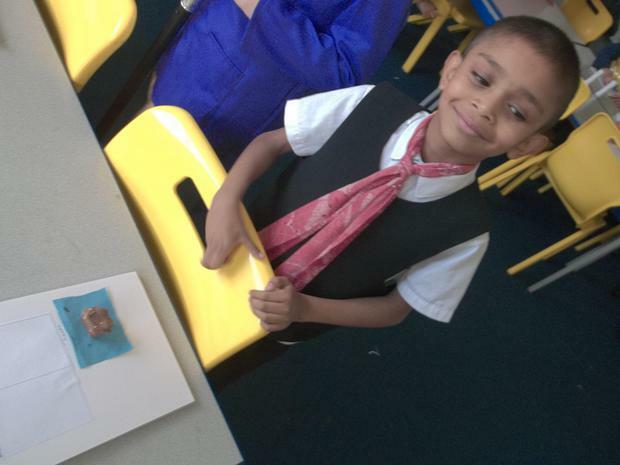 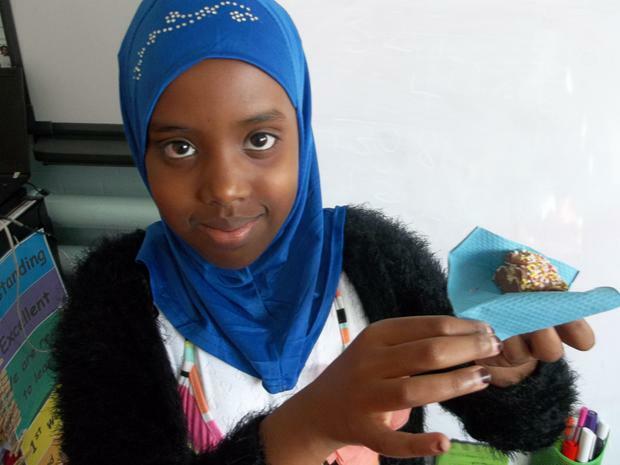 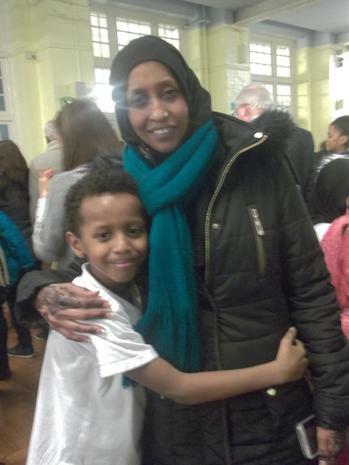 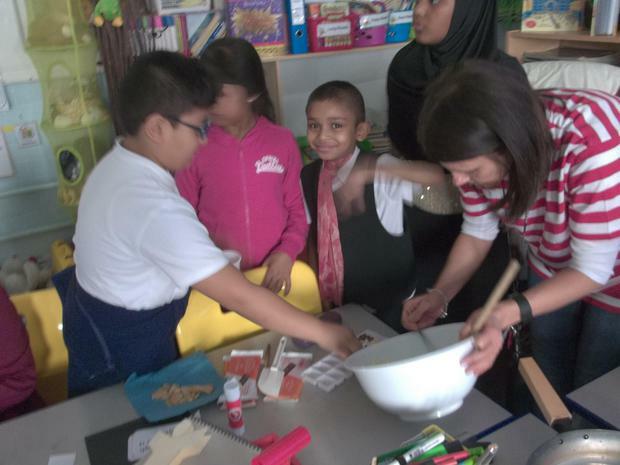 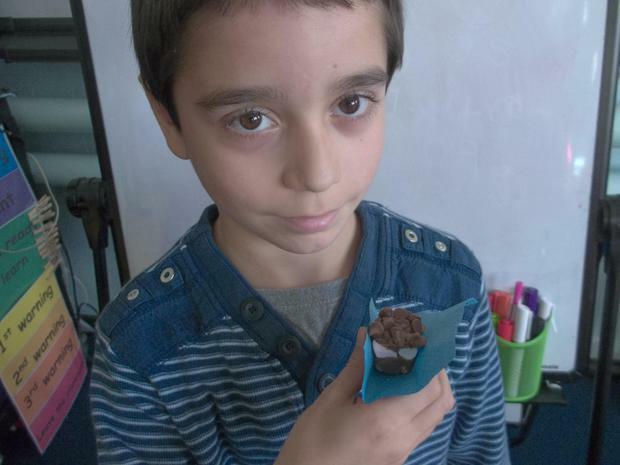 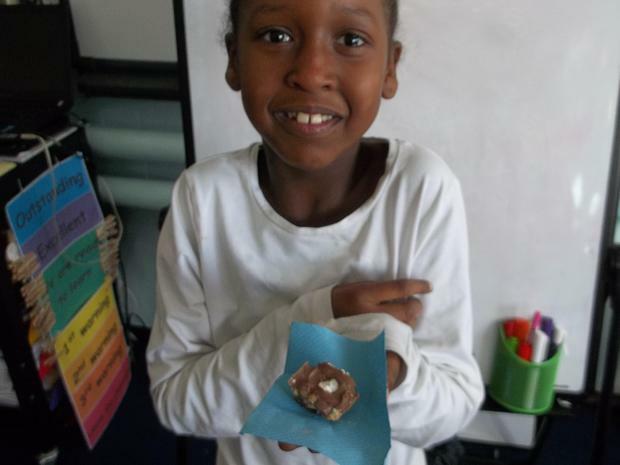 We ask for your support at home with reading and homework as well as learning their weekly spellings. 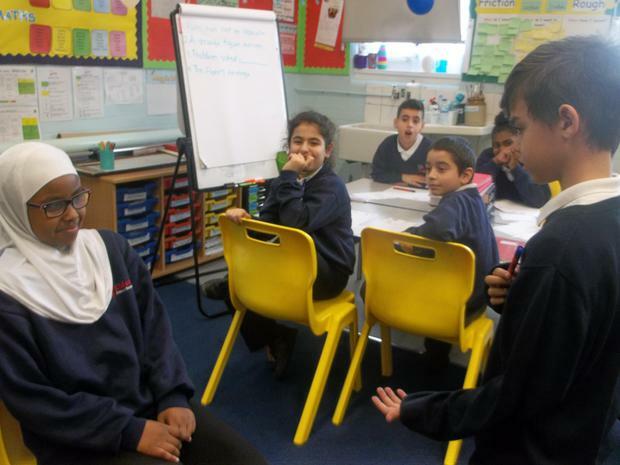 Next week, parents are invited to come and look at the video that will be shown to Year 5 as part of their changes topic. 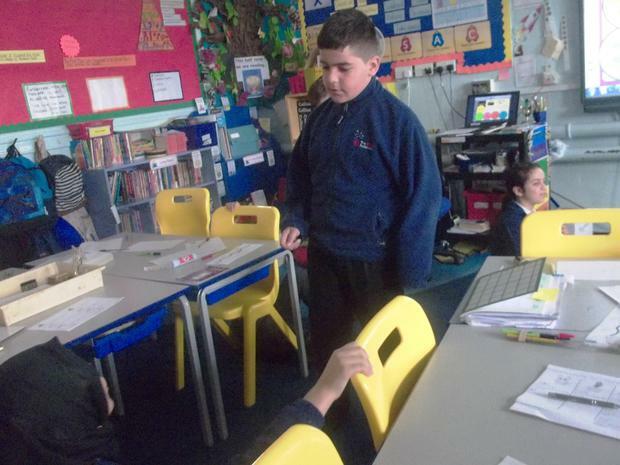 This will enable you to ask any question regarding any concerns. 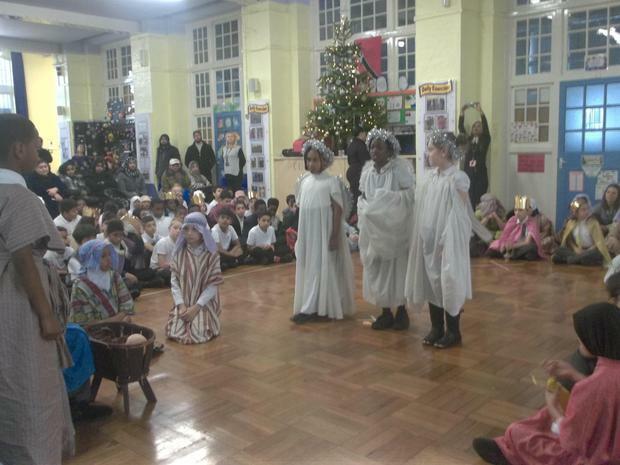 A crèche will also be available. 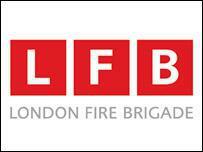 London Fire Brigade will also be attending Eldon Primary to visit Year 5. 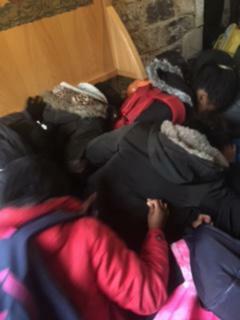 They will be going through safe features and what to do in an event of a fire. 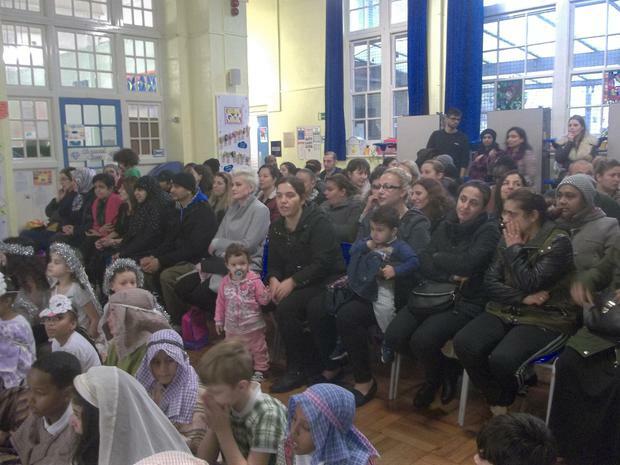 Please can you talk to yourchild/ren after this session is taught. 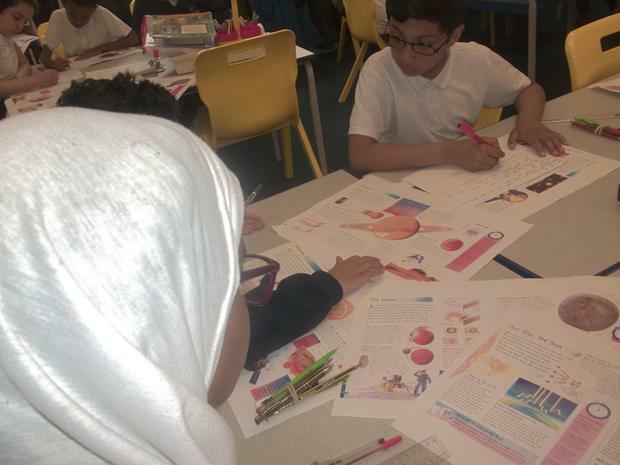 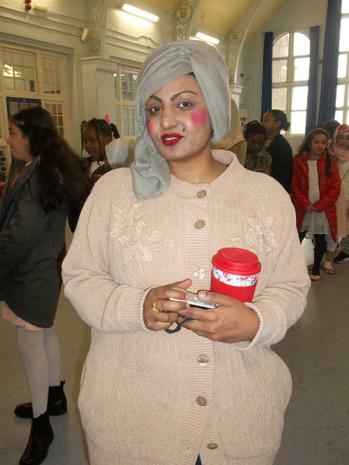 This is what your child can expect during the end of Year 5 tests. 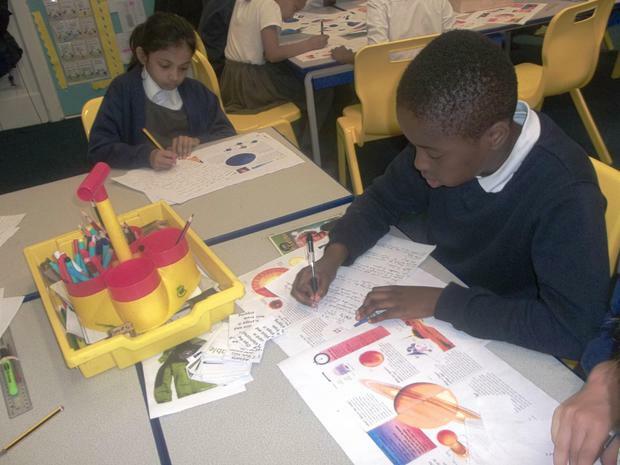 Use the websites provided to practise and do not forget to read everyday and practise spellings. 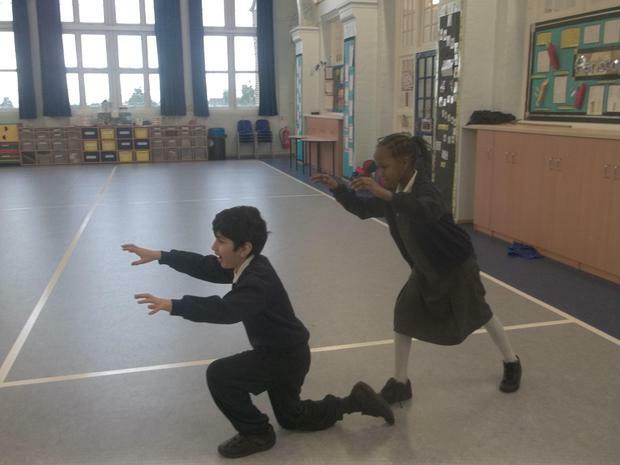 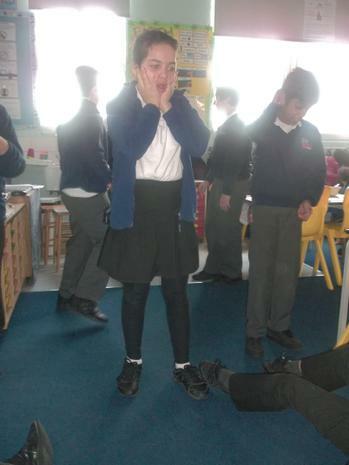 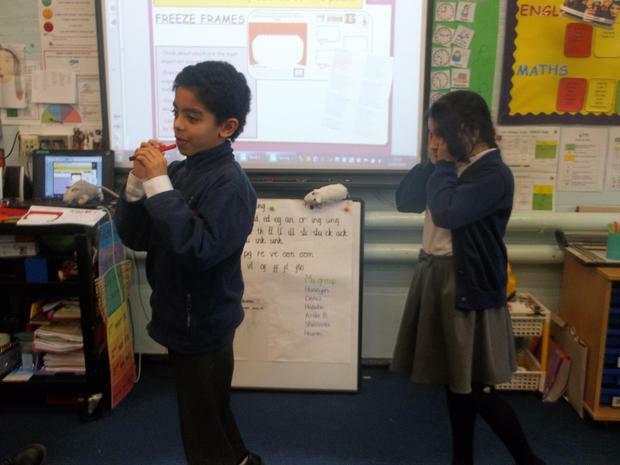 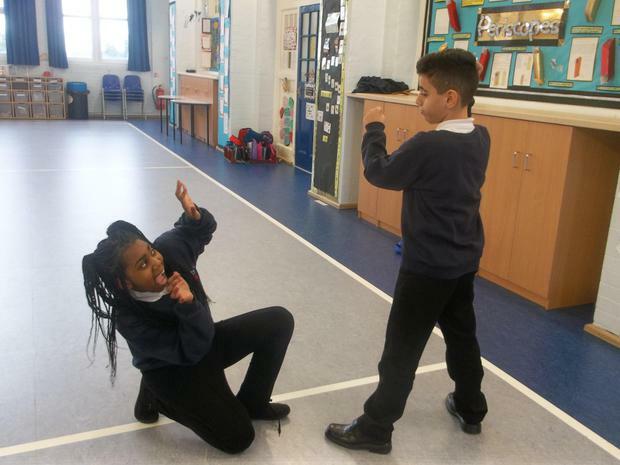 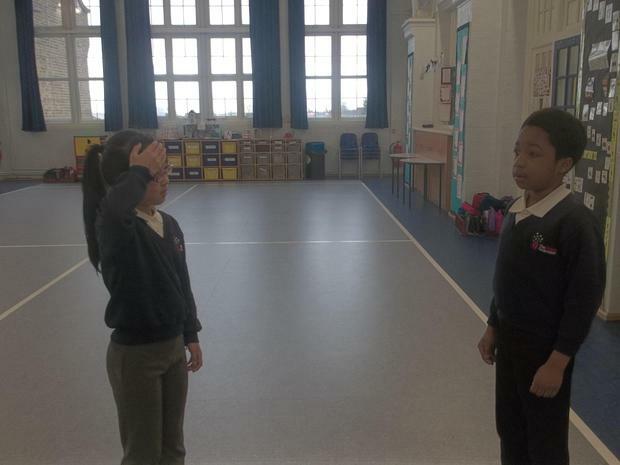 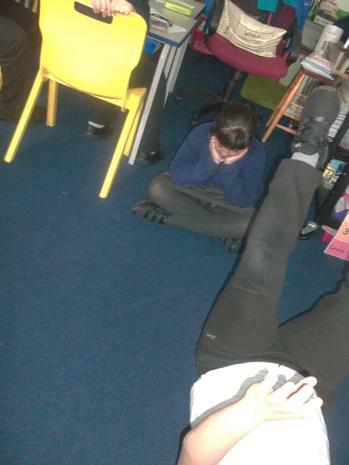 We have been using freeze frames and drama to find out about the different characters from the true story of Touching the Void. 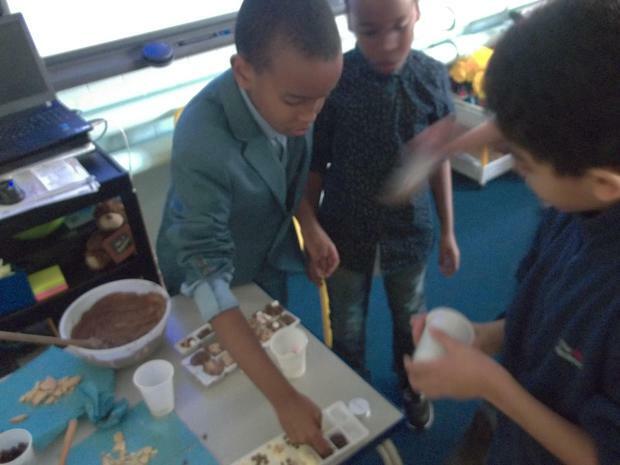 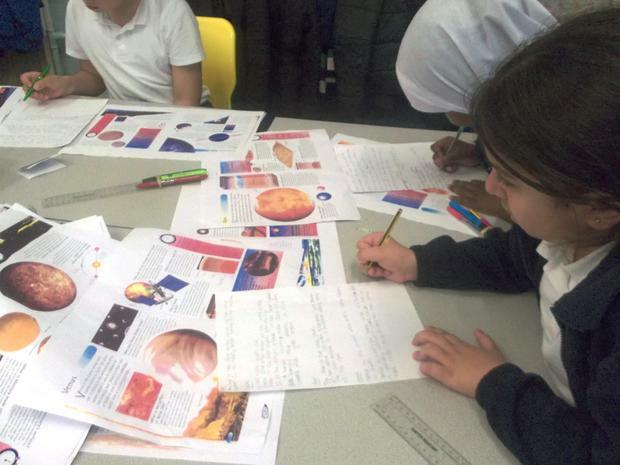 Year 5 will be starting their new science topic: Earth and beyond. 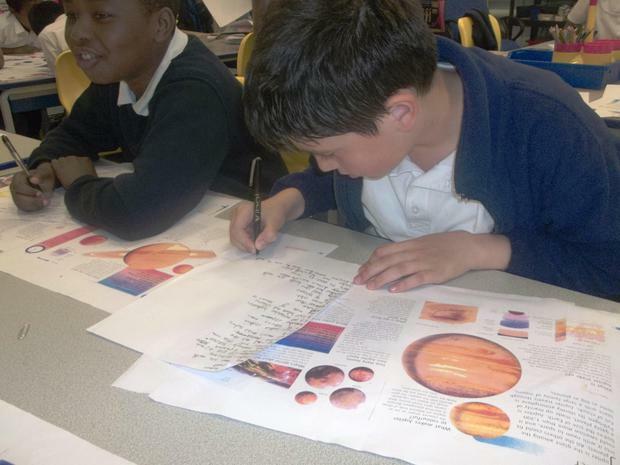 For this topic children will be learning about the different planets and finding out about how the sun and moon works. 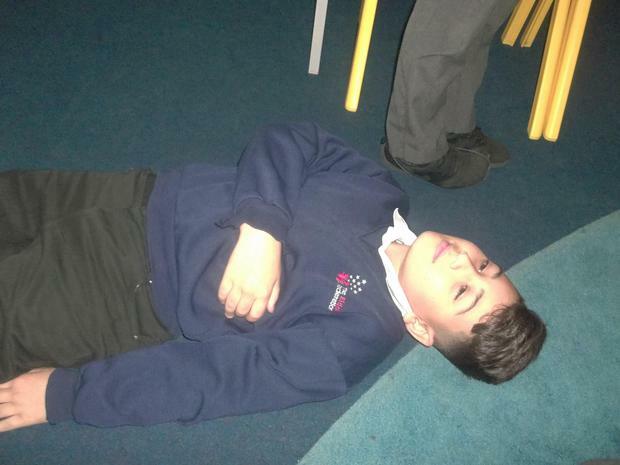 We will be learning about day and night and drawing conclusions from different findings. 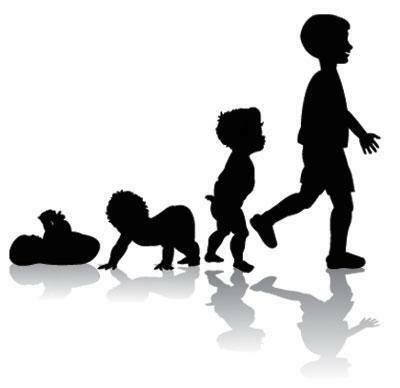 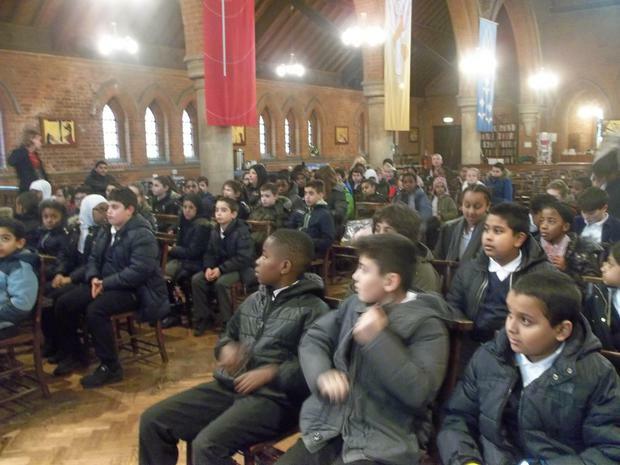 For this topic children will need to do a lot of research at home to prepare themselves. 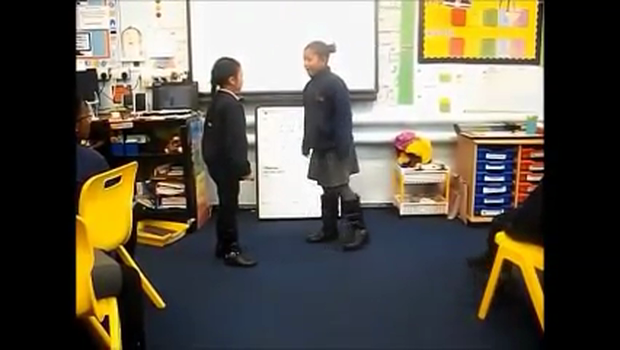 Here is a video to learn about the order of the plants. 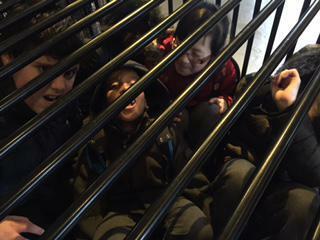 It's fun and everyone can join in. 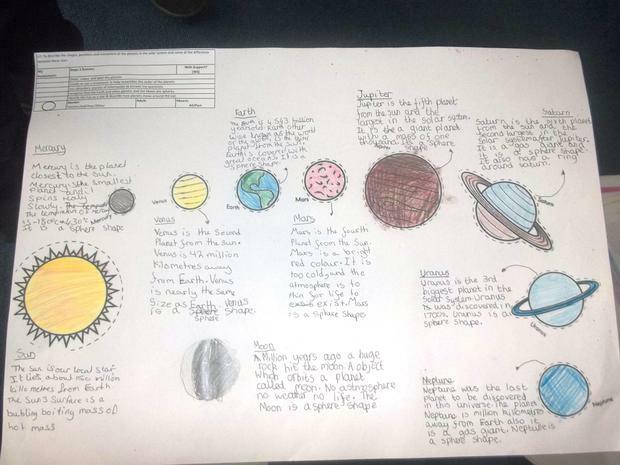 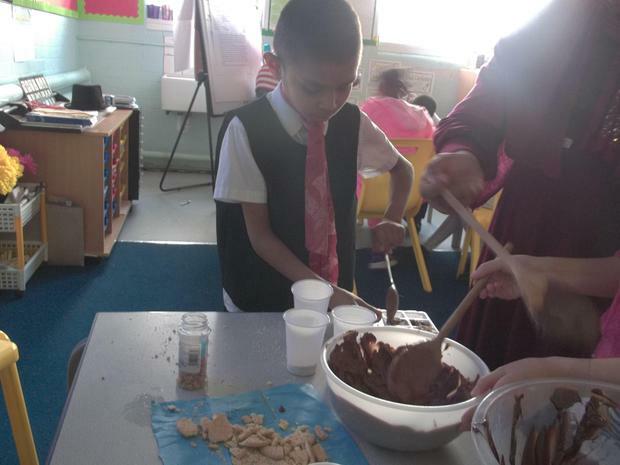 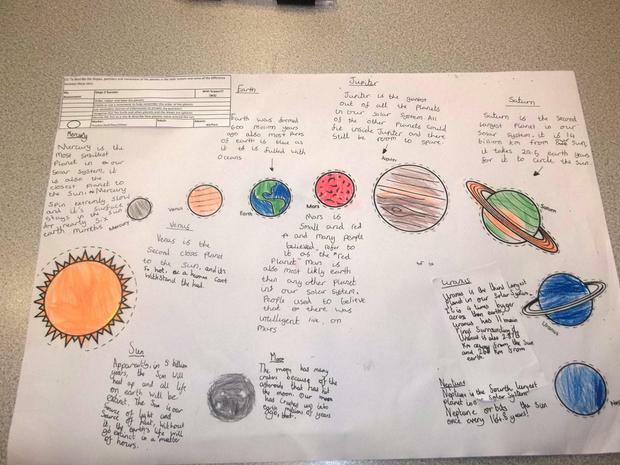 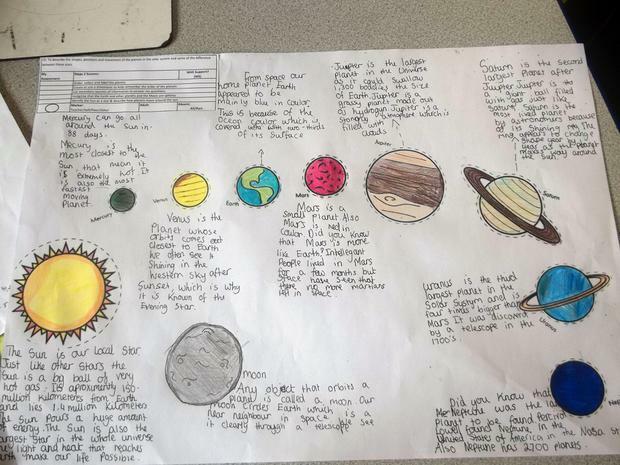 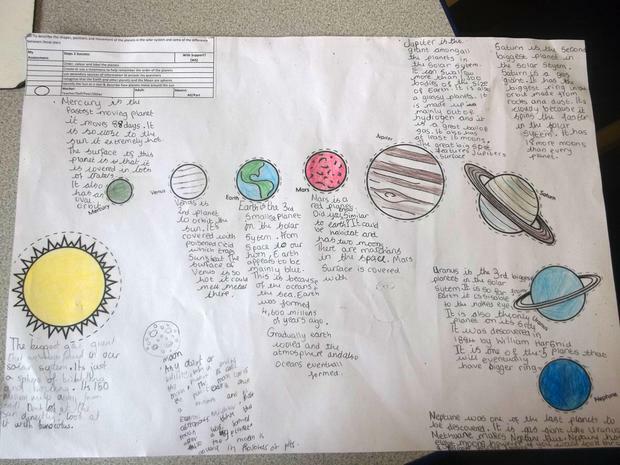 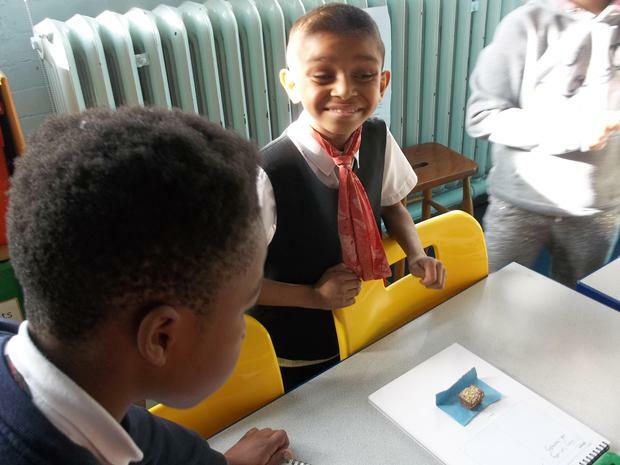 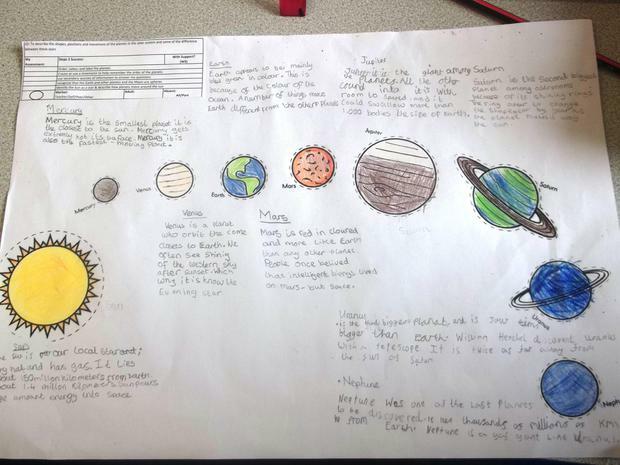 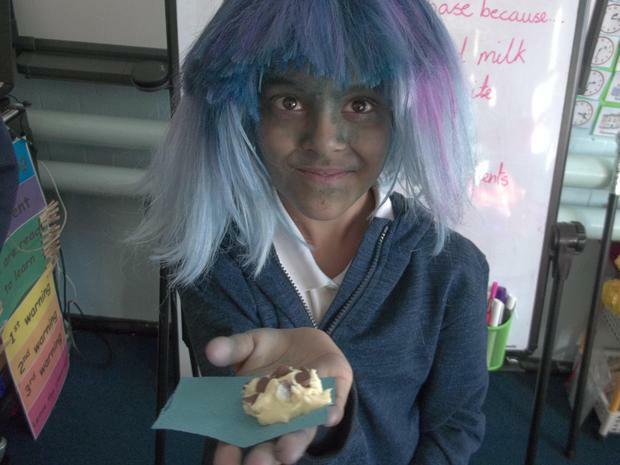 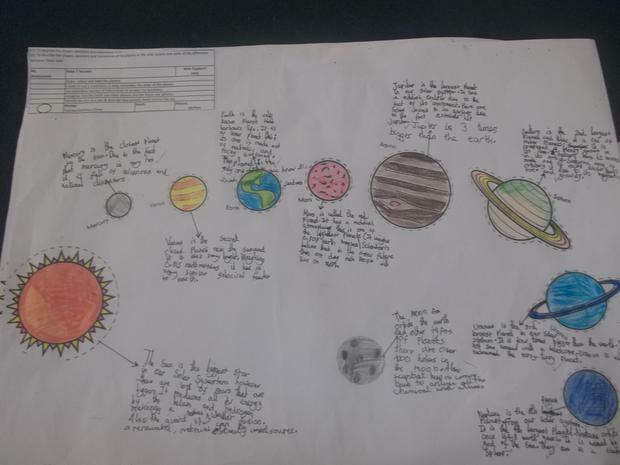 We have been learning about the solar system in our science lessons. 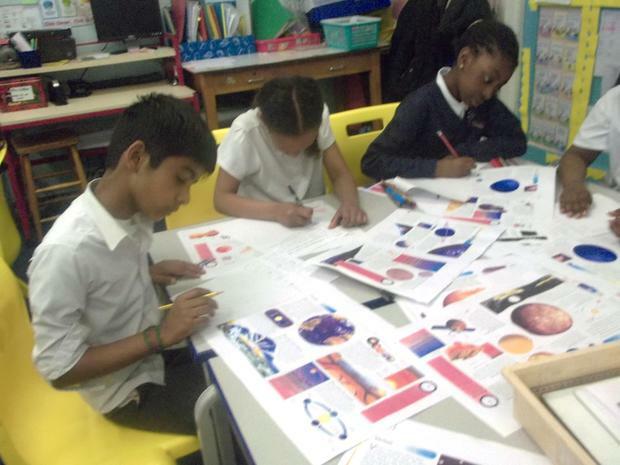 We have been using our note taking skills from English to create beautiful posters. 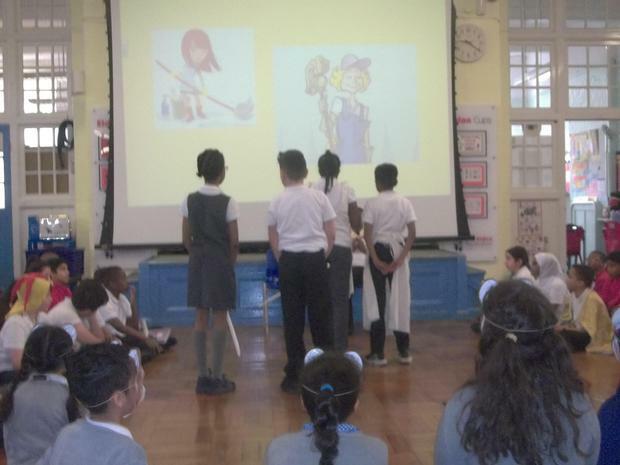 Look at some examples here. 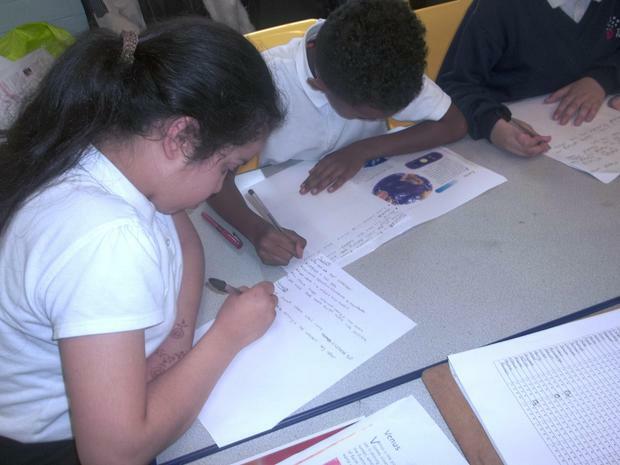 Next week children will be learning how to write an evaluative report. 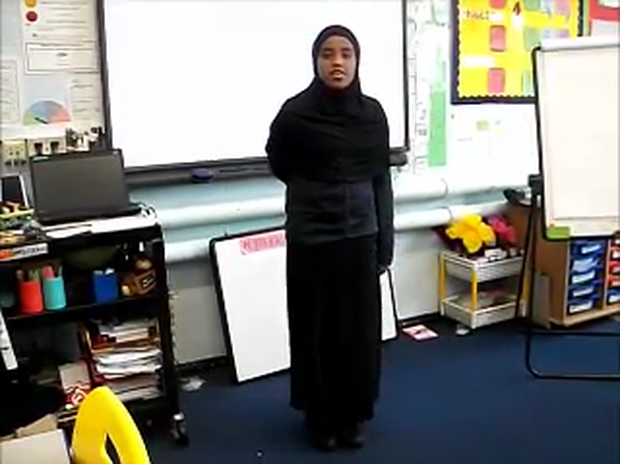 Watch these videos and find out about how mountaineers hike and what they need with them to keep safe. 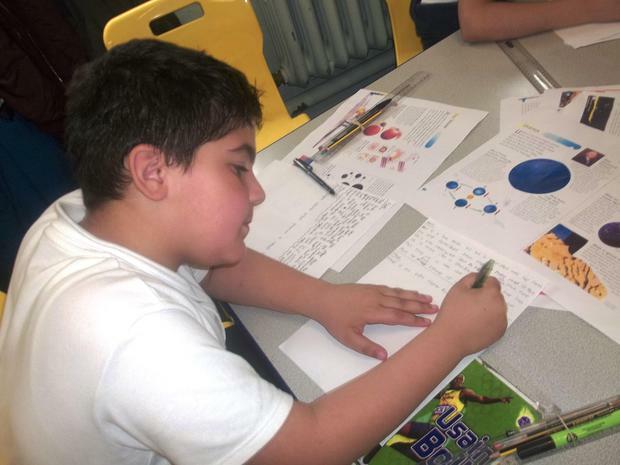 Research about different mountain ranges and why people like to visit those places. 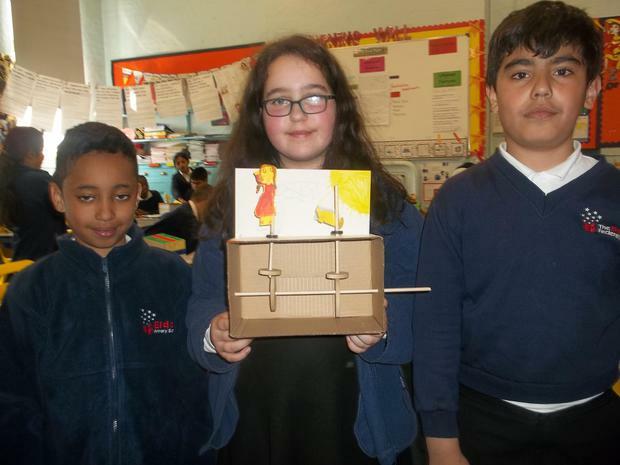 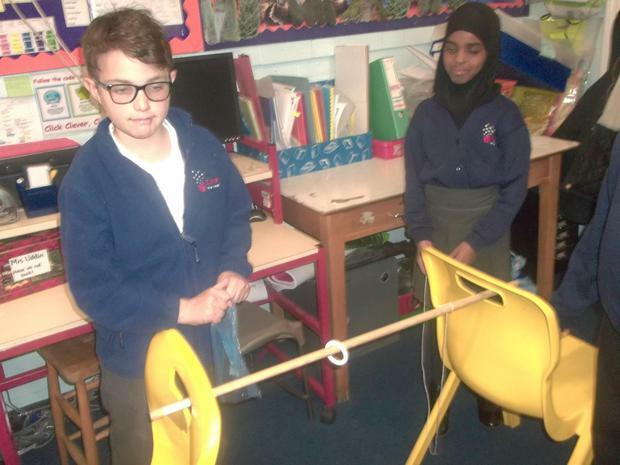 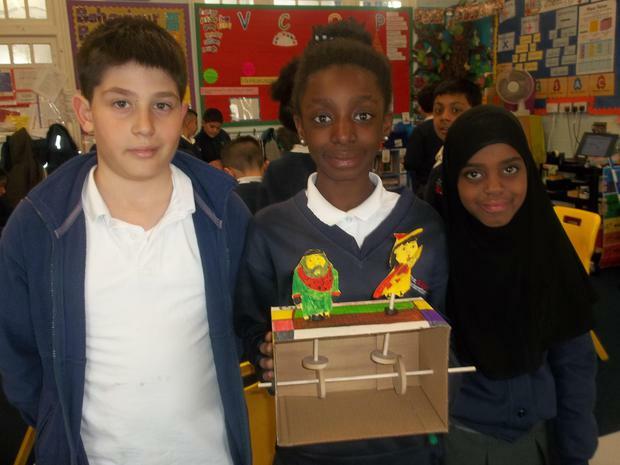 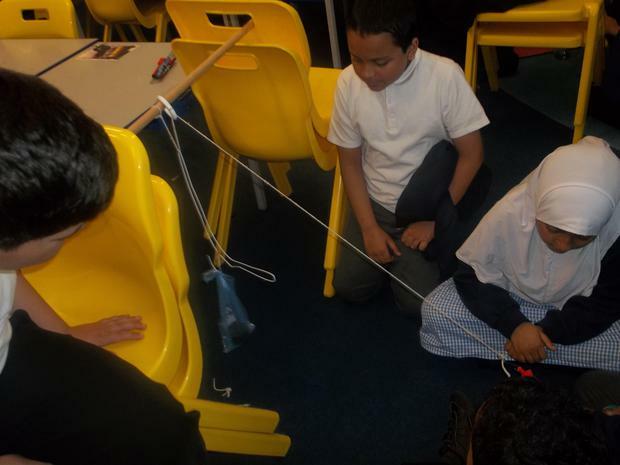 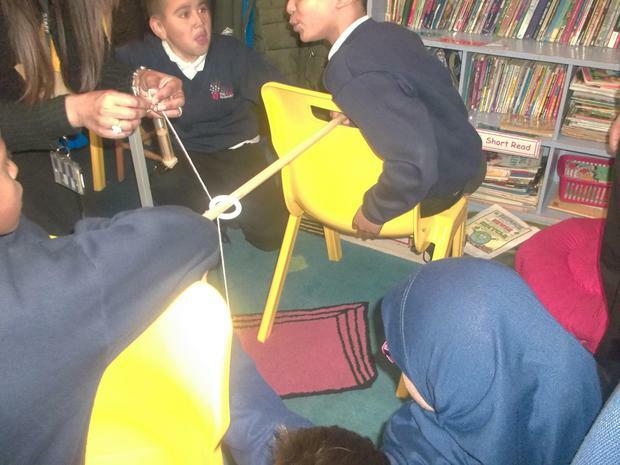 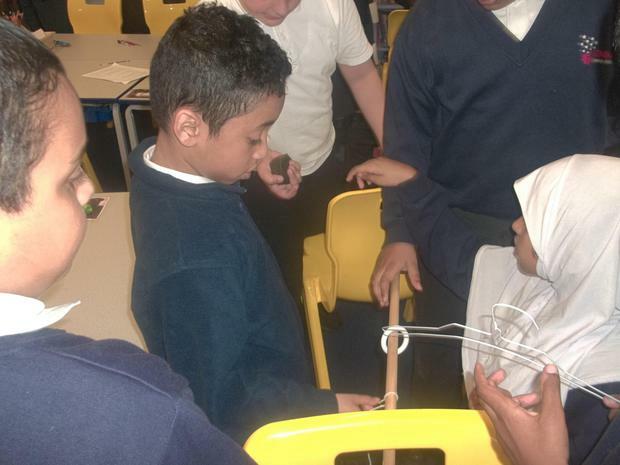 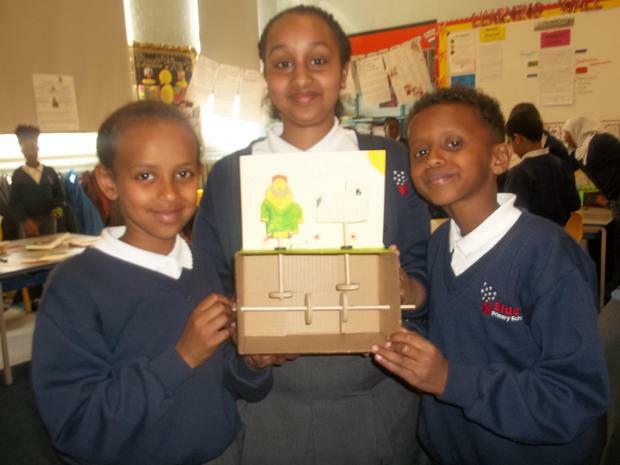 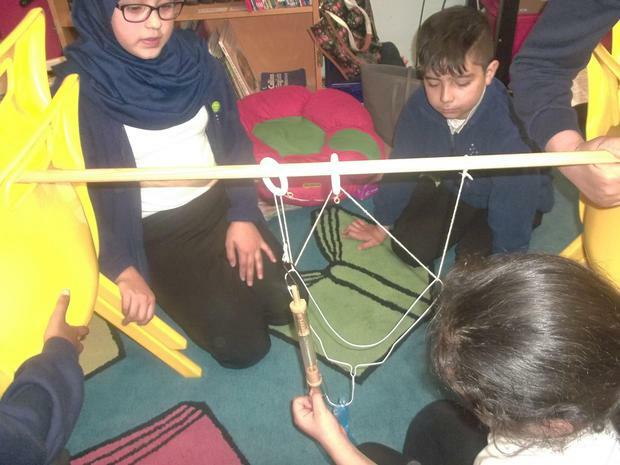 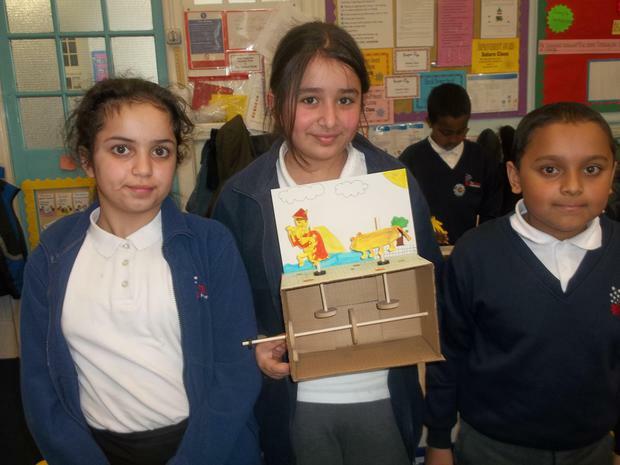 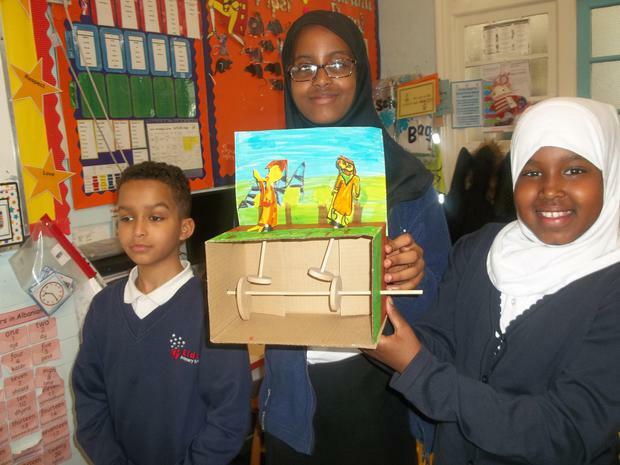 This week Year 5 have been working on making pulleys to lift a heavy load. 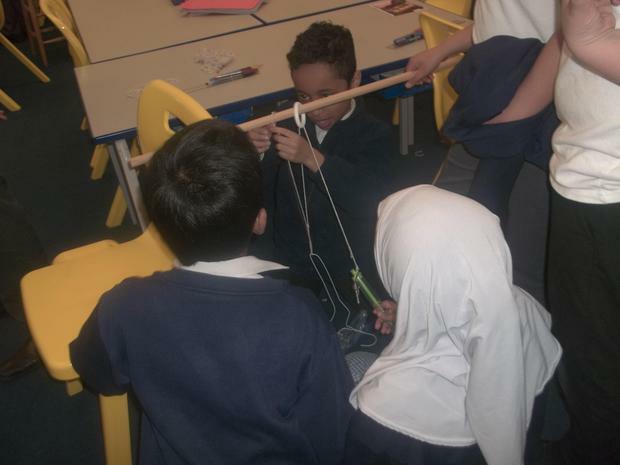 We learnt that very heavy loads can be lifted using pulleys. 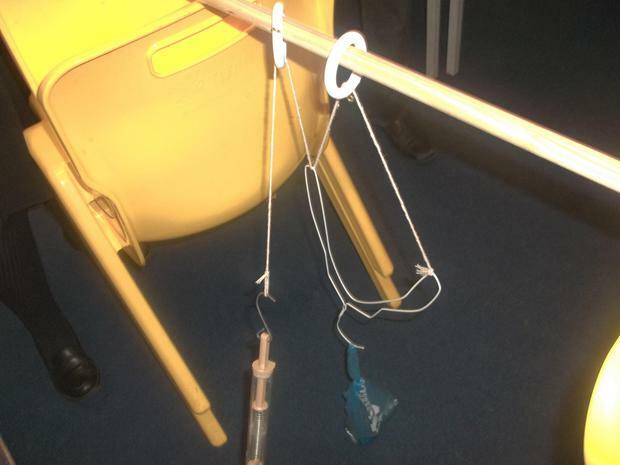 We first made a simple pulley to lift 500g, then we used 3 and finally used 4 pulleys. 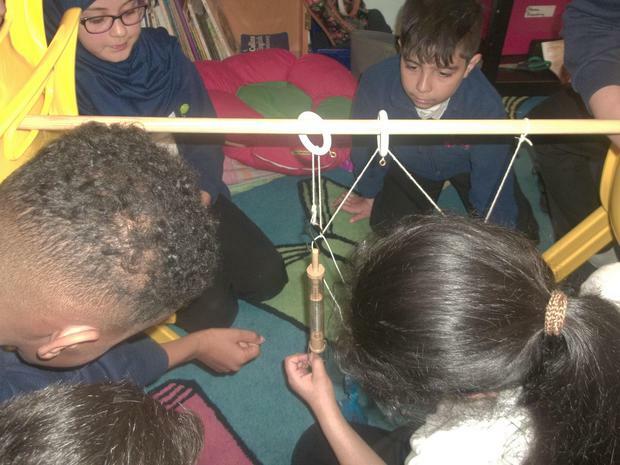 We found out that the more pulleys we used, it was easier to lift the load, however we had to pull the string 3x, 4x as much depending on the number of pulleys. 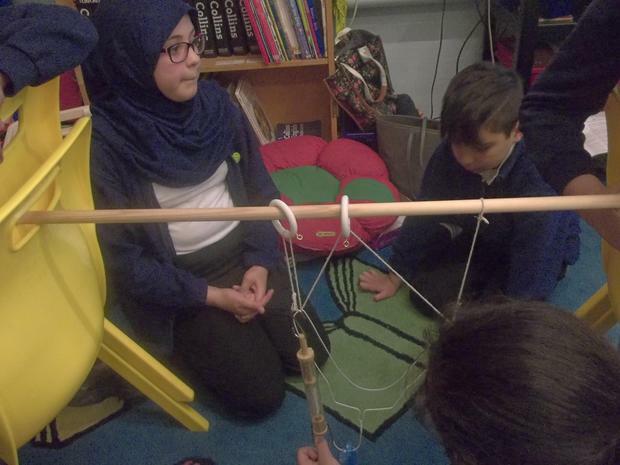 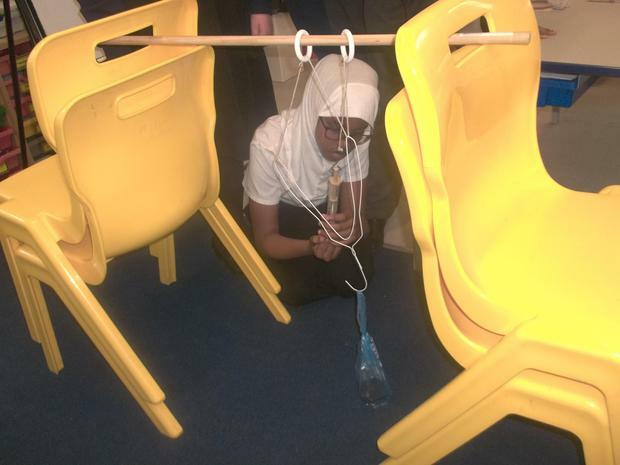 The conclusion was: Pulleys make life easier but the amount of time needed may increase as you need to put more effort into it. 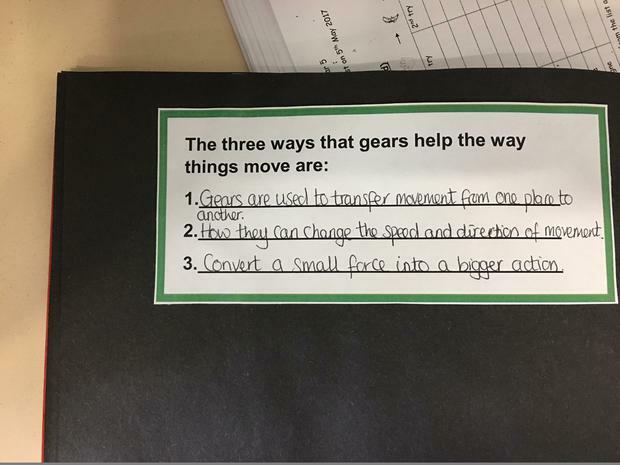 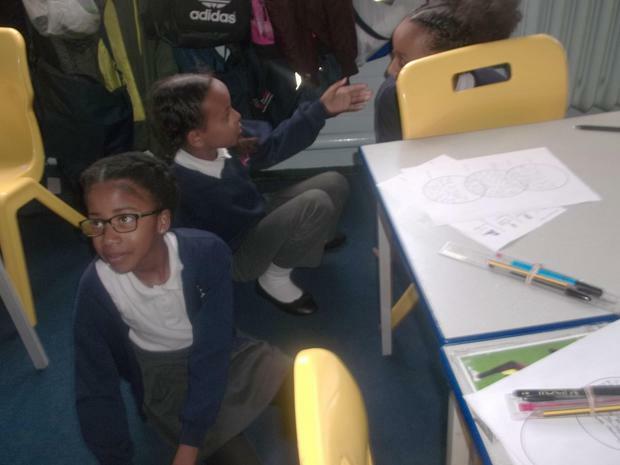 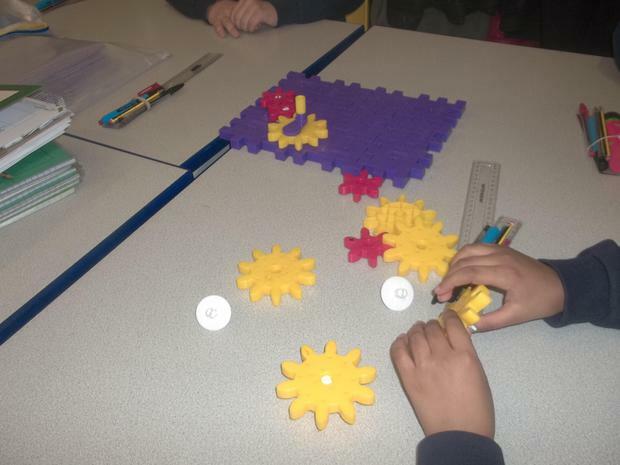 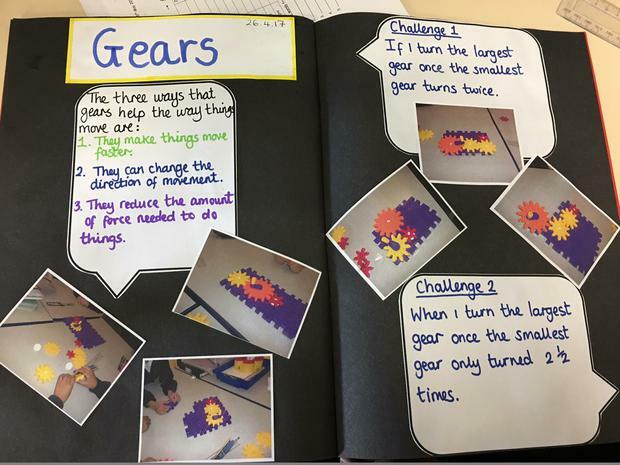 Last week Year 5 had worked on looking at how gears help to make tasks easier. 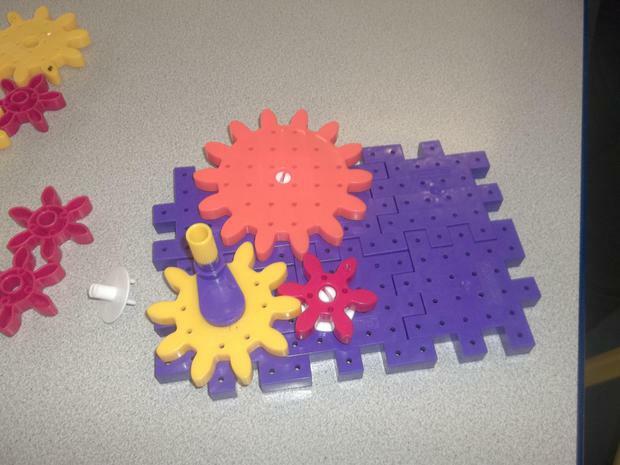 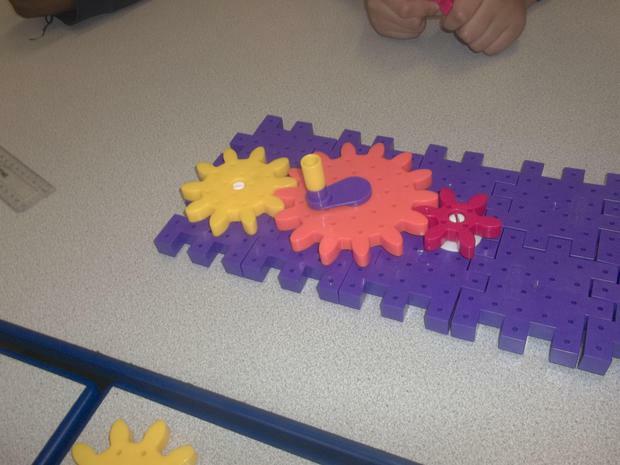 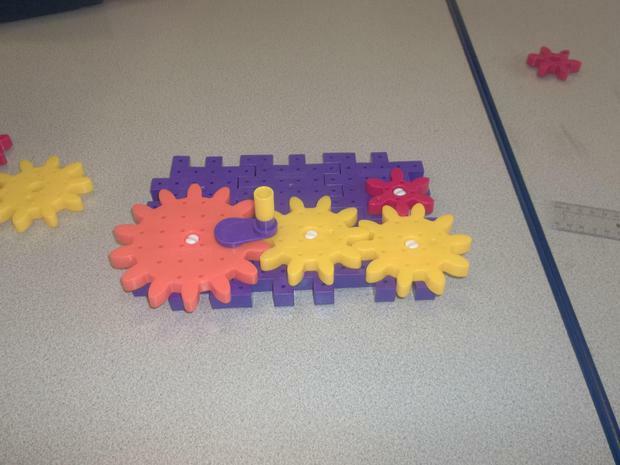 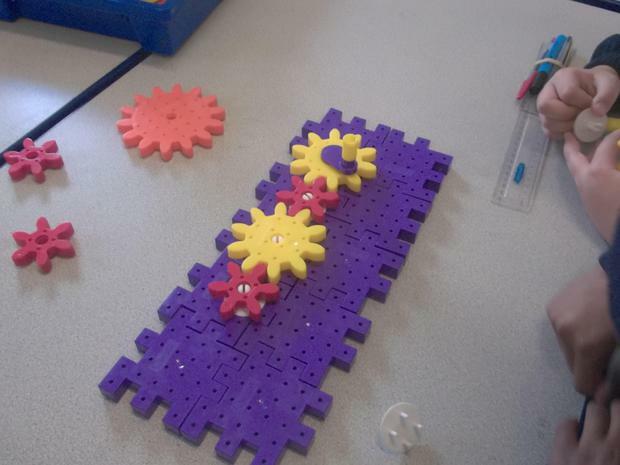 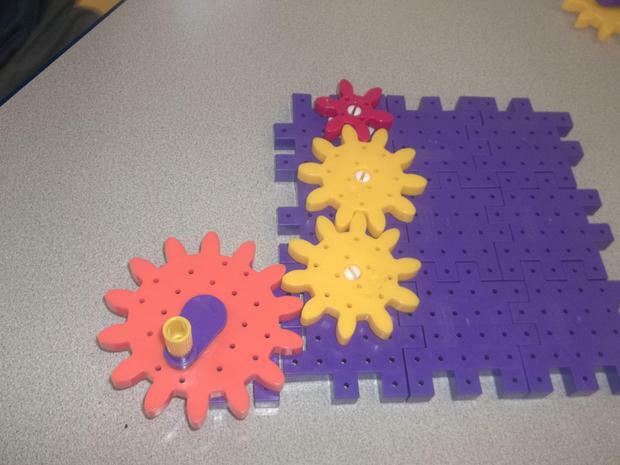 They were able to use different gears with different number of cogs to find how they can make movement more easy. 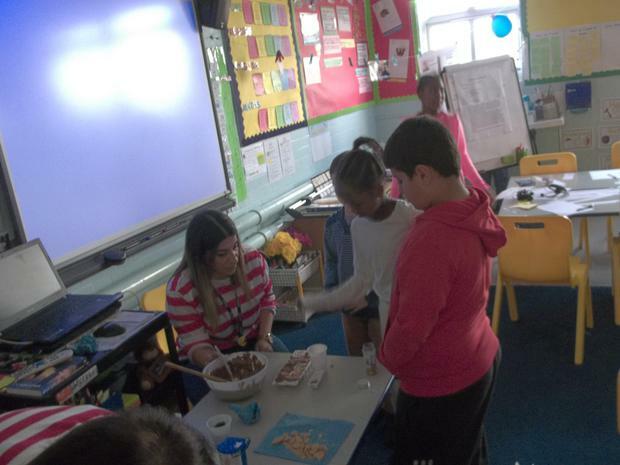 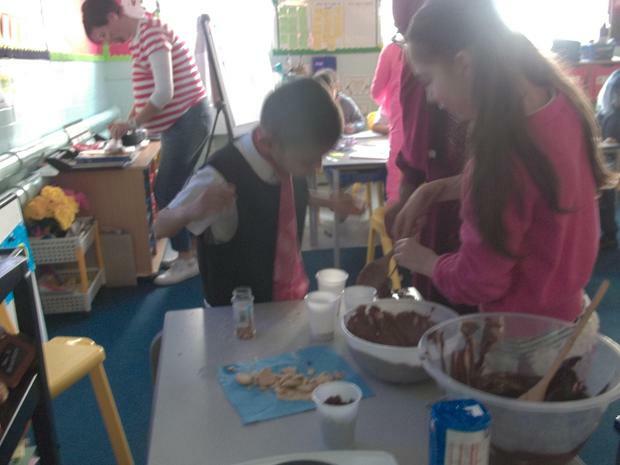 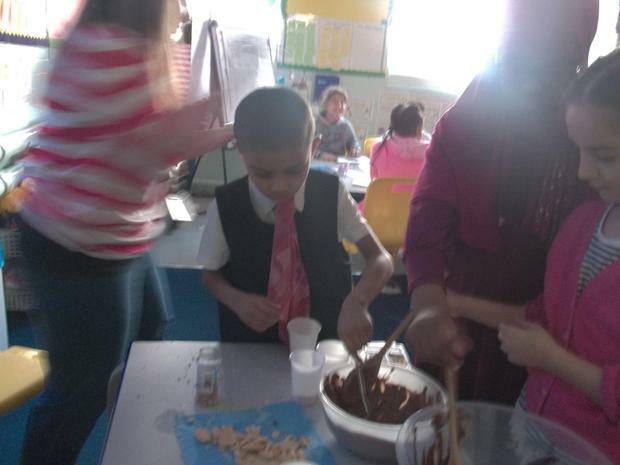 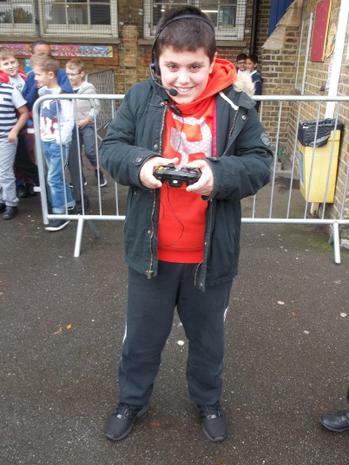 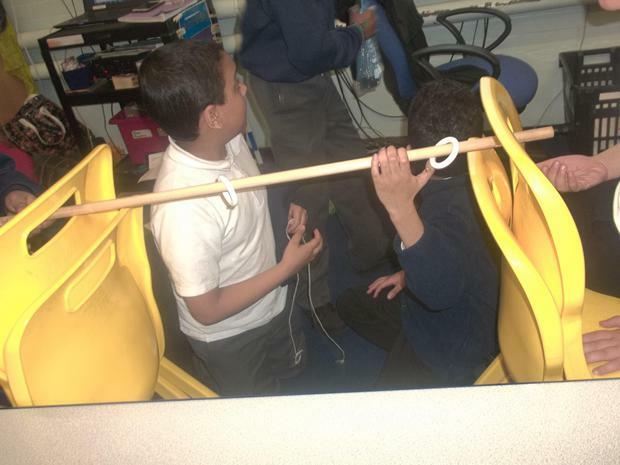 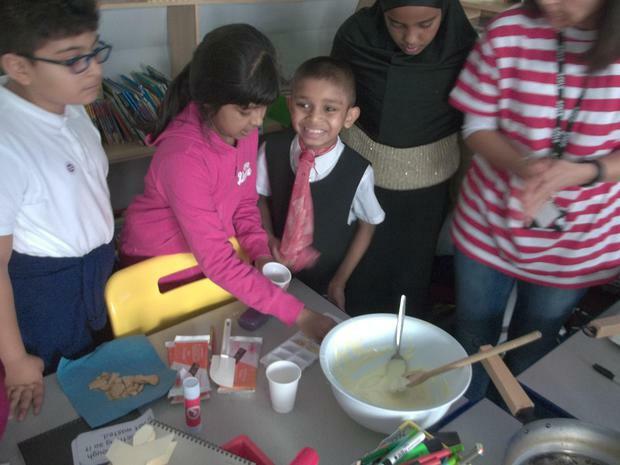 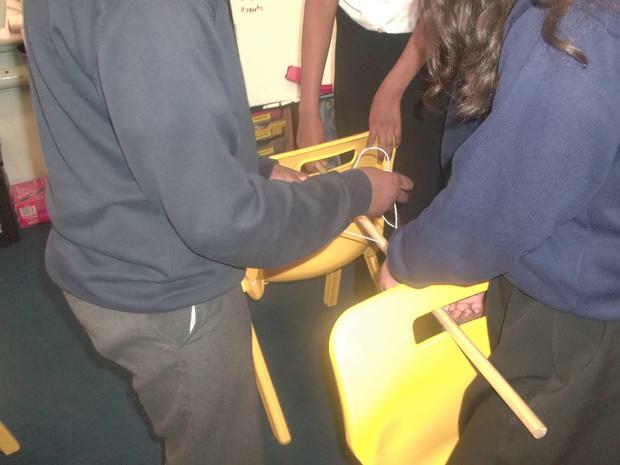 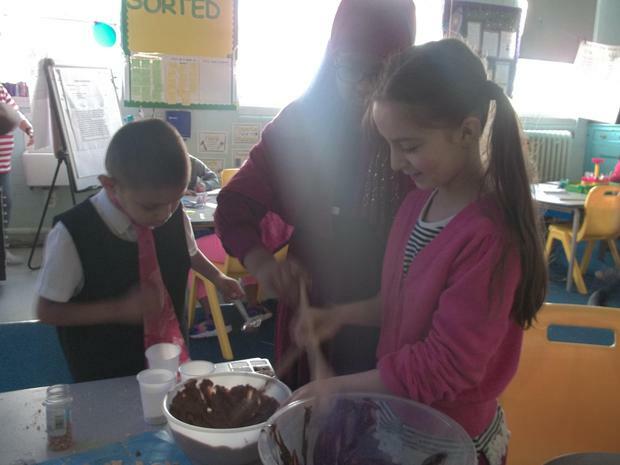 This was a challenging task and they found out that some of the challenges were very tricky and required team effort. 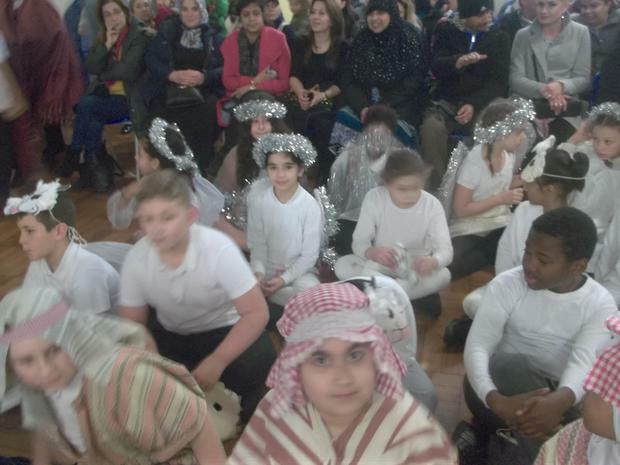 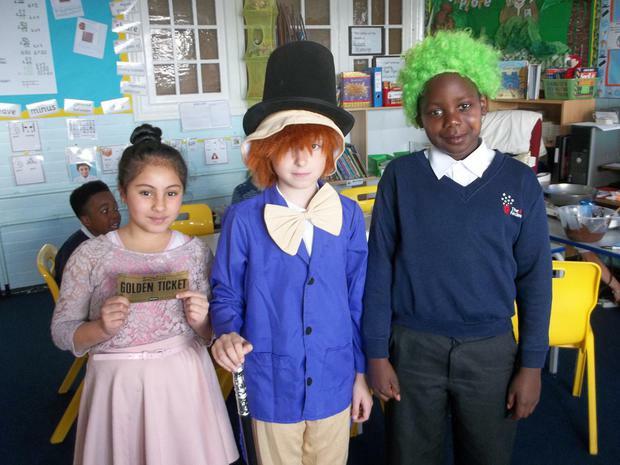 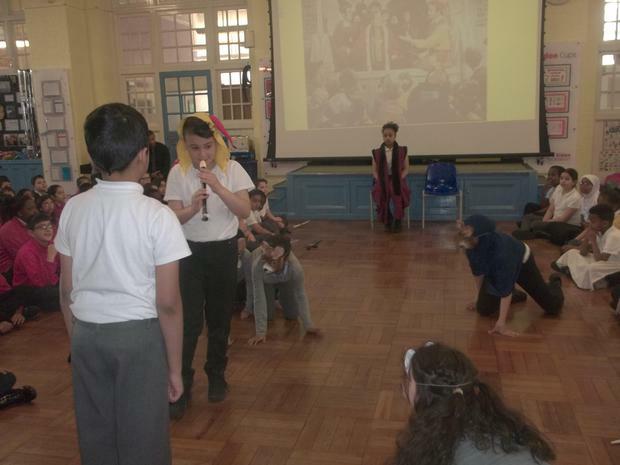 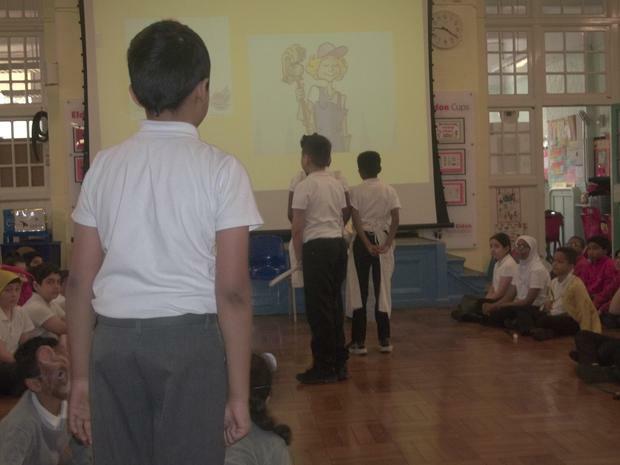 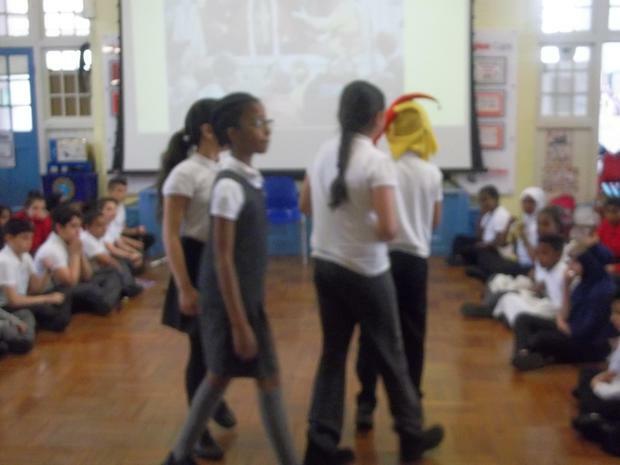 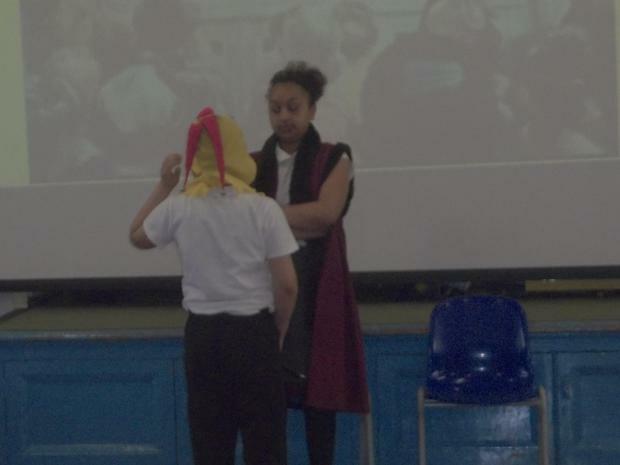 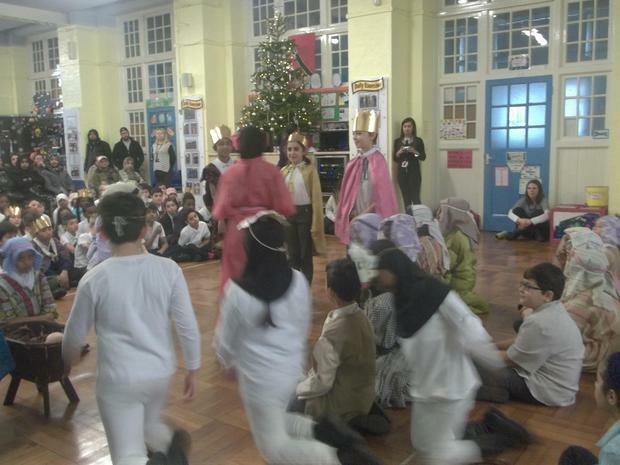 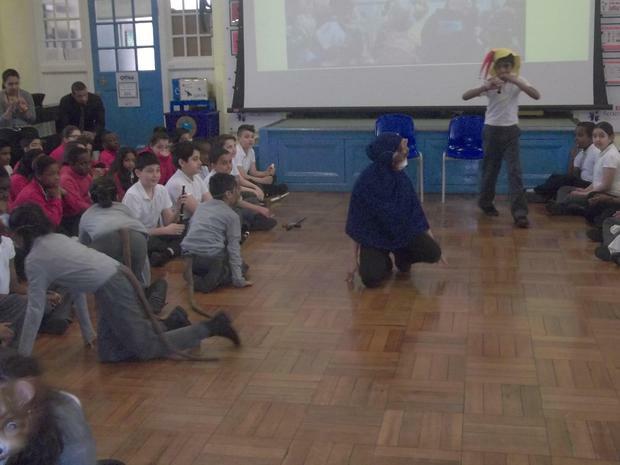 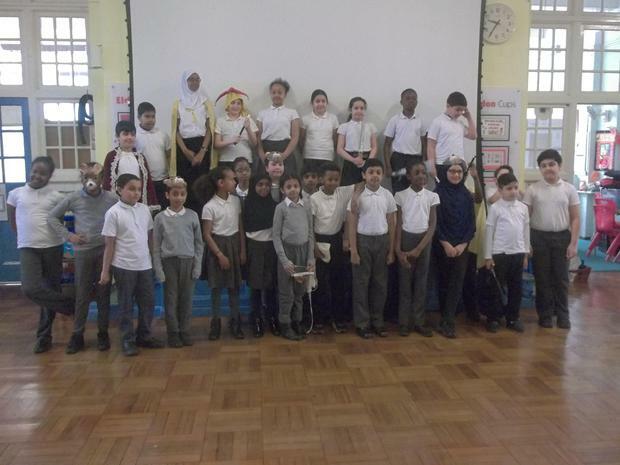 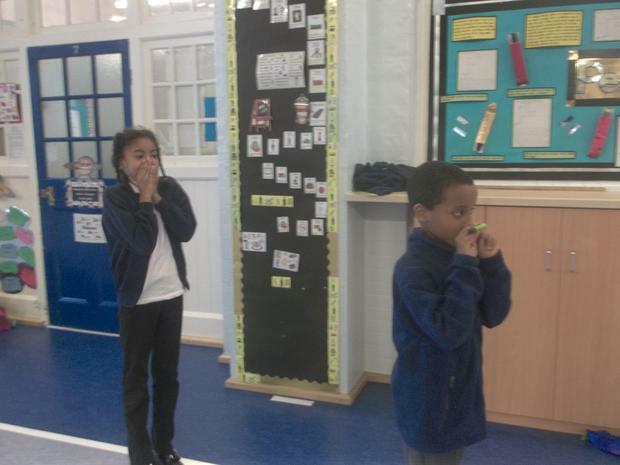 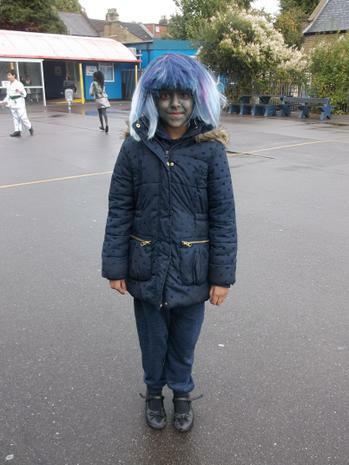 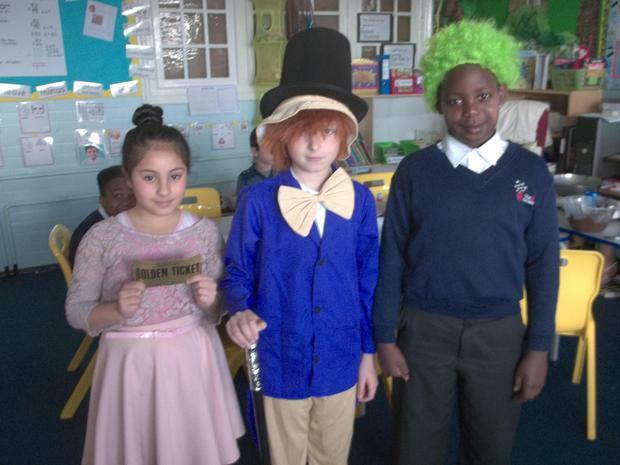 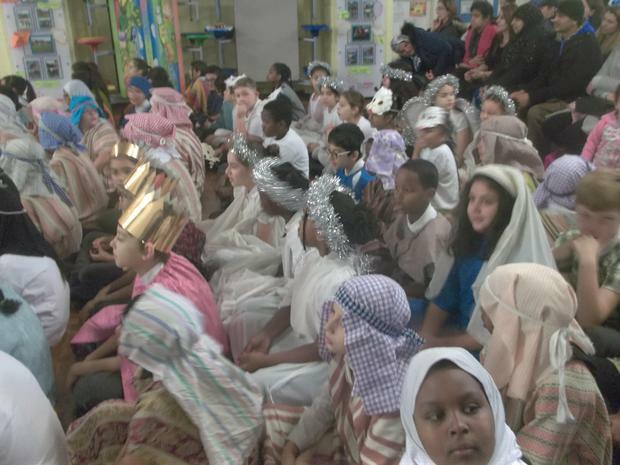 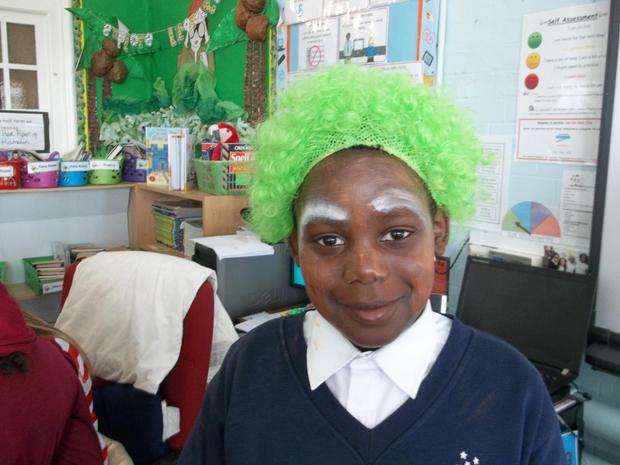 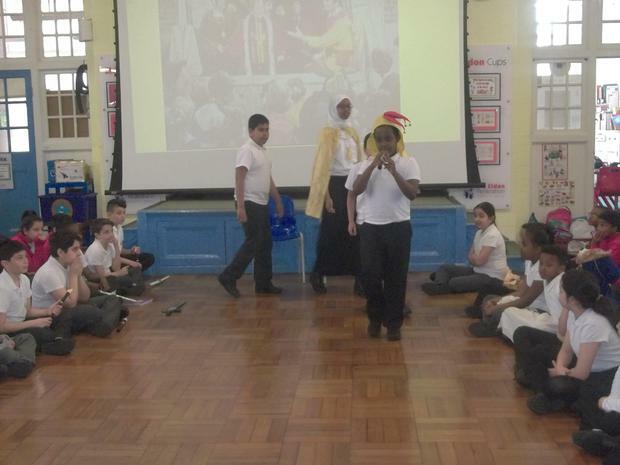 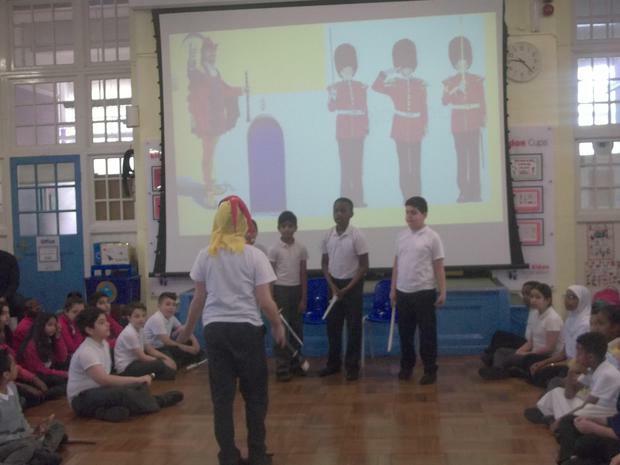 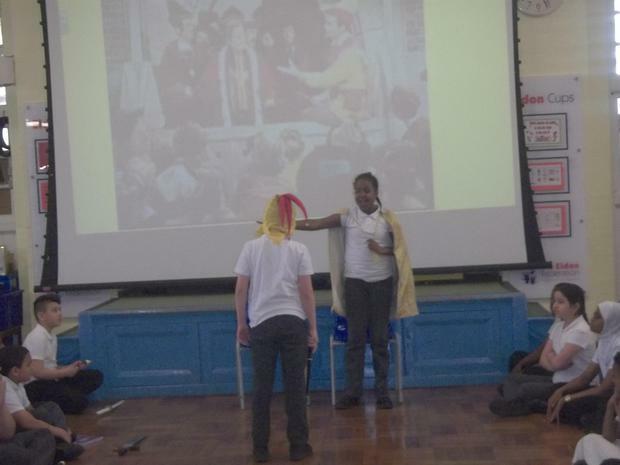 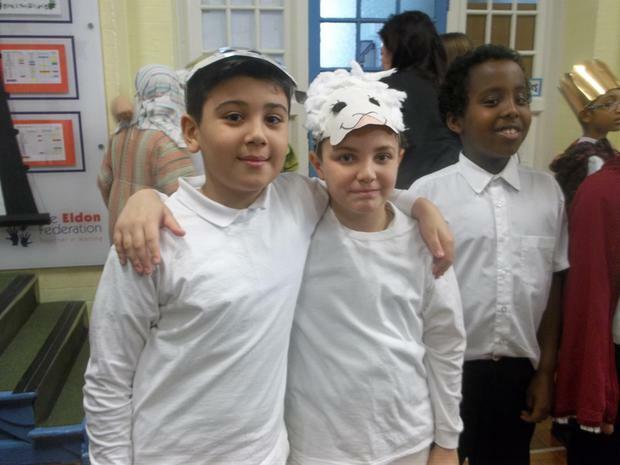 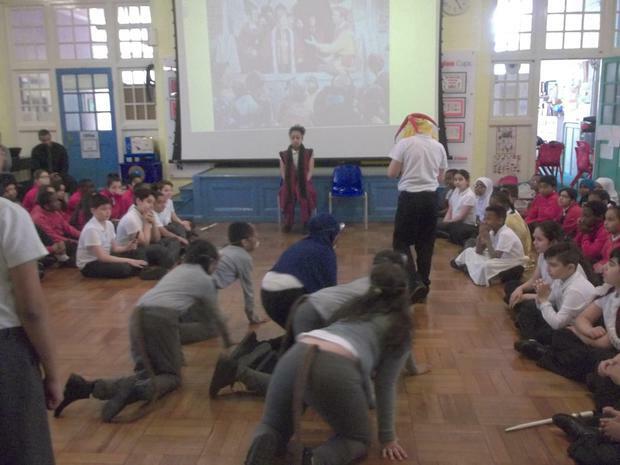 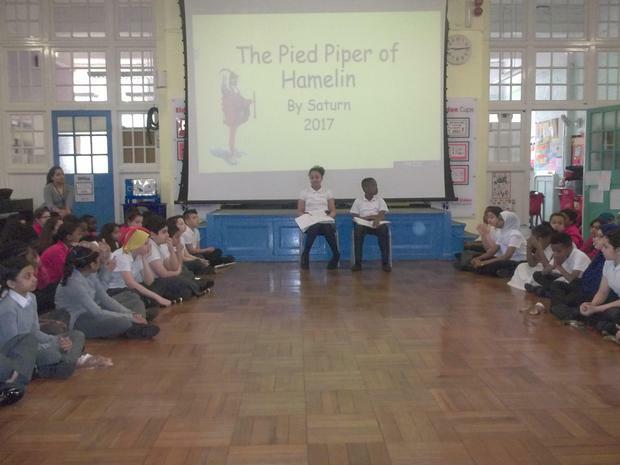 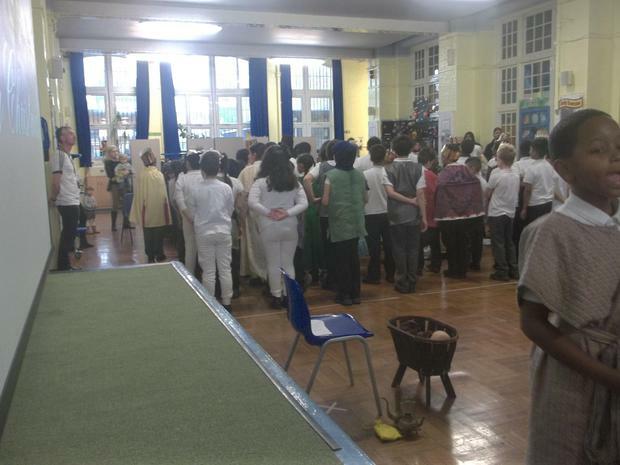 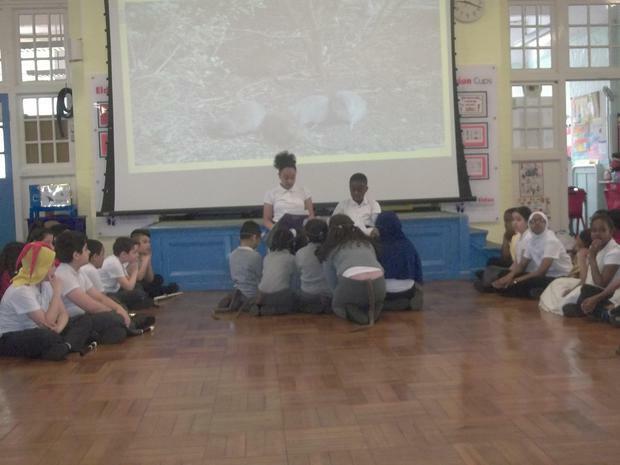 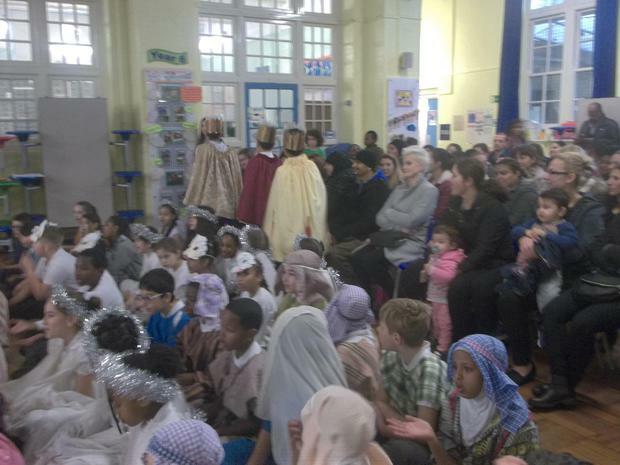 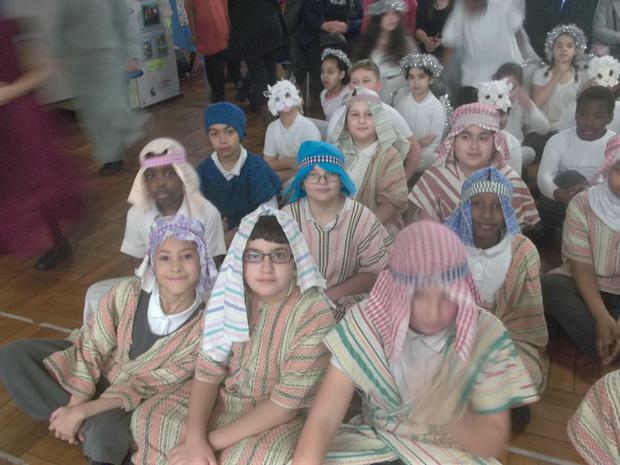 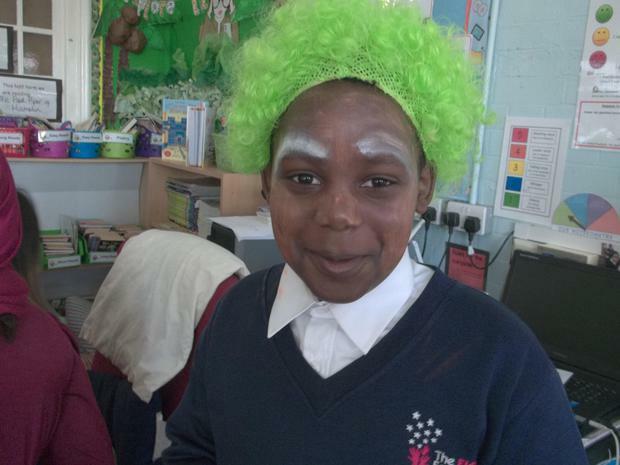 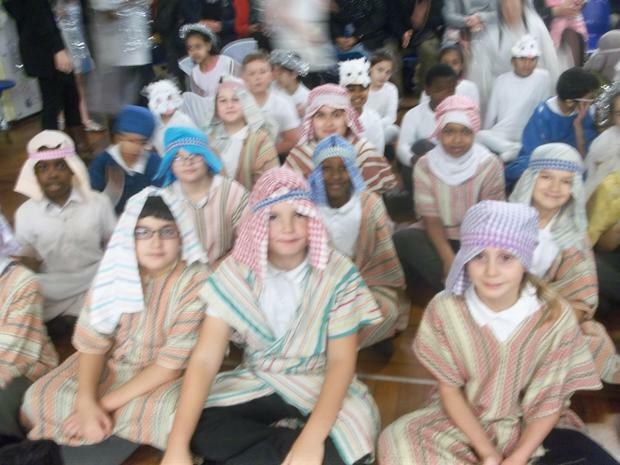 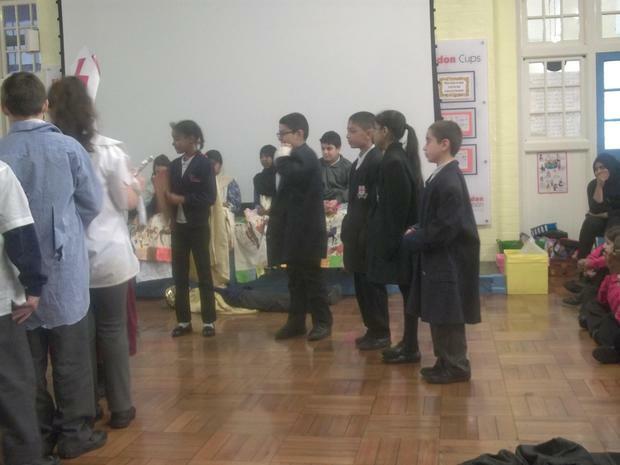 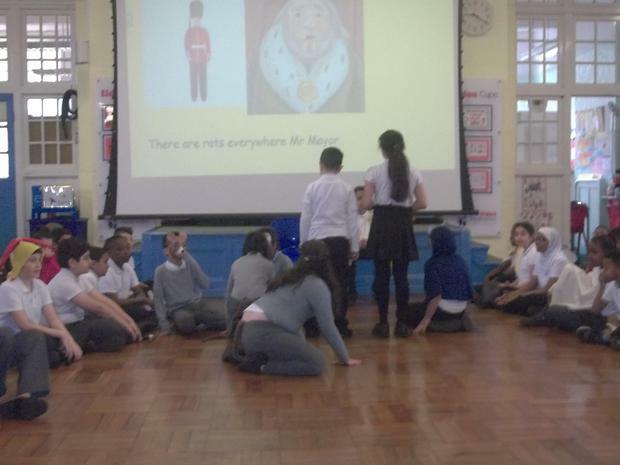 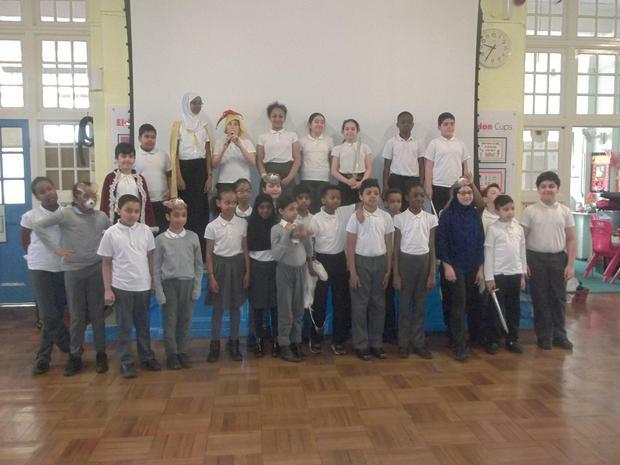 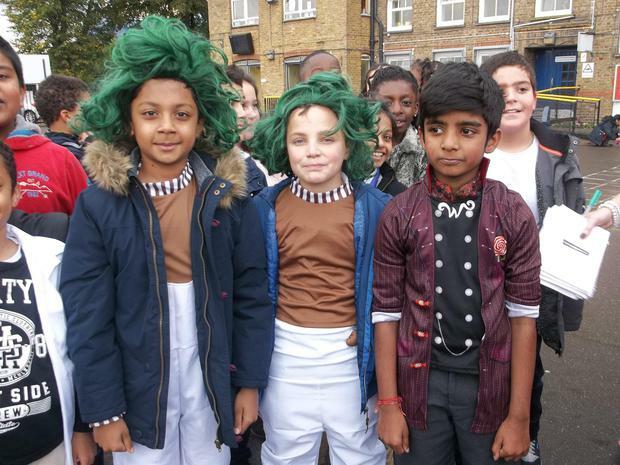 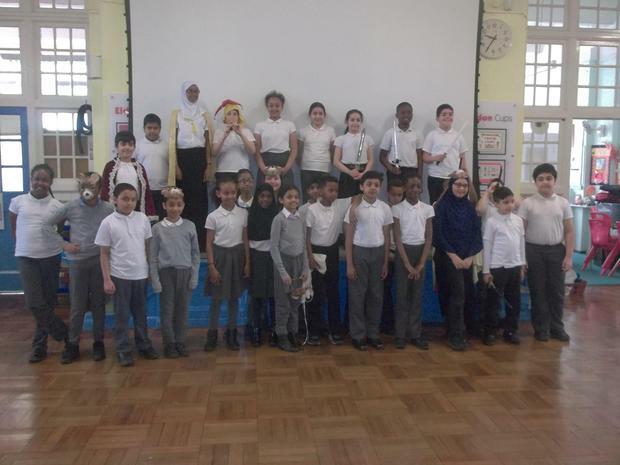 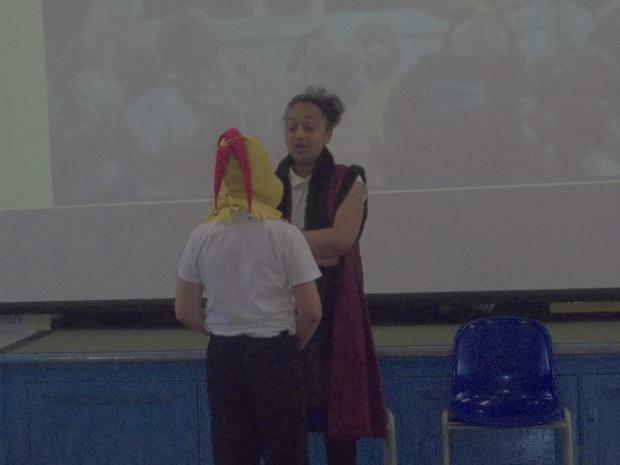 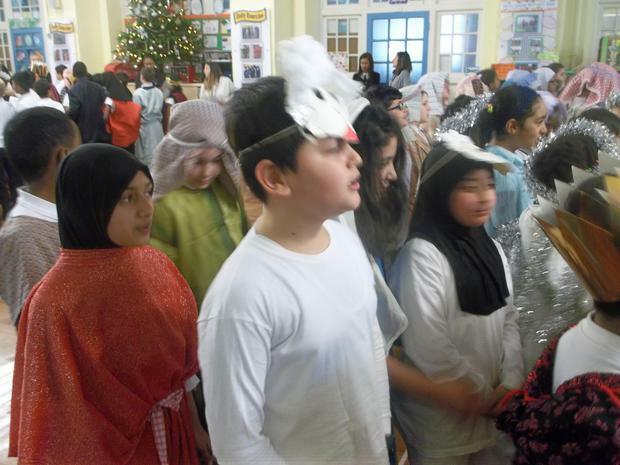 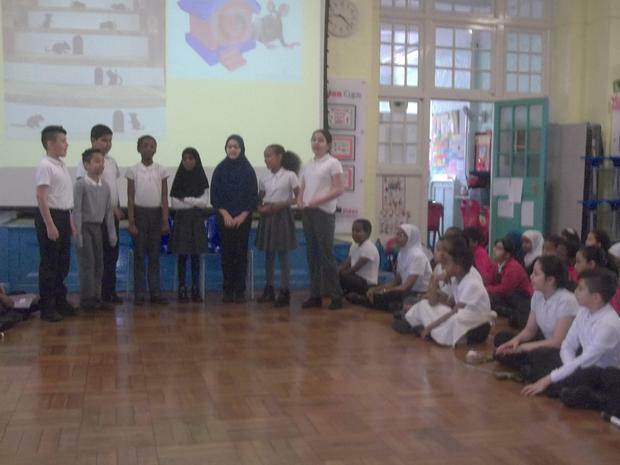 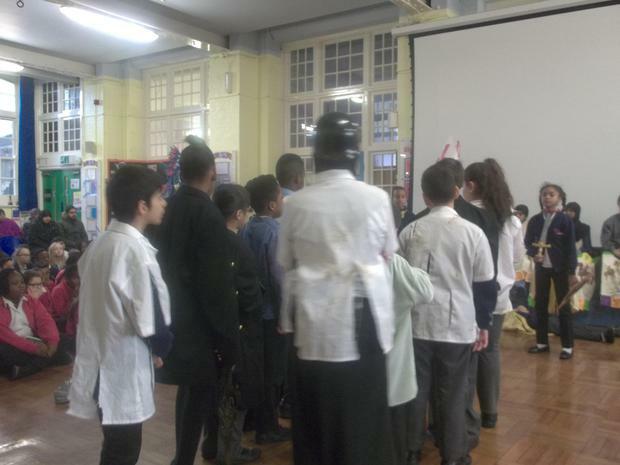 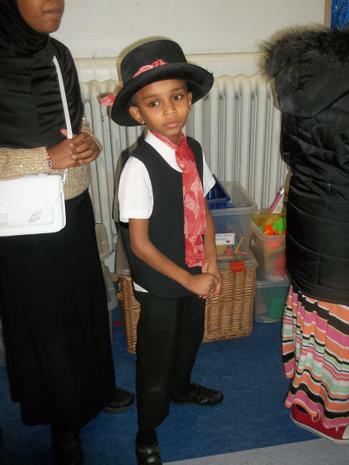 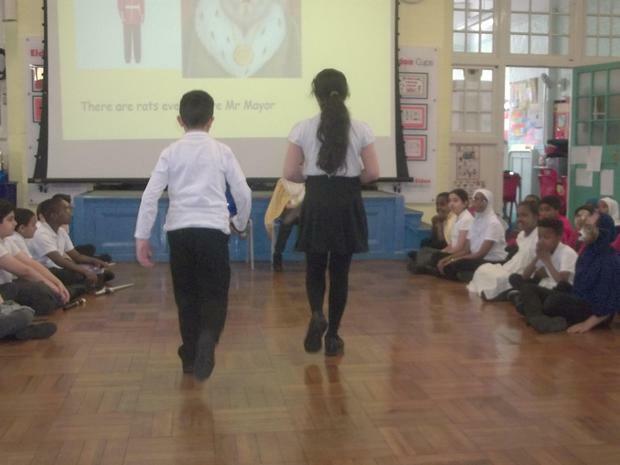 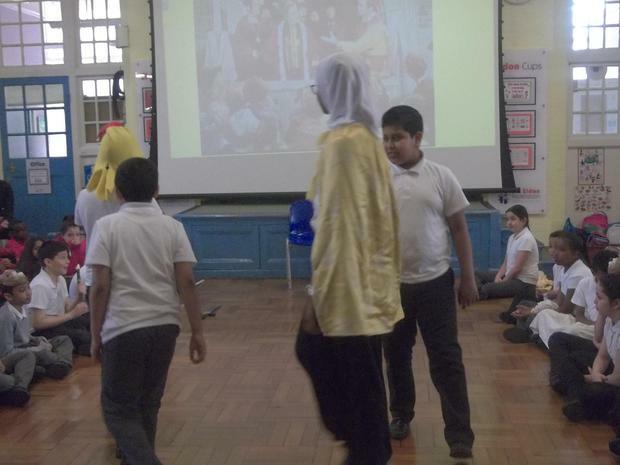 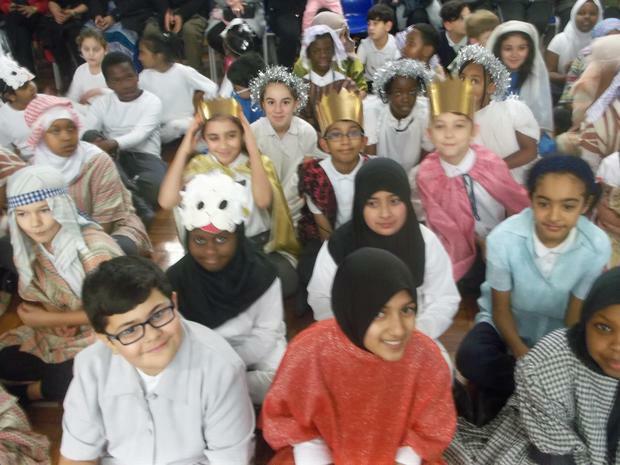 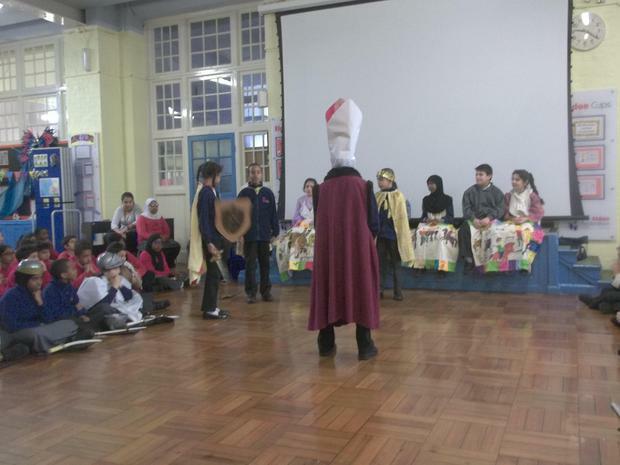 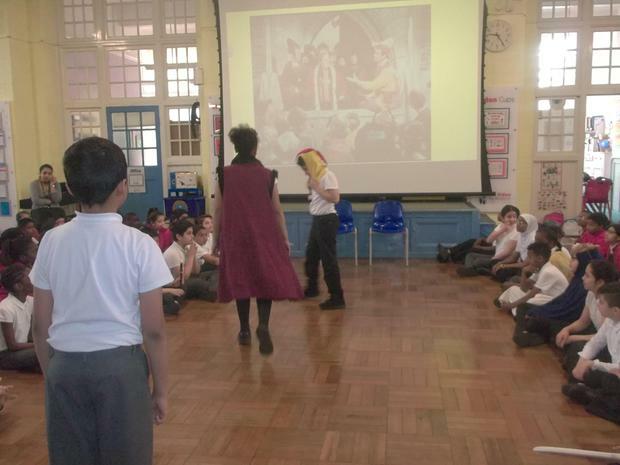 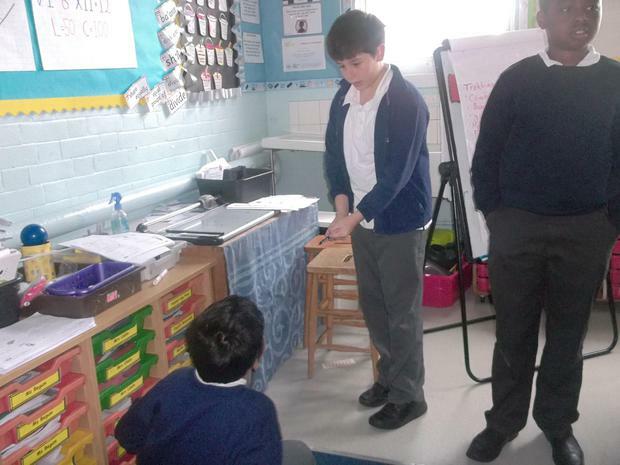 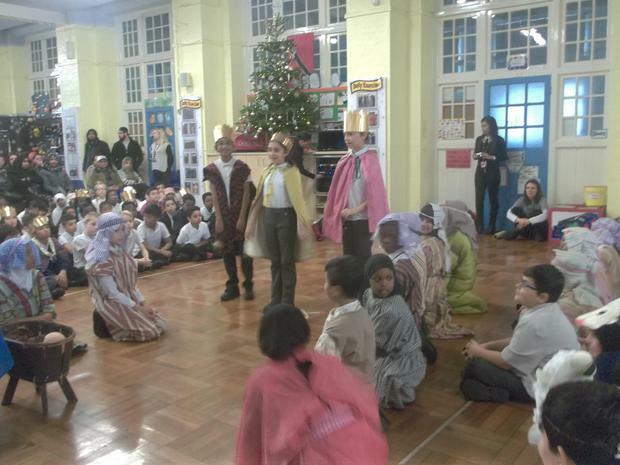 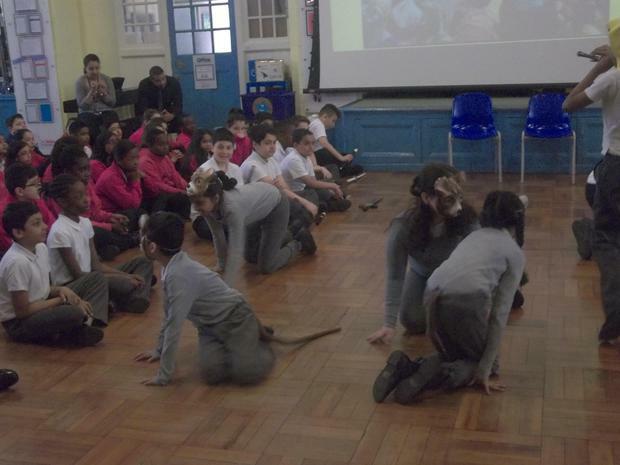 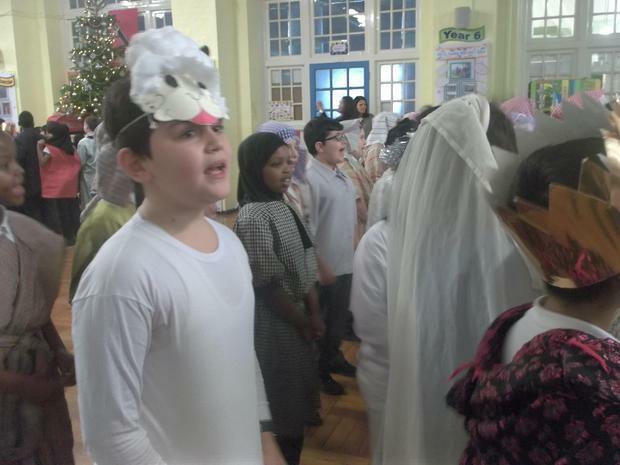 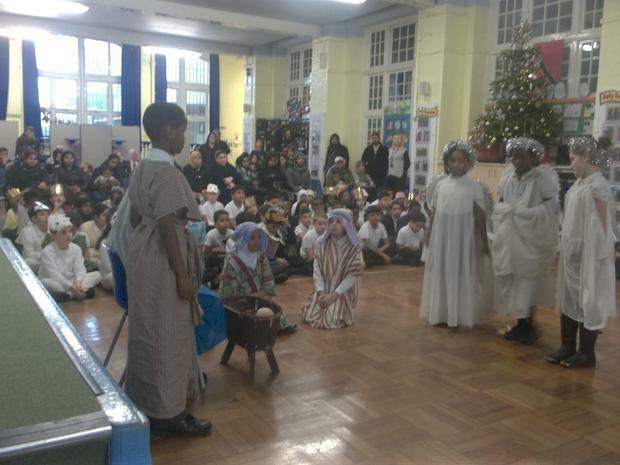 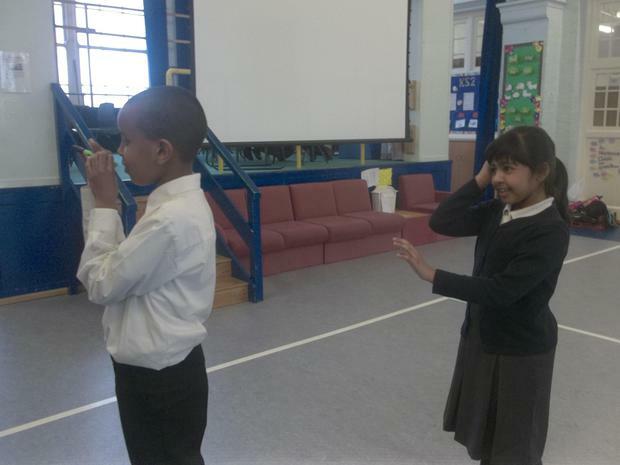 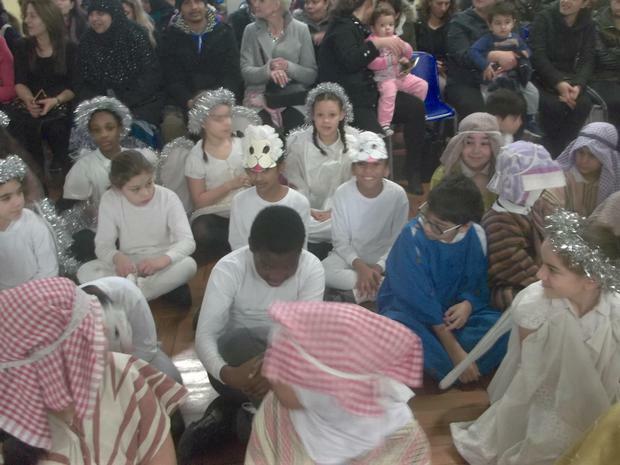 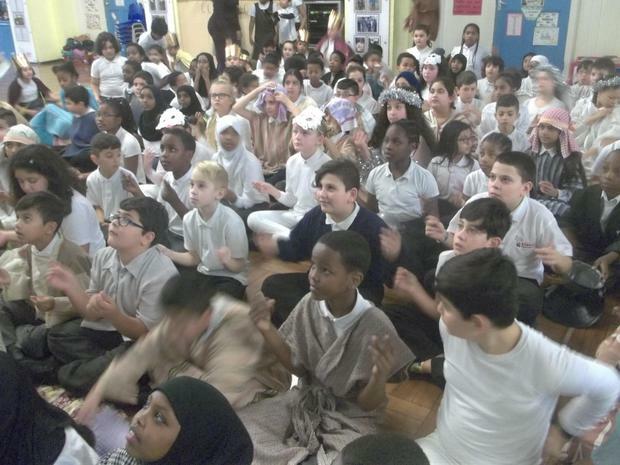 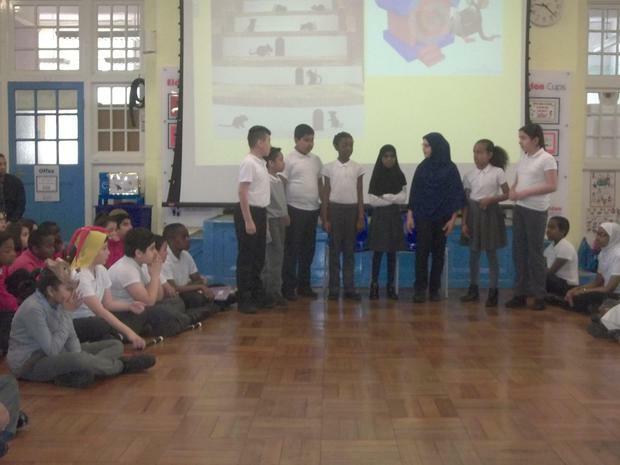 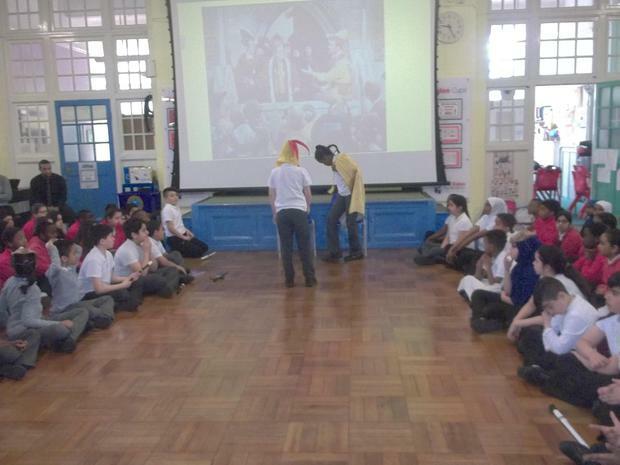 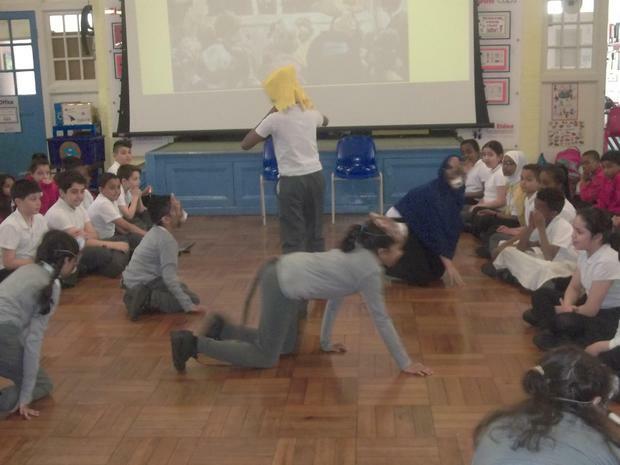 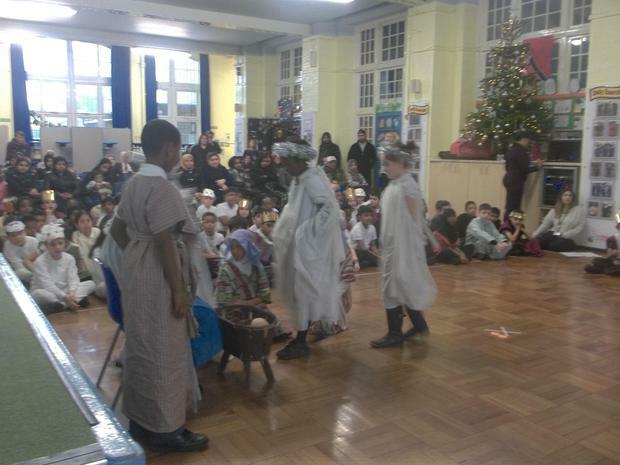 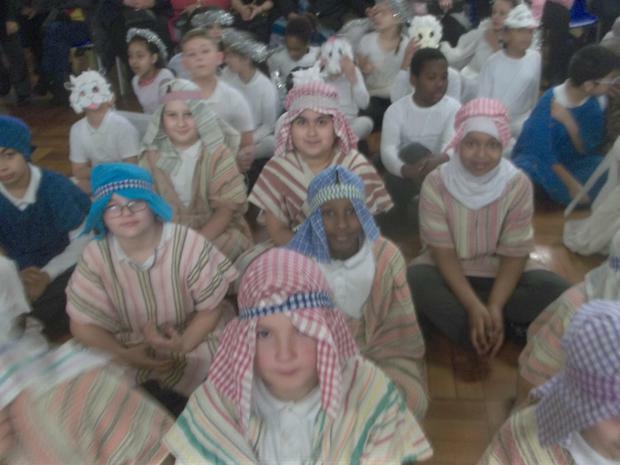 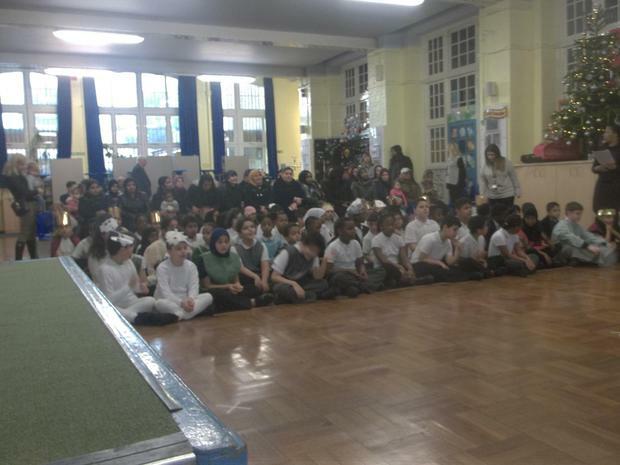 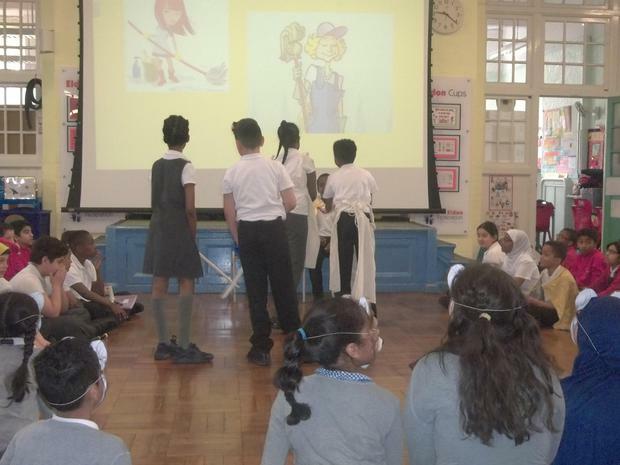 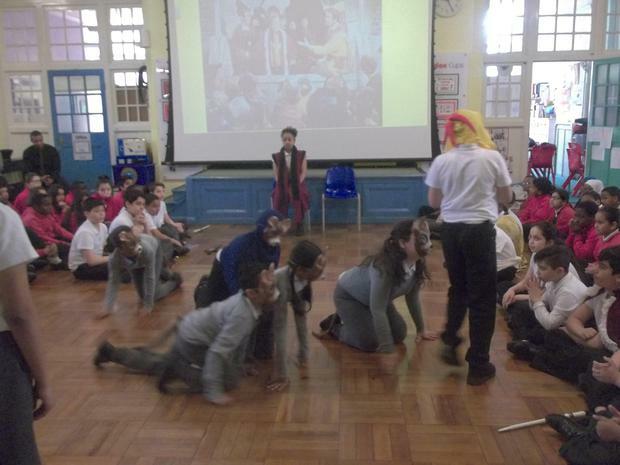 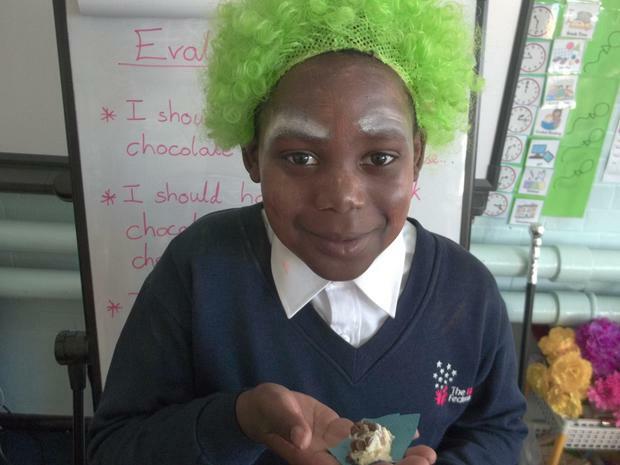 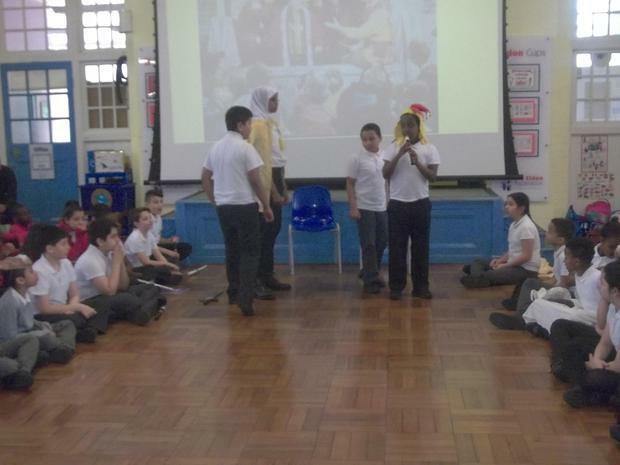 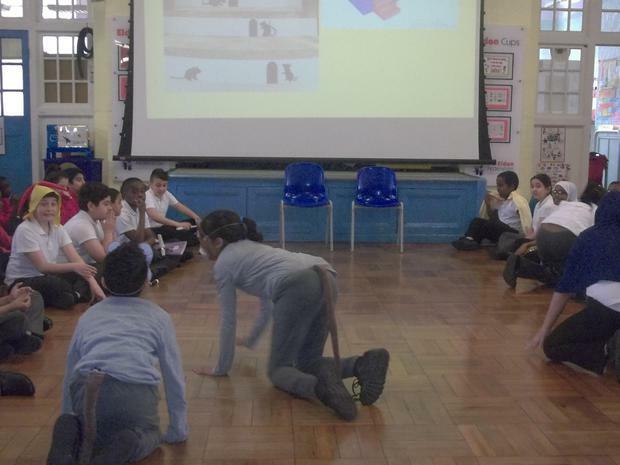 Saturn class performed their class assembly on the story of the Pied Piper of Hamelin. 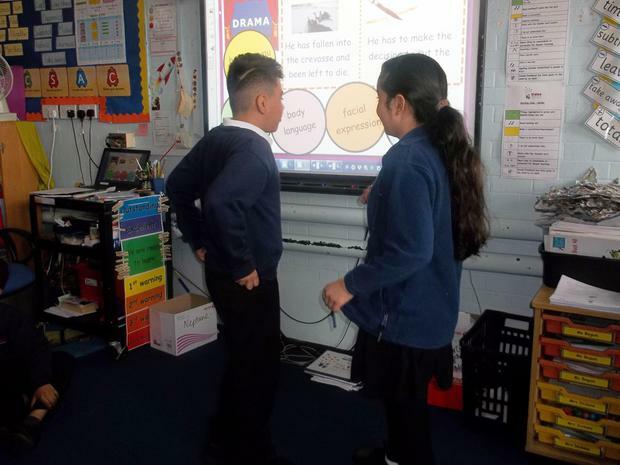 They wrote out some alternative endings and acted them out. 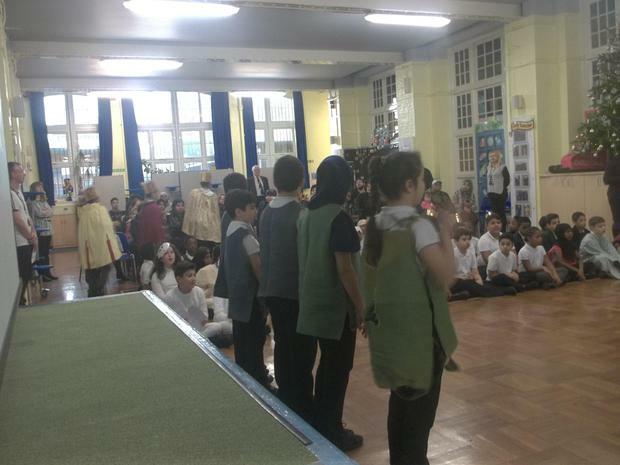 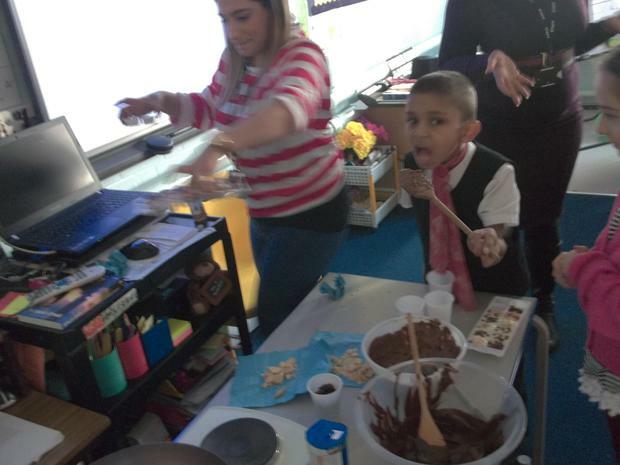 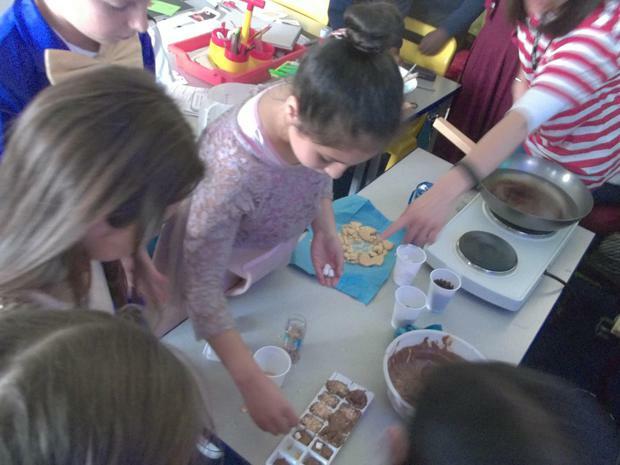 They worked very hard and did extremely well. 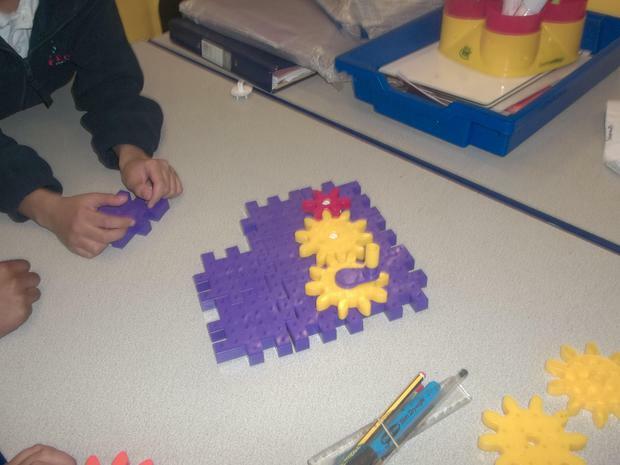 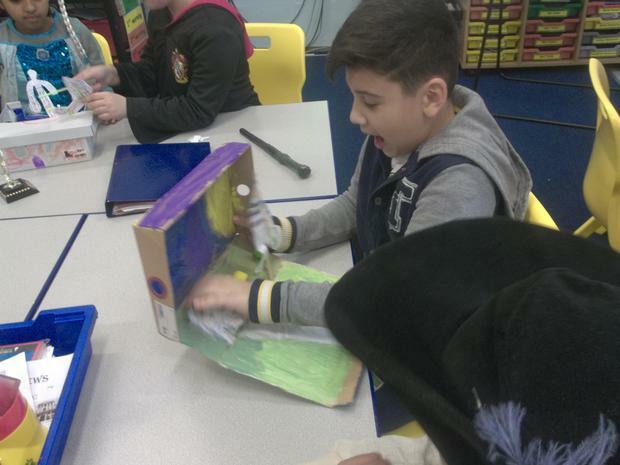 We have been working on designing and making moving toys using cams for a project set by Toys R Us. 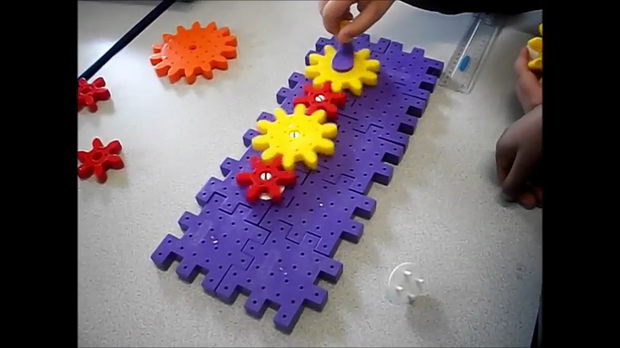 We needed to design a toy which would be suitable for 5-8 year olds. 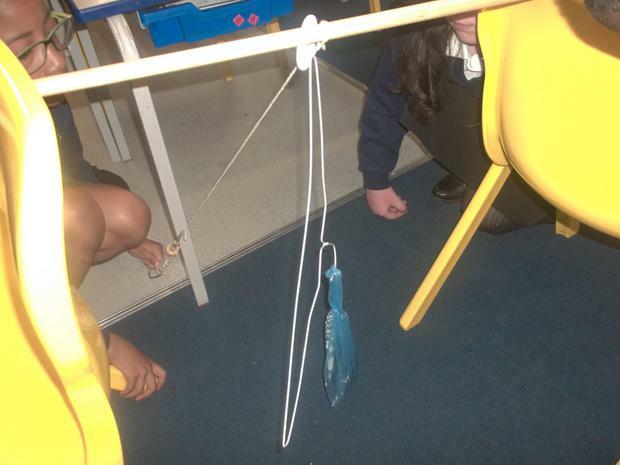 We were not allowed to use batteries and it had to move using a handle. 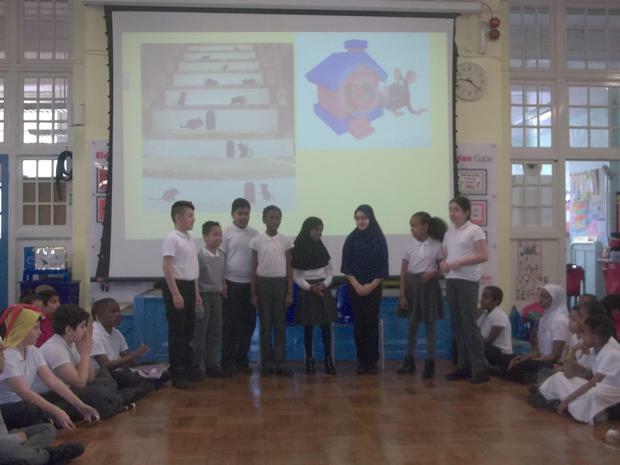 We used our Pied Piper story as an inspiration. 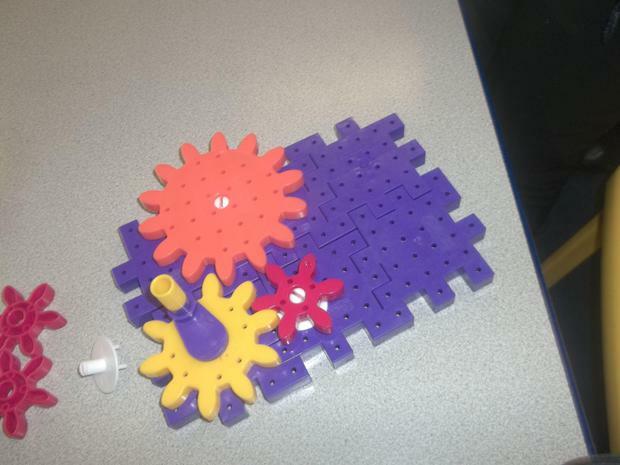 This was a challenging task but very fun. 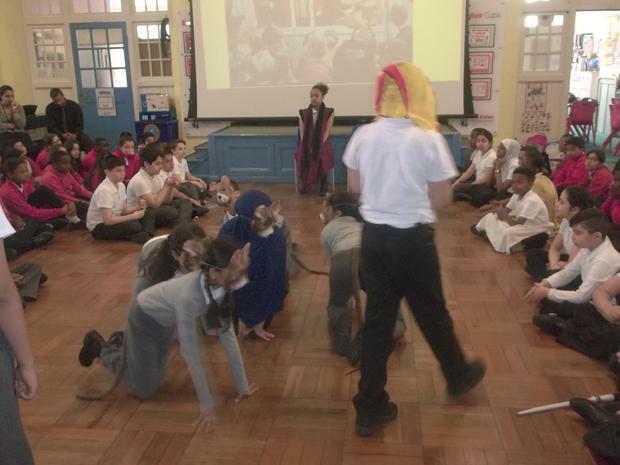 This half term we have learning about the Pied Piper of Hamelin. 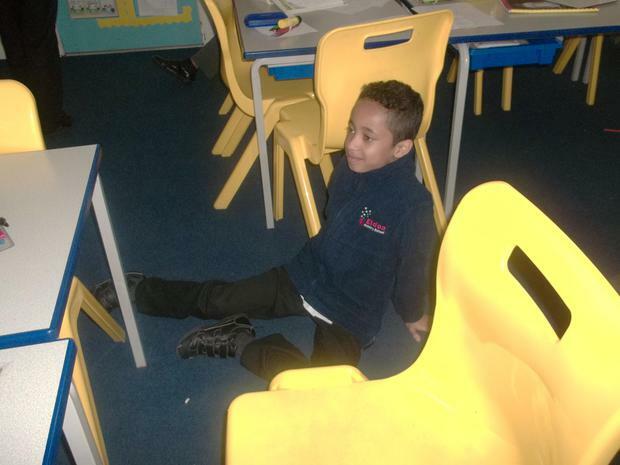 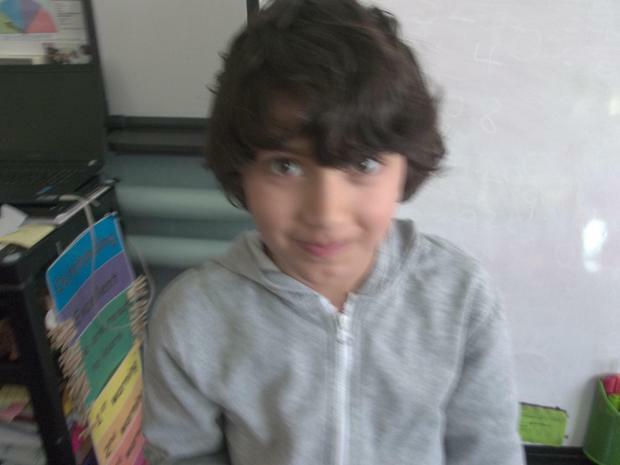 We have learning to use speech to move a story on. 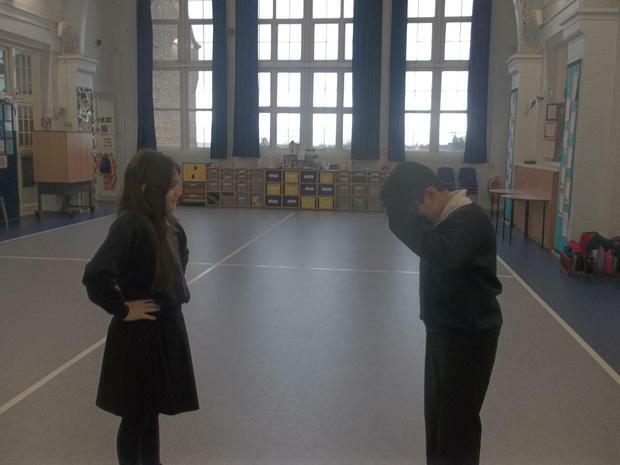 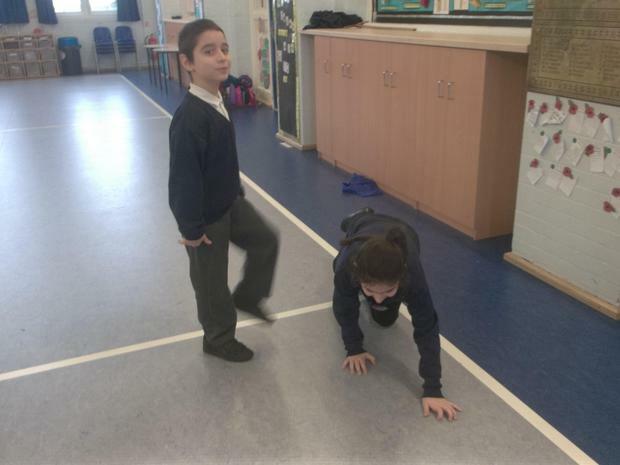 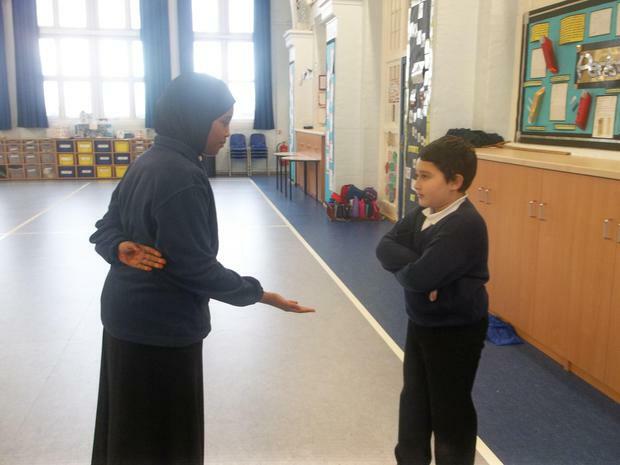 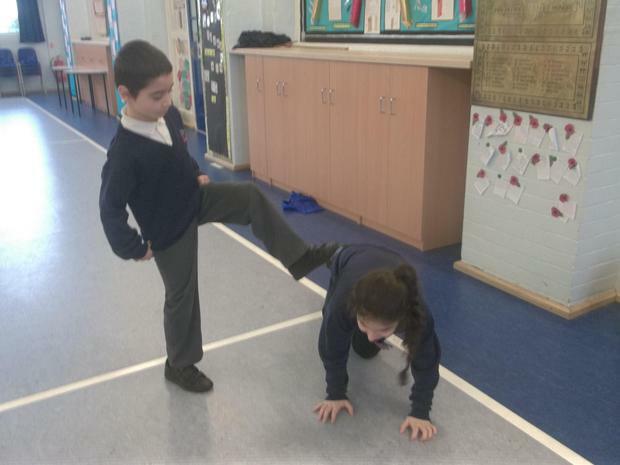 Before we started this we acted out different parts of the story and created freeze frames to understand how different characters felt. 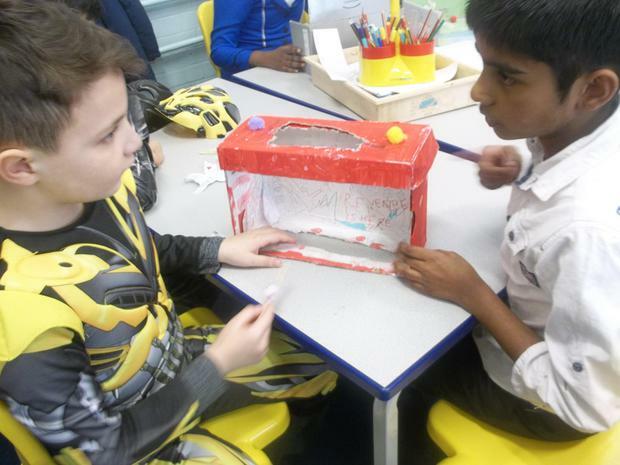 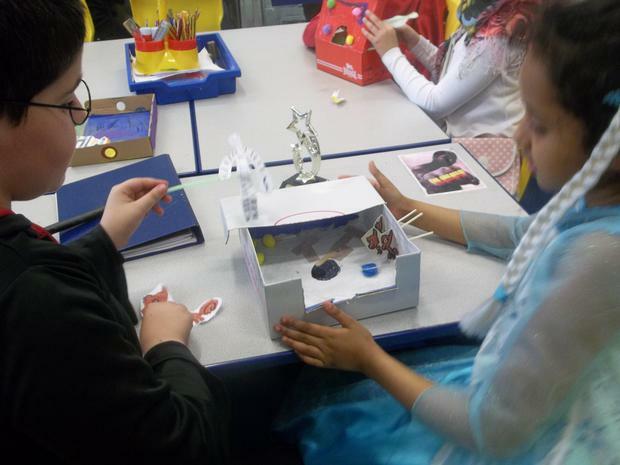 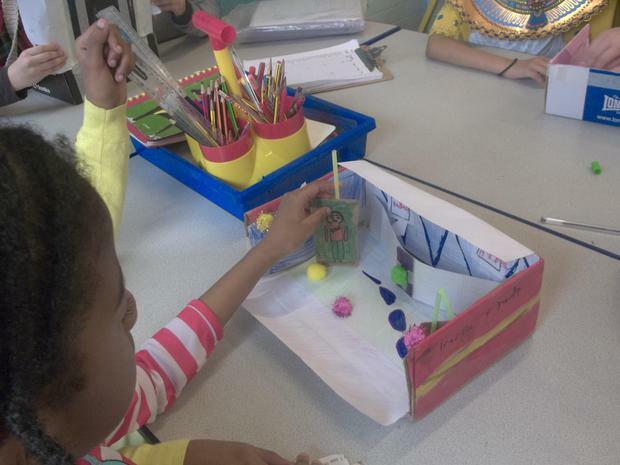 We created story boxes for our Hacker story and made props. 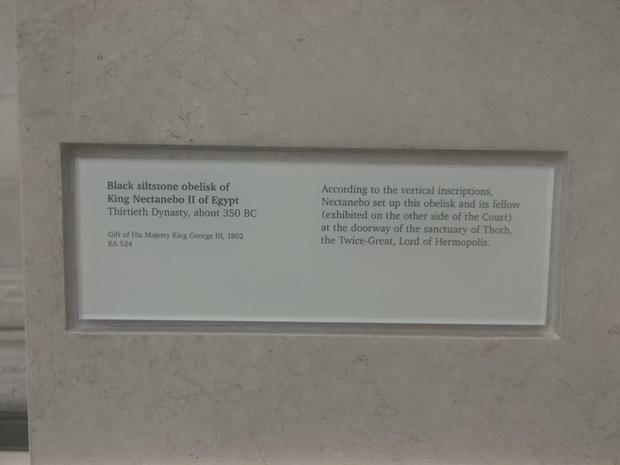 We looked at an Artist names Roy Leitchenstein. 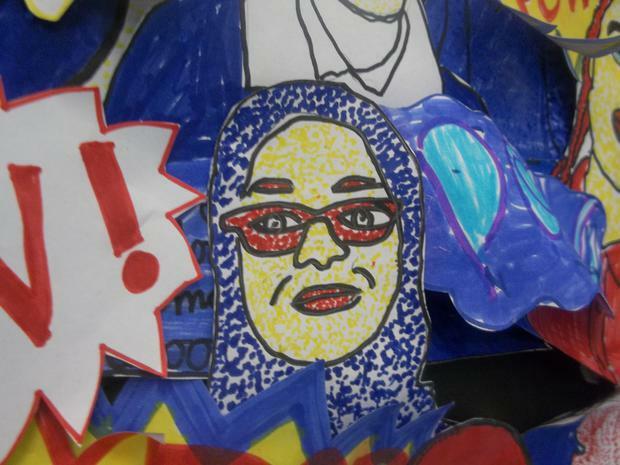 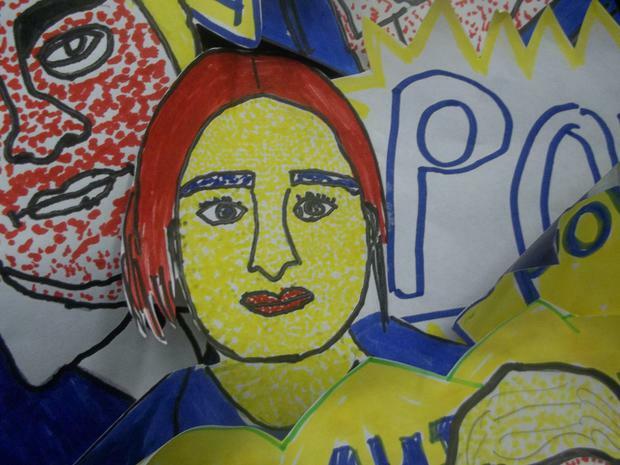 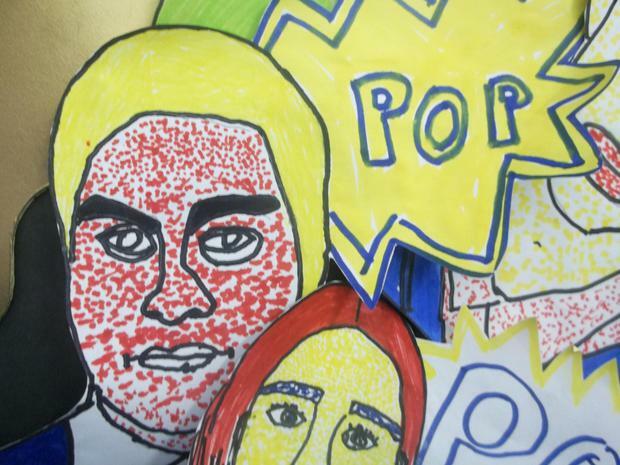 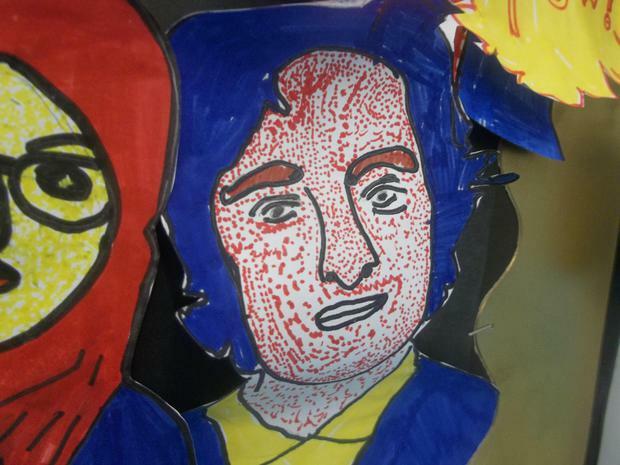 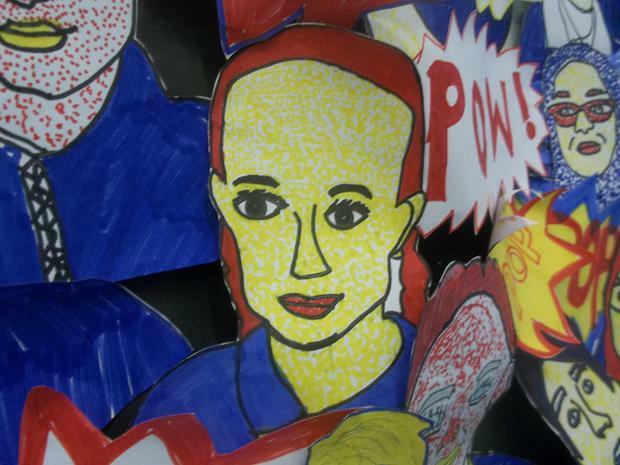 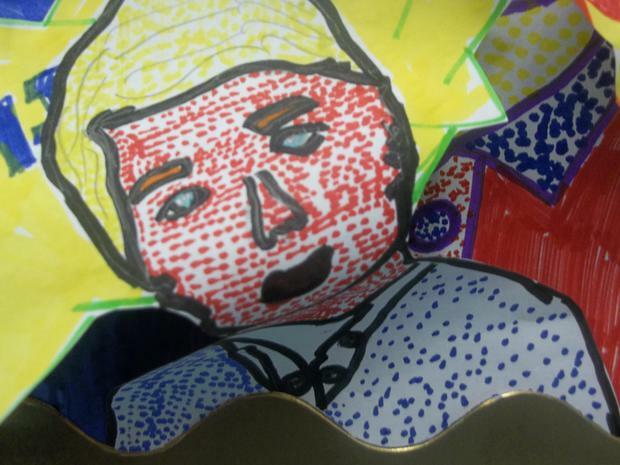 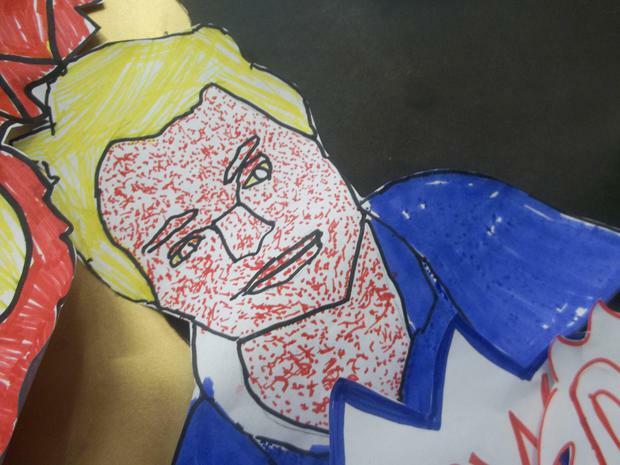 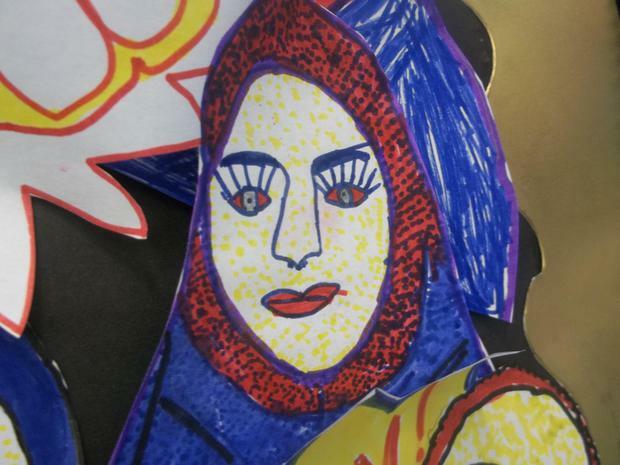 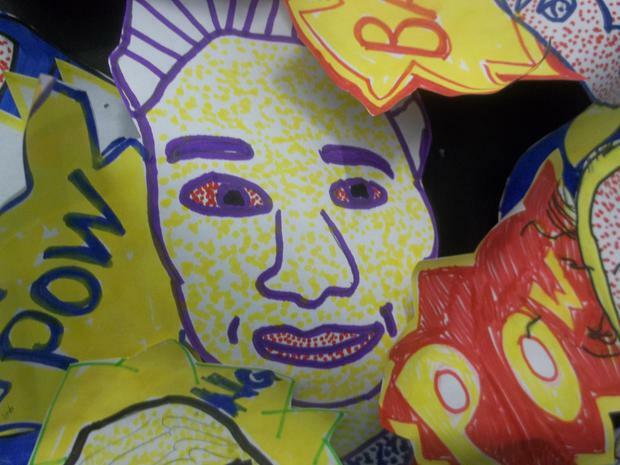 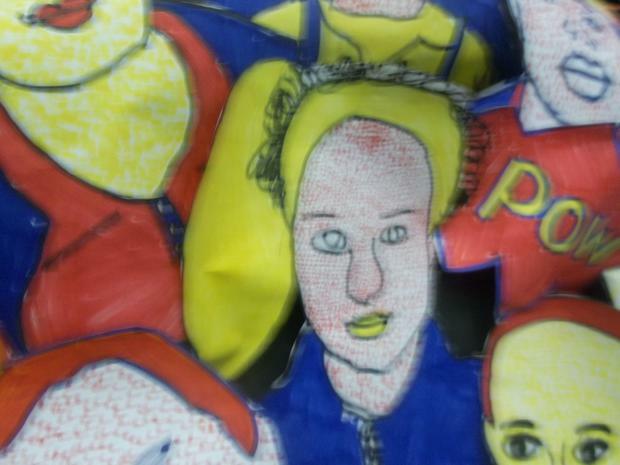 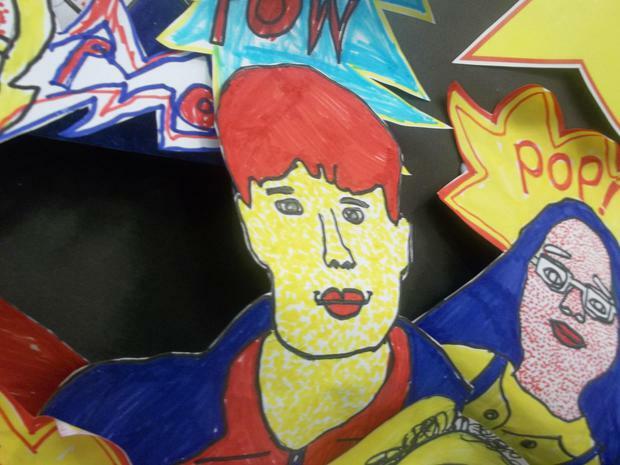 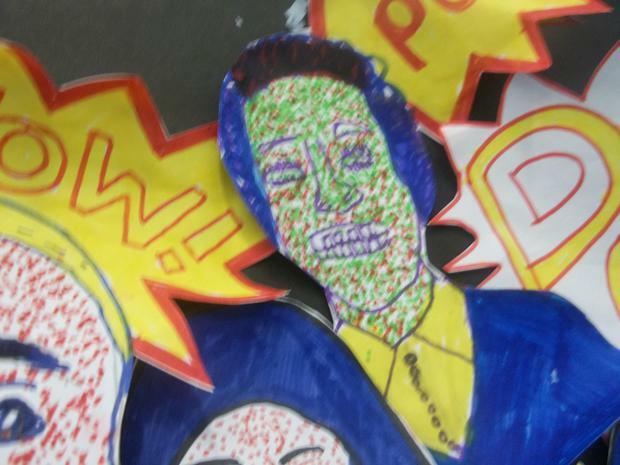 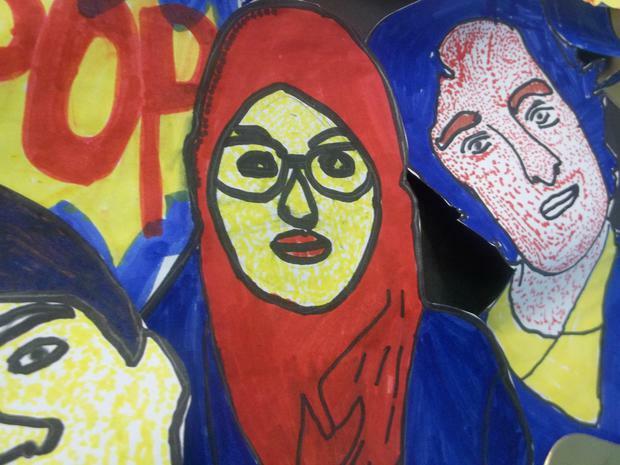 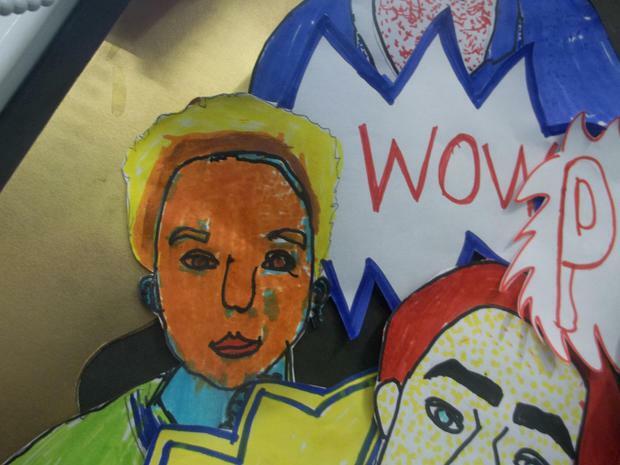 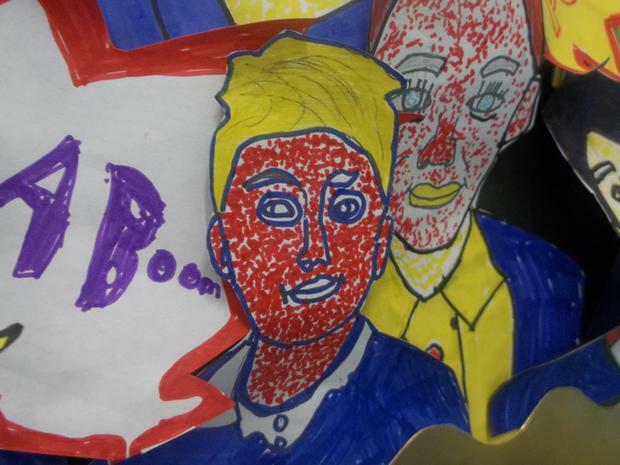 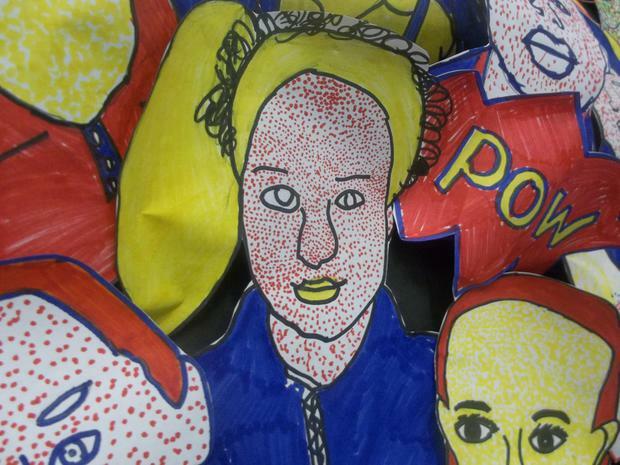 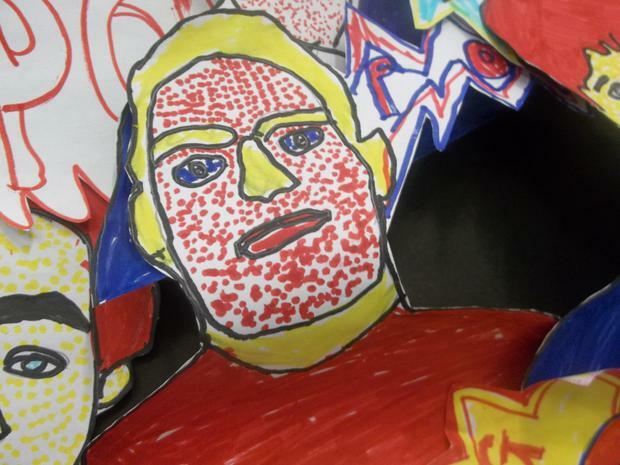 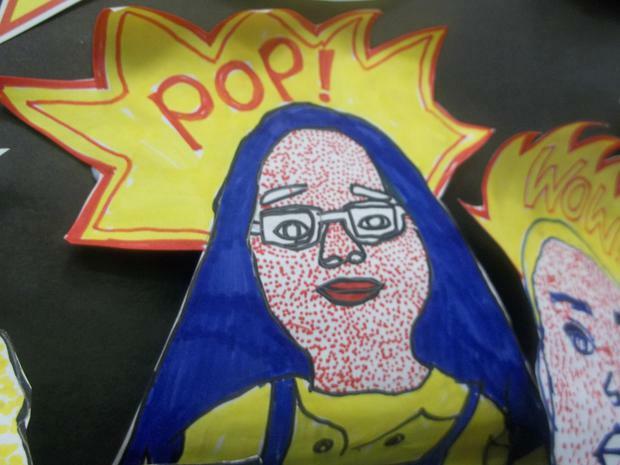 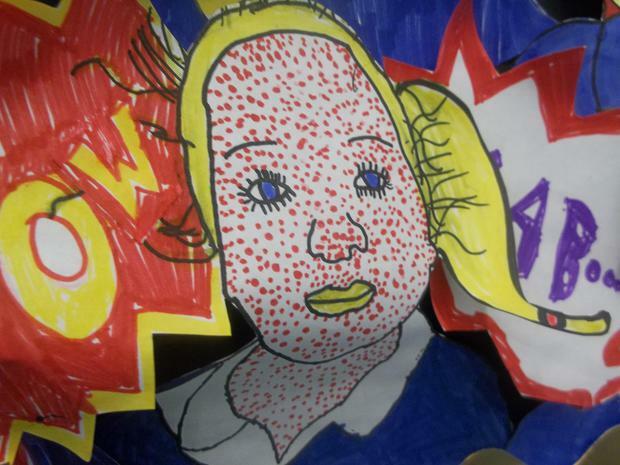 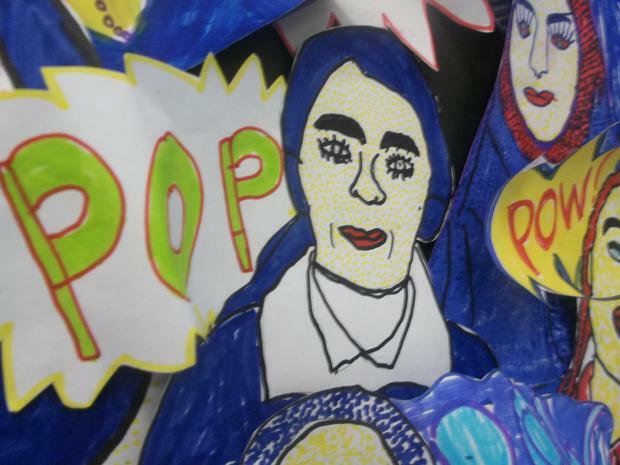 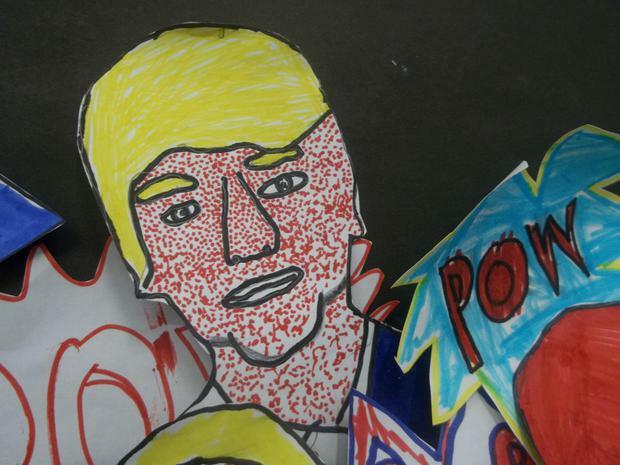 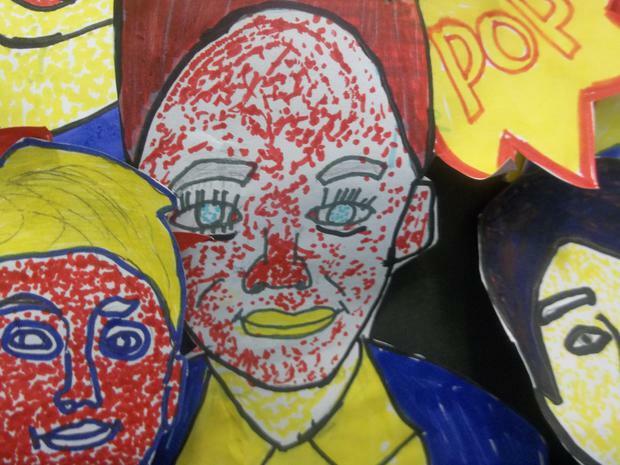 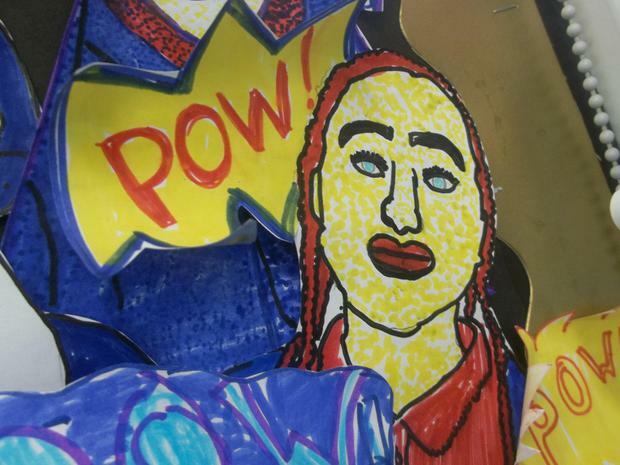 We looked at the skills used and recreated this style using our own image. 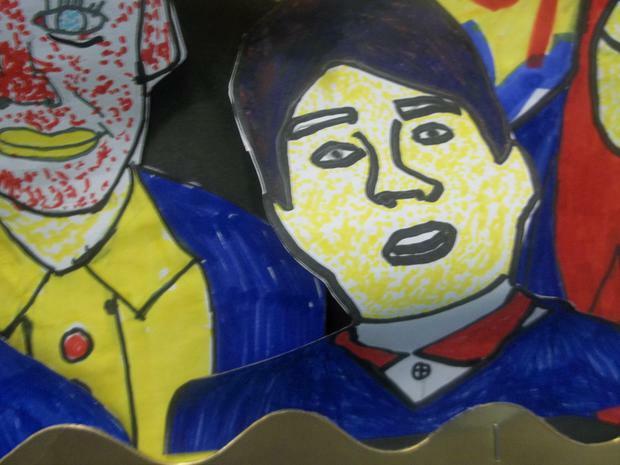 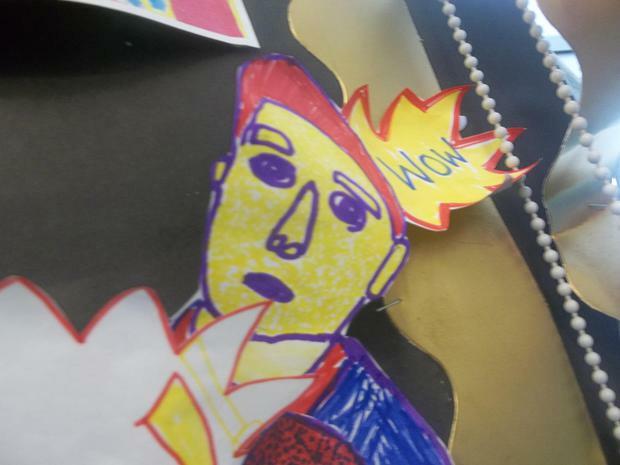 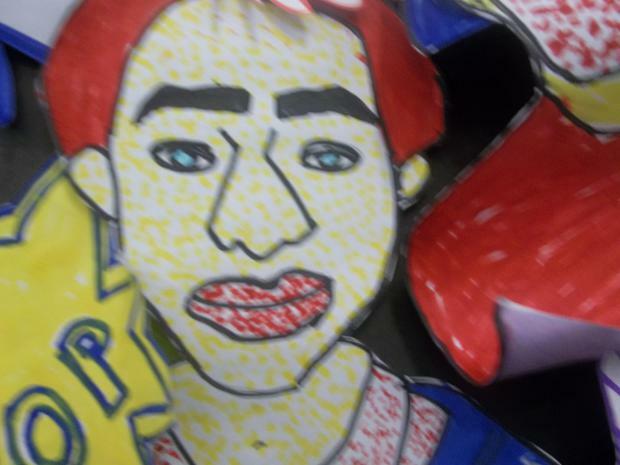 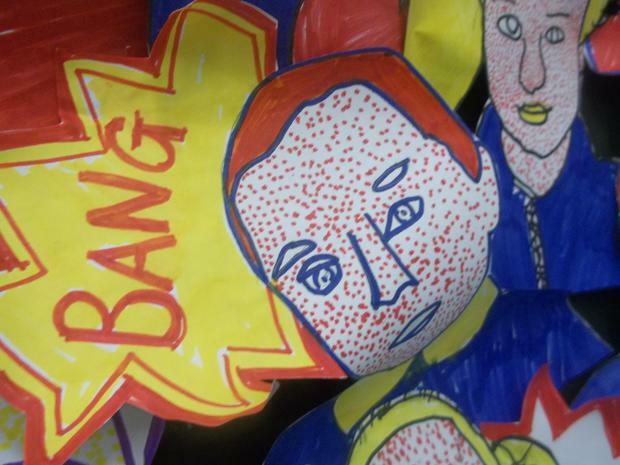 He only used 3 primary colours. 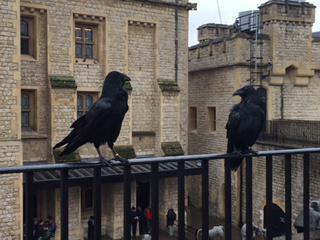 Can you name what they are? 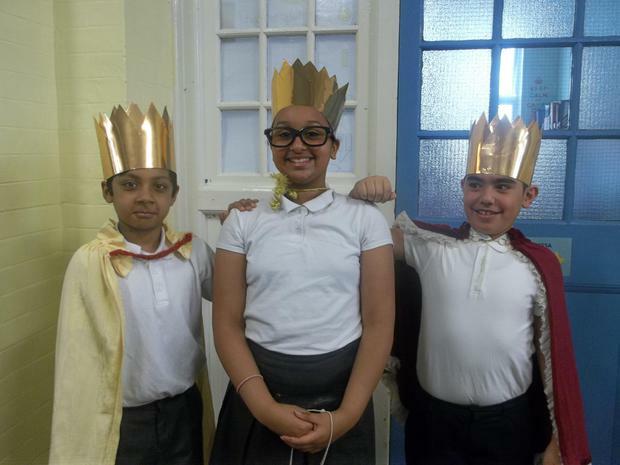 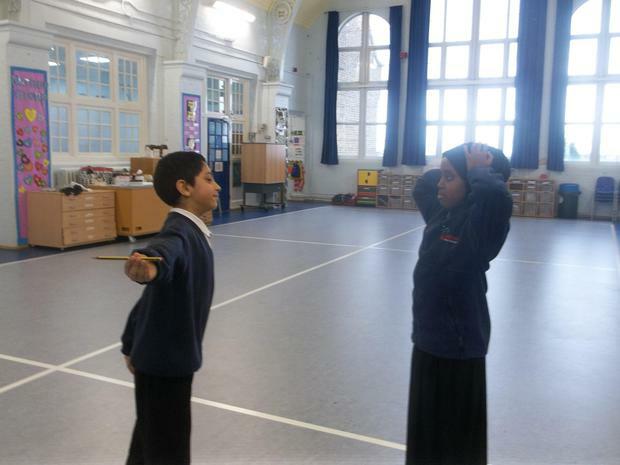 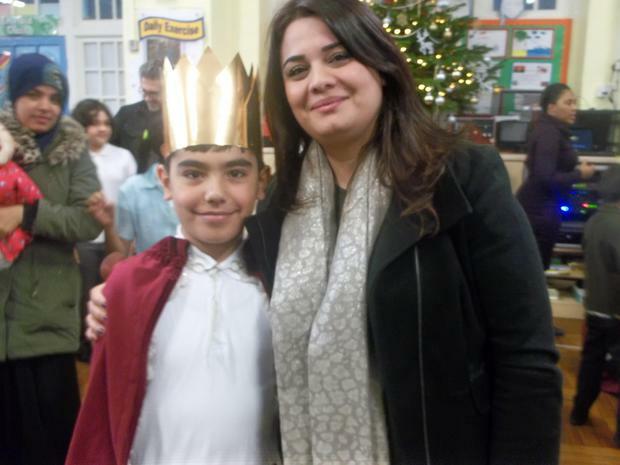 Mars and Venus have written their own adapted version of their Shakespeare play; Romeo and Juliet and Macbeth. 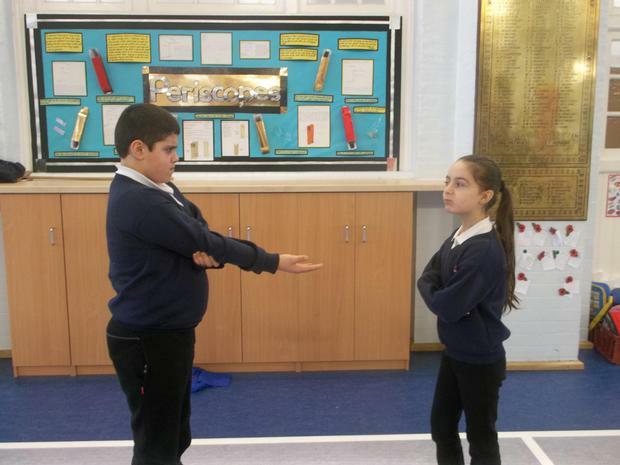 They wrote independently and were able to perform their plays to each other. 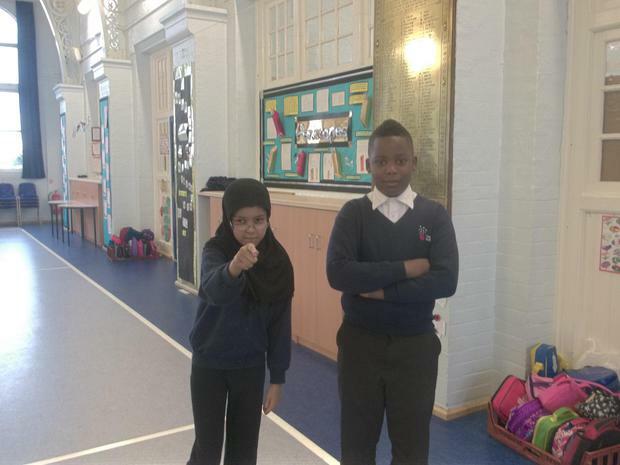 Well done Mars and Venus!!! 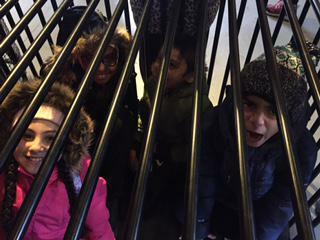 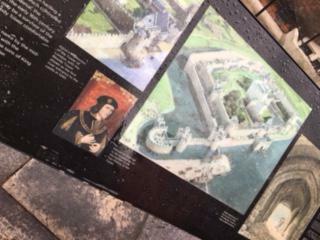 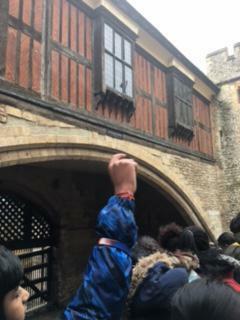 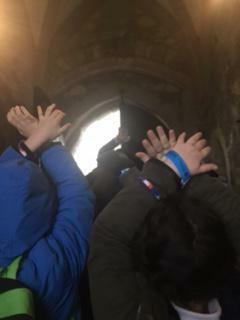 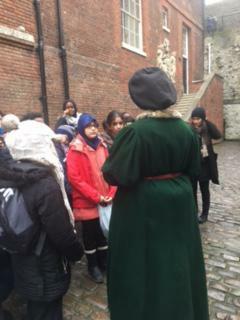 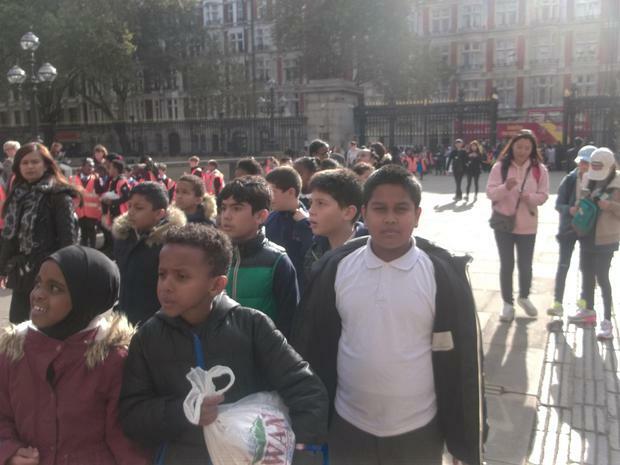 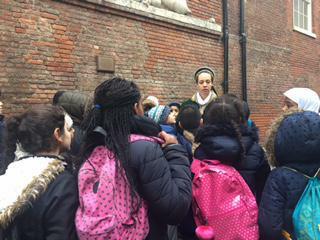 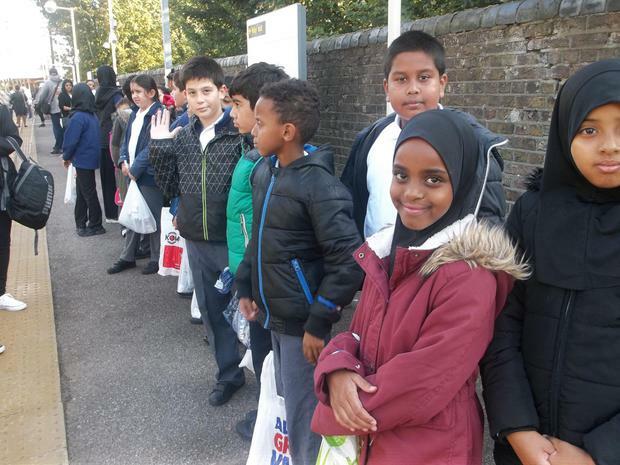 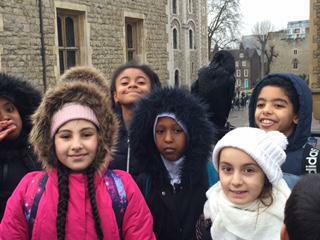 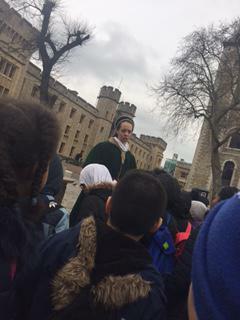 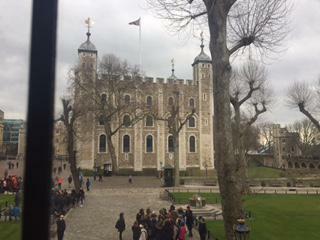 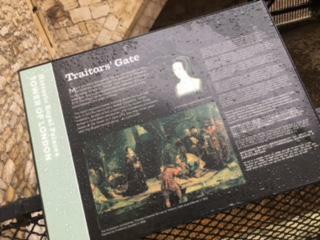 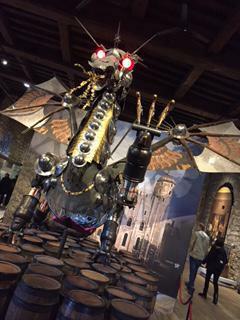 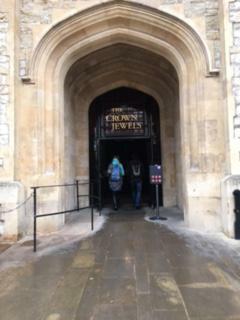 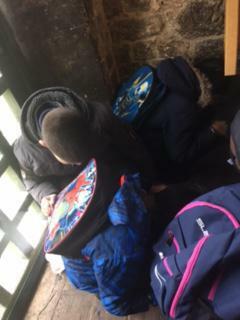 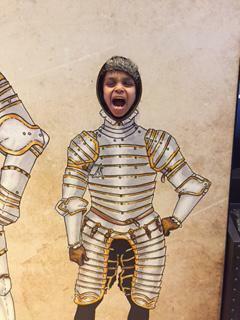 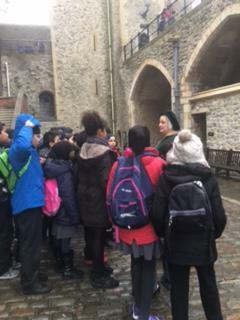 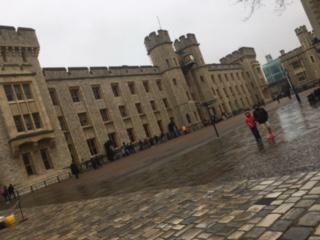 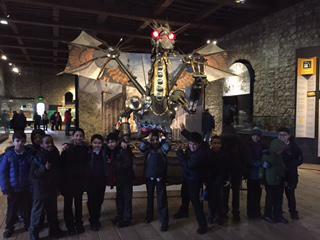 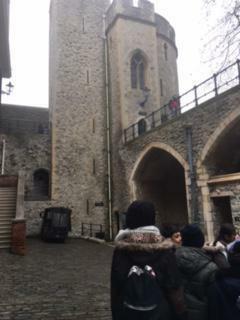 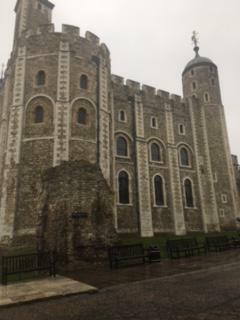 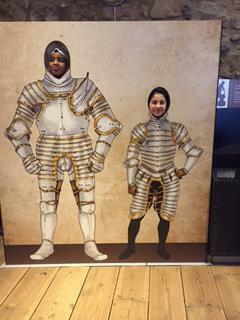 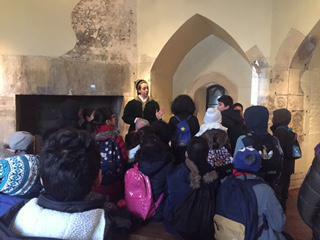 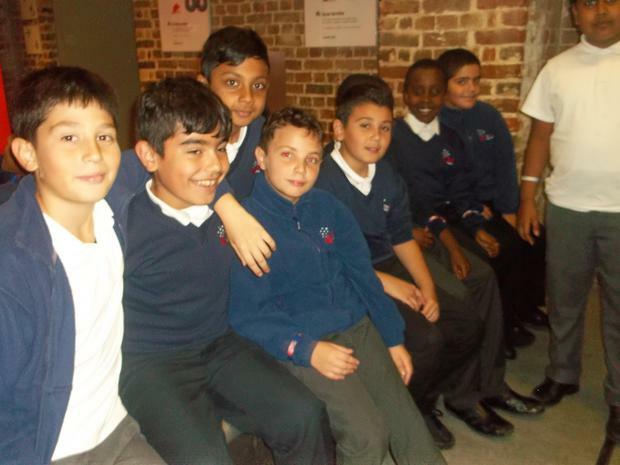 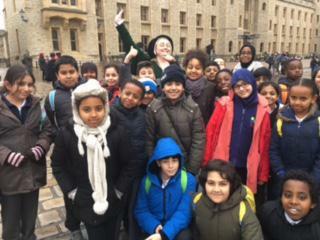 Year 5 really enjoyed their trip to the Tower of London. 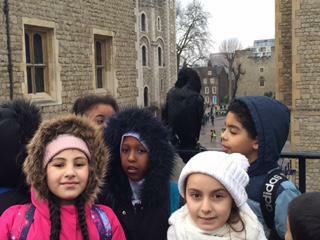 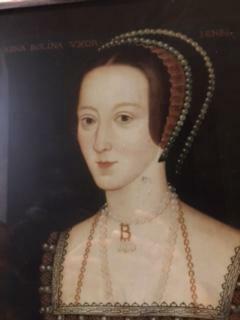 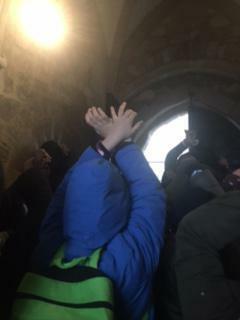 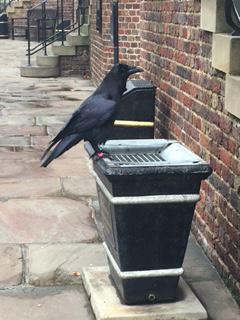 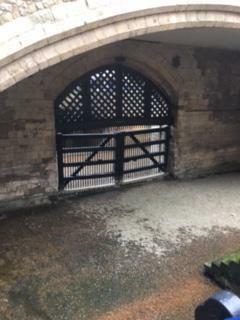 They saw the Ravens and went to visit numerous Towers whilst there. 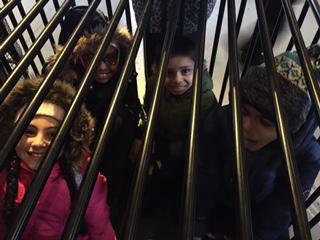 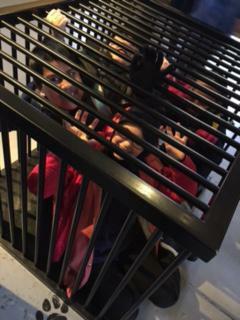 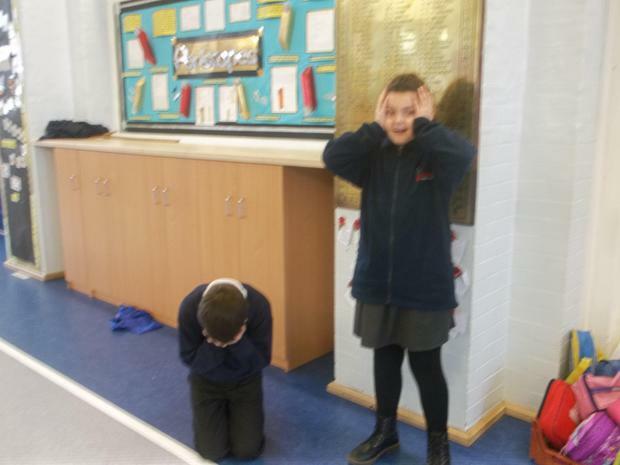 They had fun in the beast room and were able to learn more about punishments through history and how they have changed. 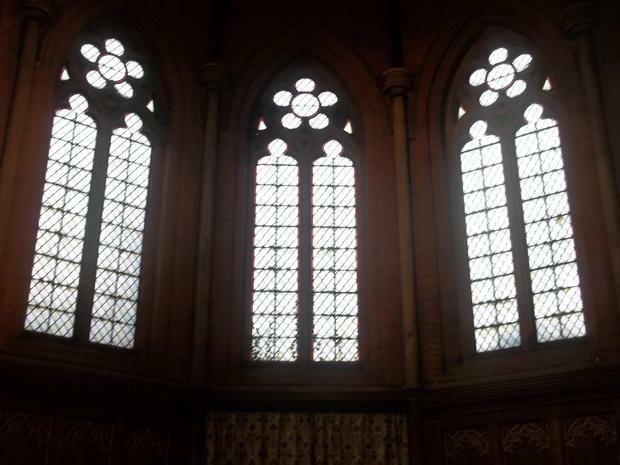 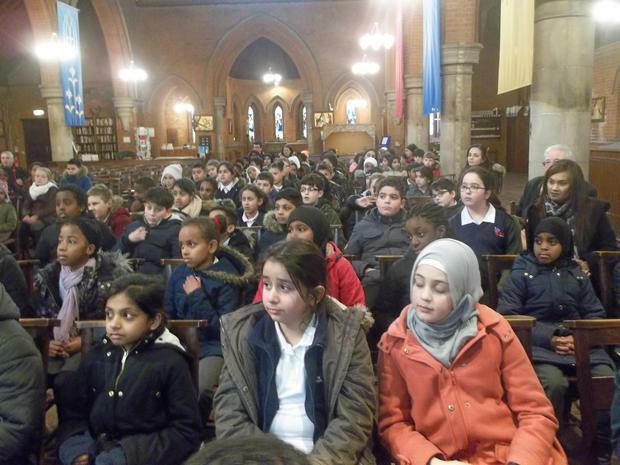 We really enjoyed our trip to the Church. 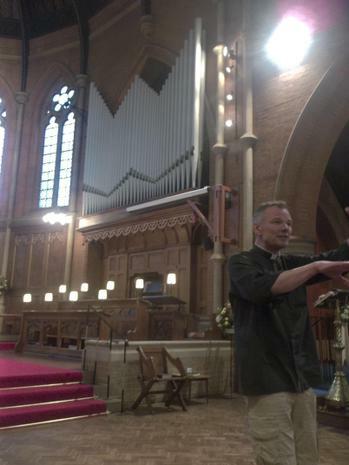 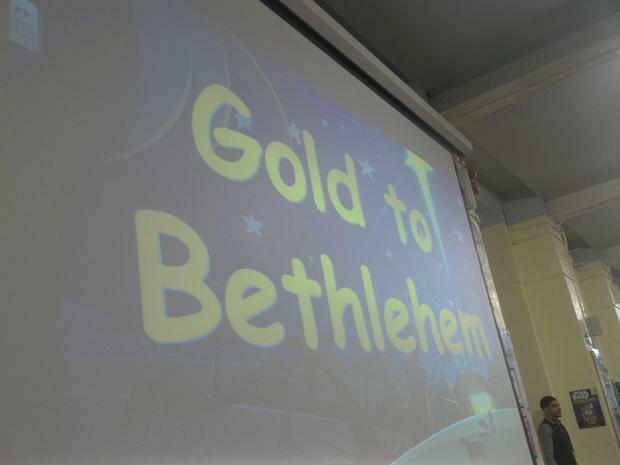 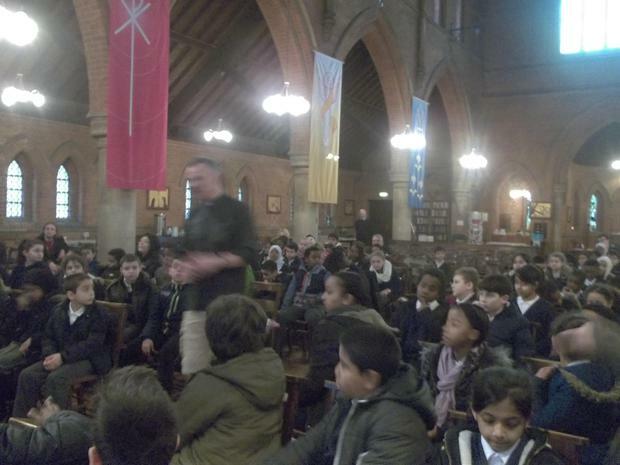 We learnt about how the Church supports our local community and the church helps people in their everyday lives. 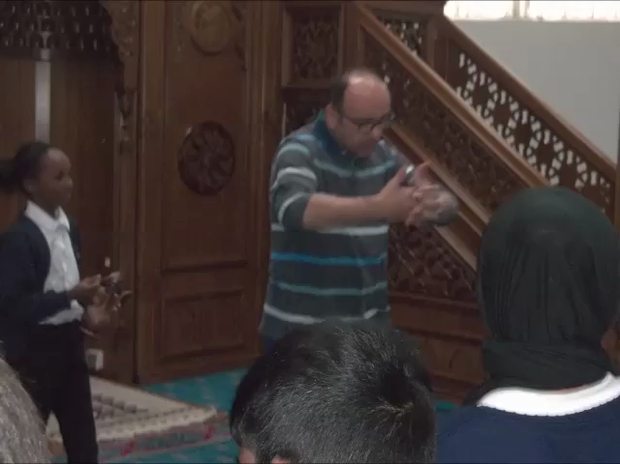 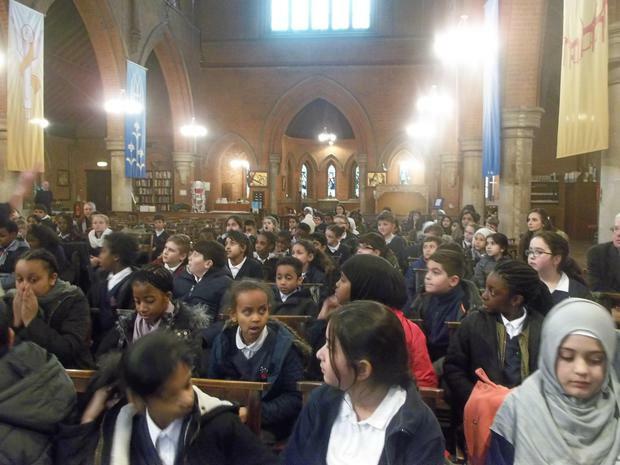 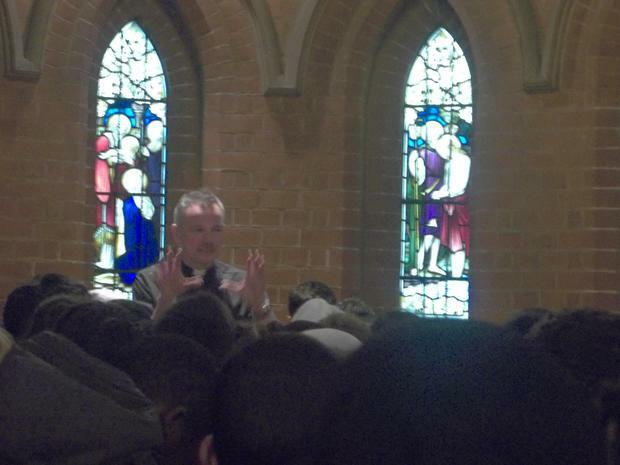 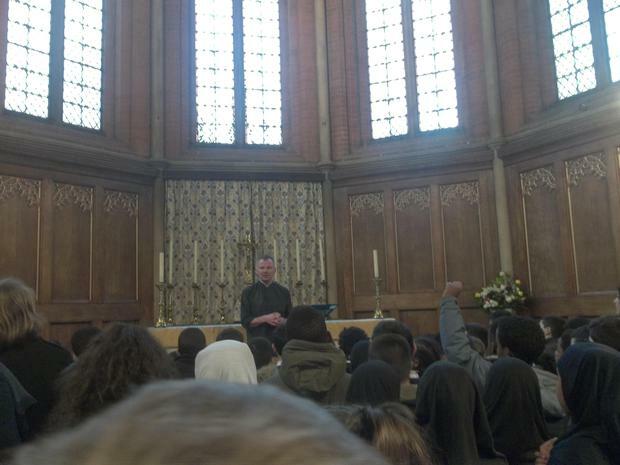 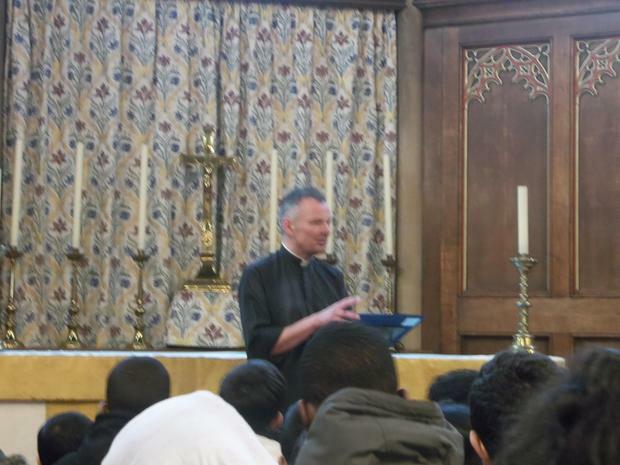 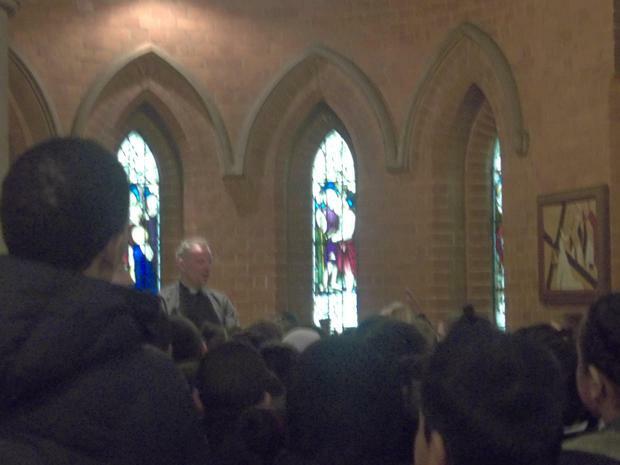 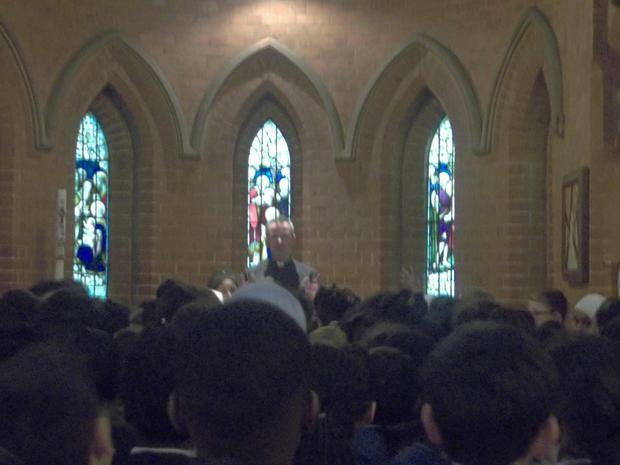 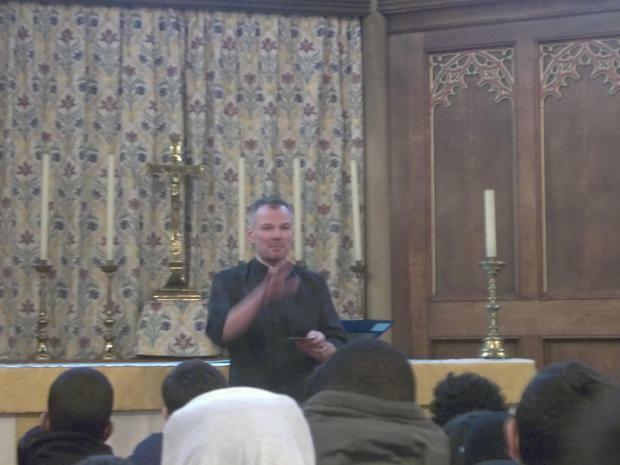 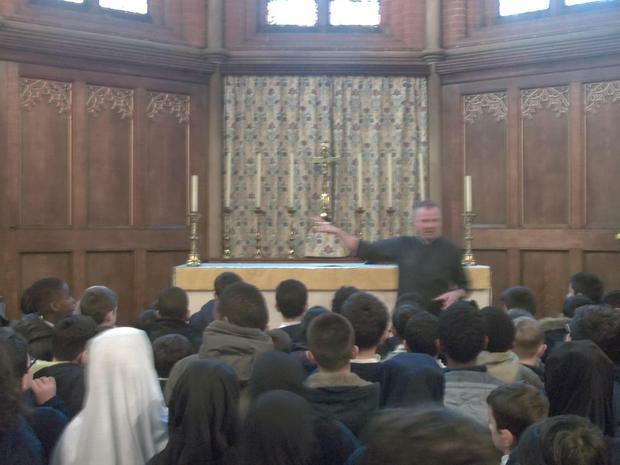 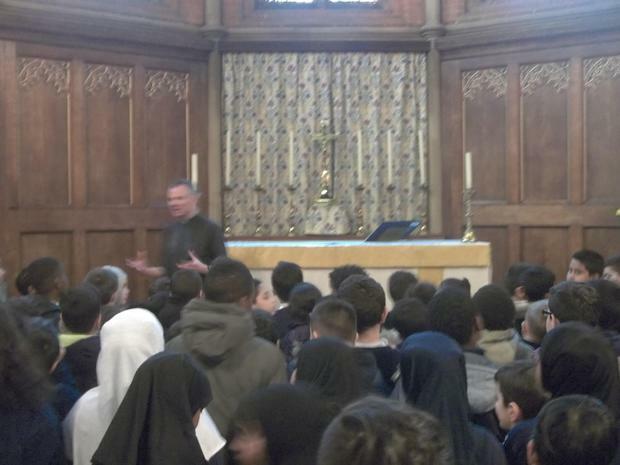 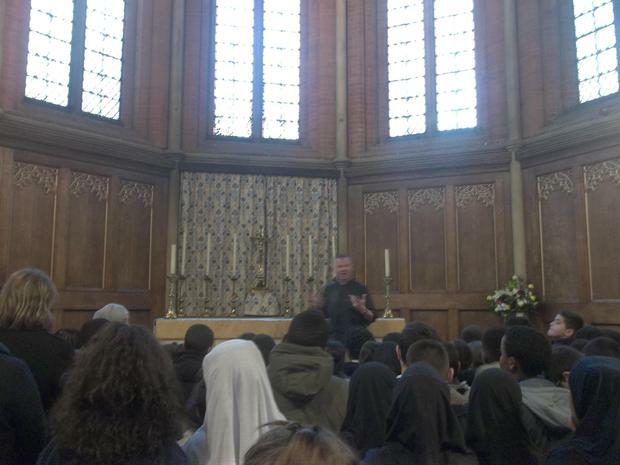 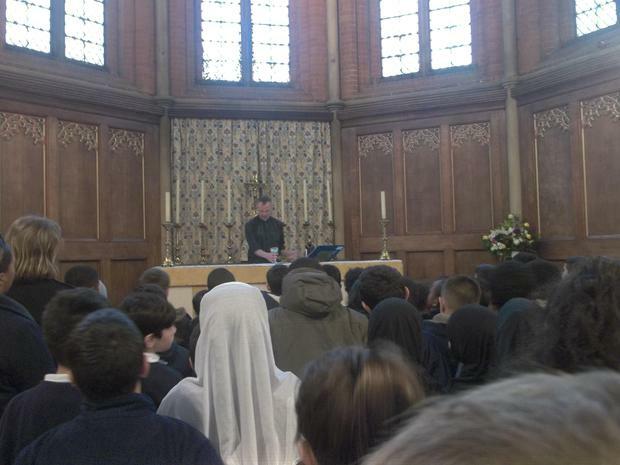 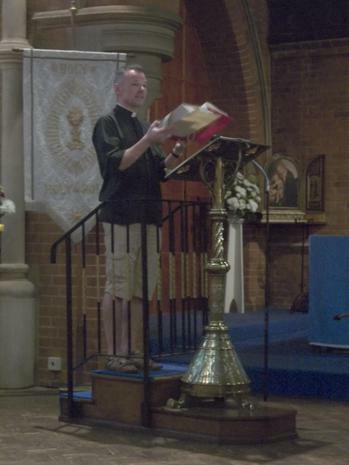 We learnt lots and had an opportunity to ask the Priest lots of useful questions. 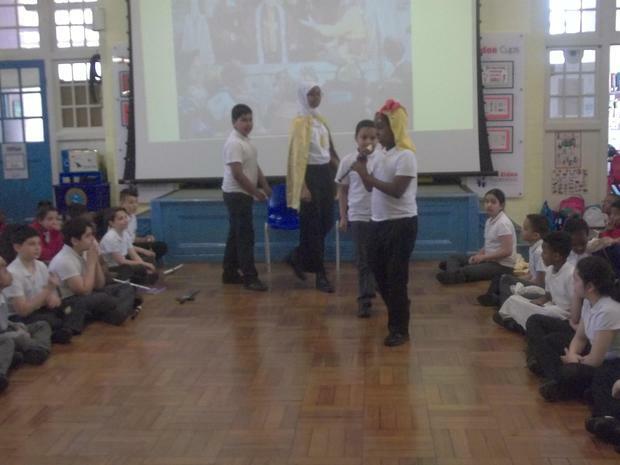 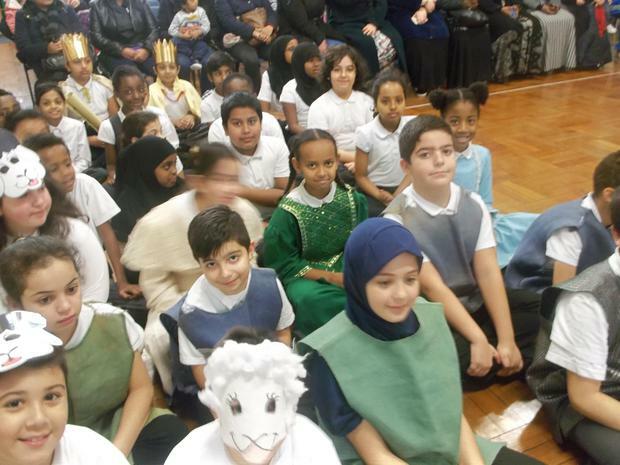 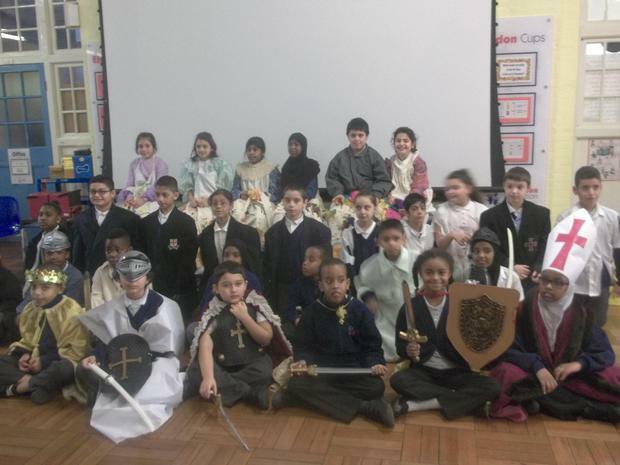 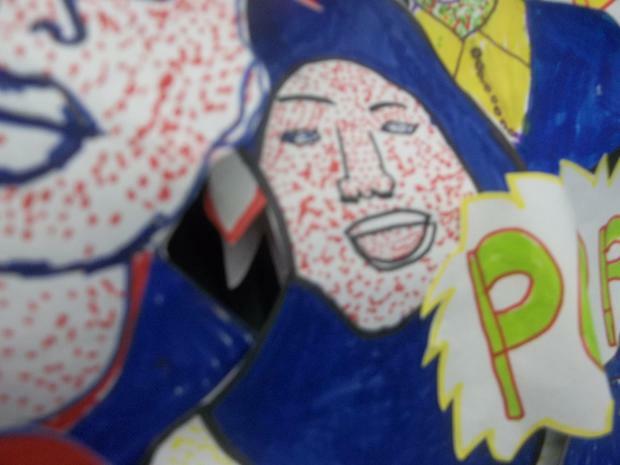 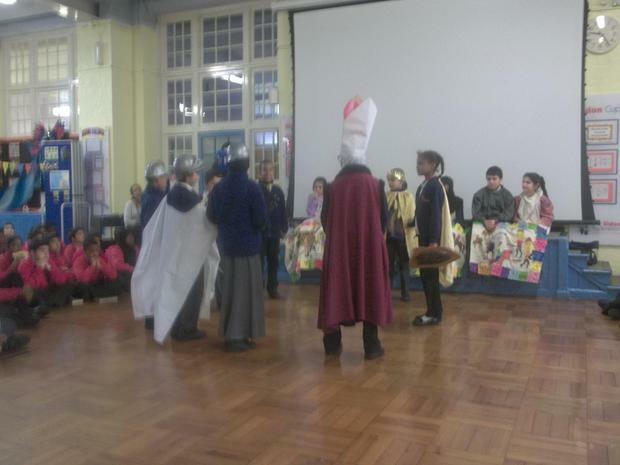 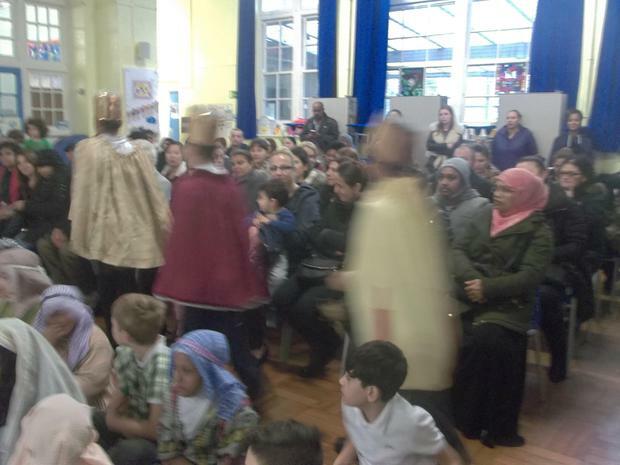 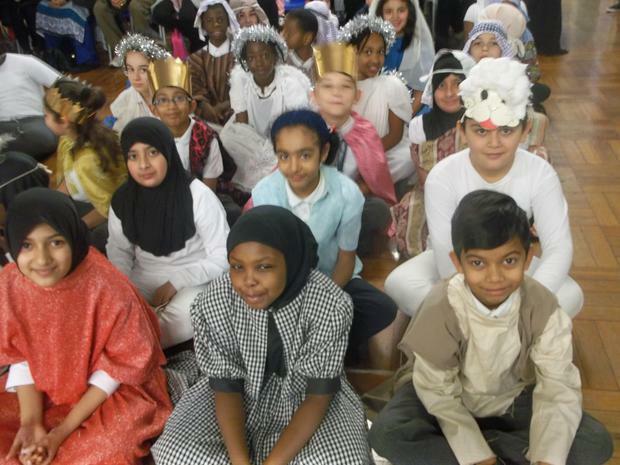 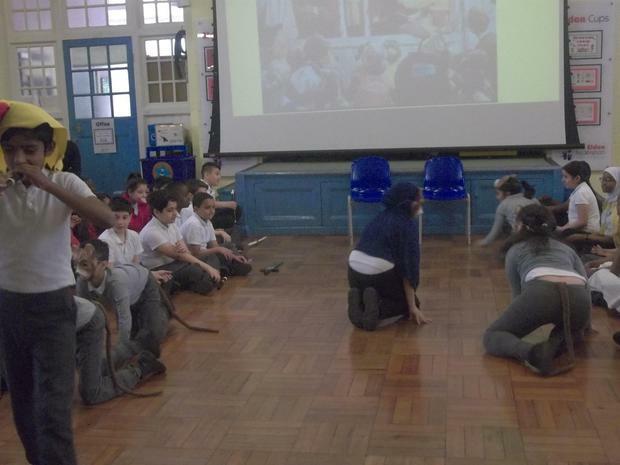 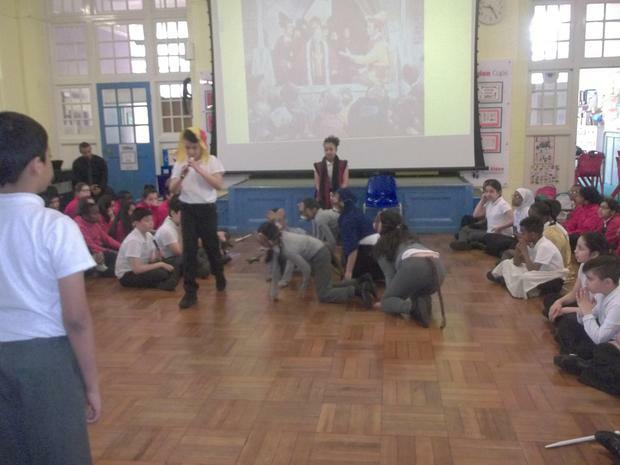 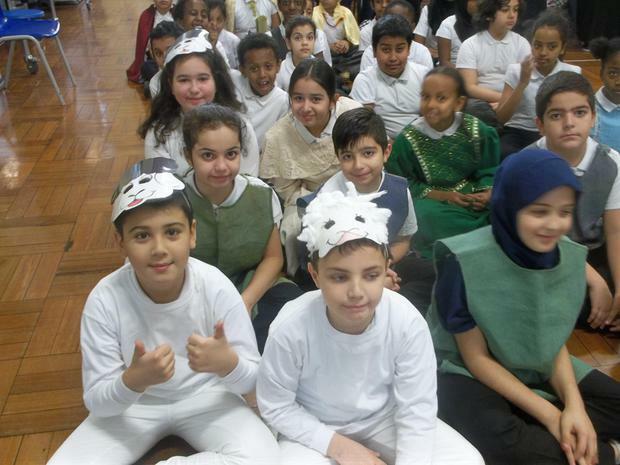 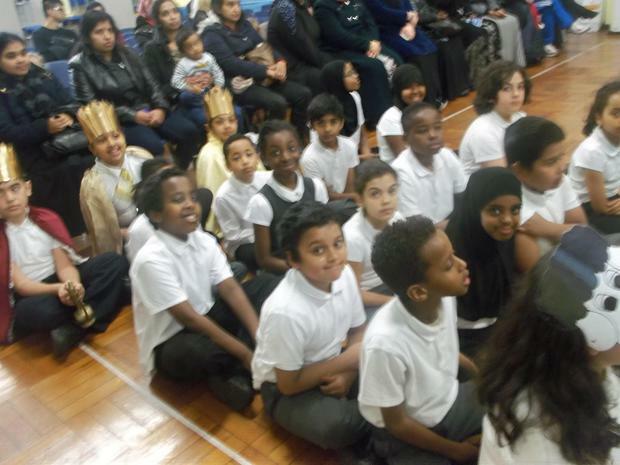 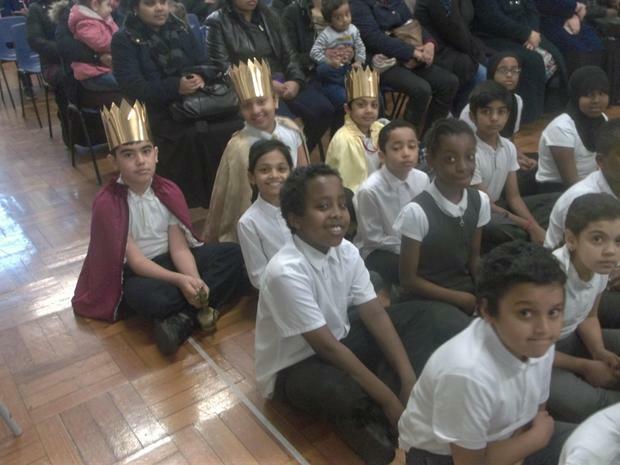 Venus class did very well on their class assembly on the Battle of Hastings. 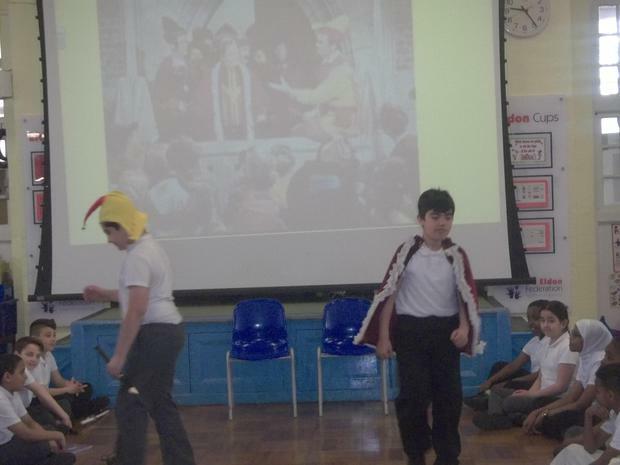 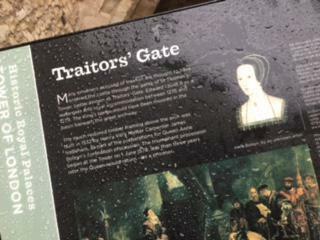 They took us through history about what happened when Edward the Confessor died. 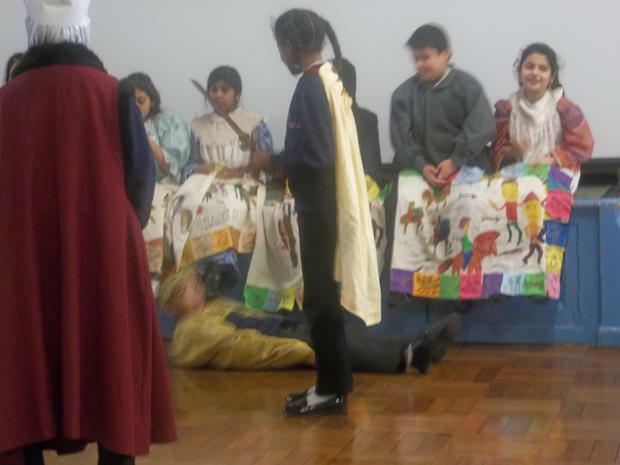 They showed us the Bayeux Tapestry which shows the story in pictures. 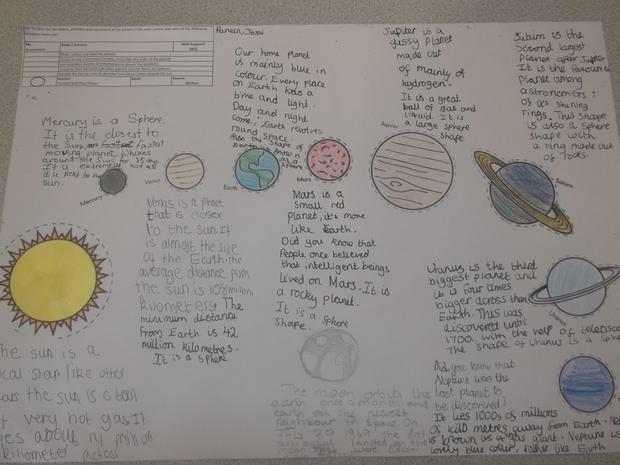 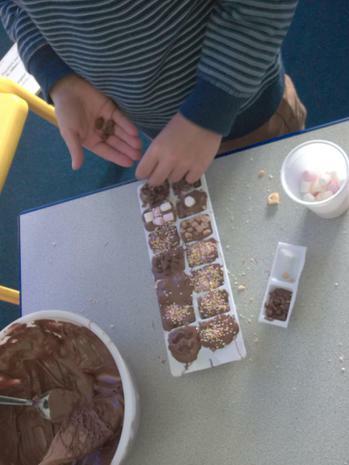 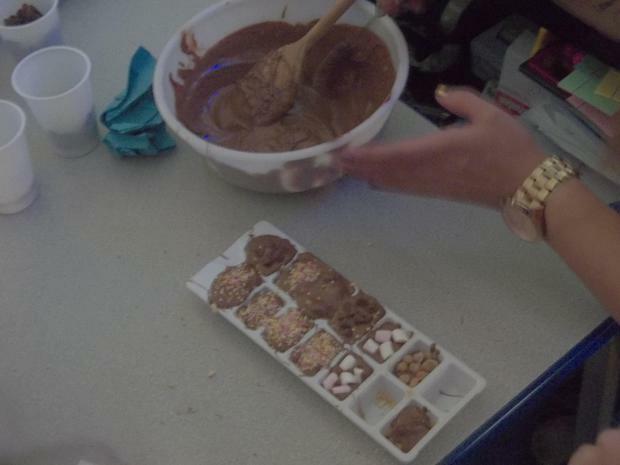 This is something that the year 5 children are looking forward to recreate in the coming weeks. 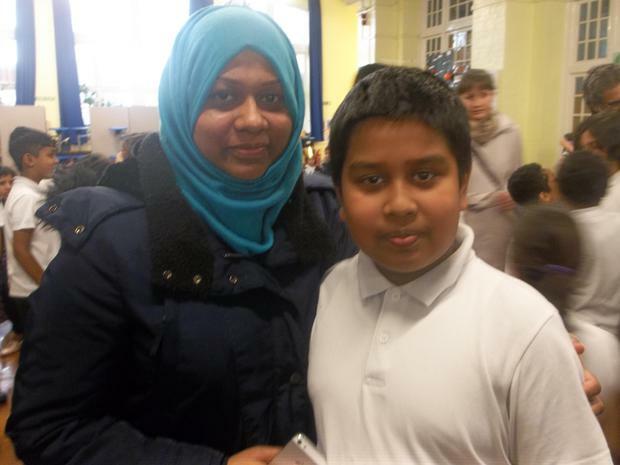 A big well done to them. 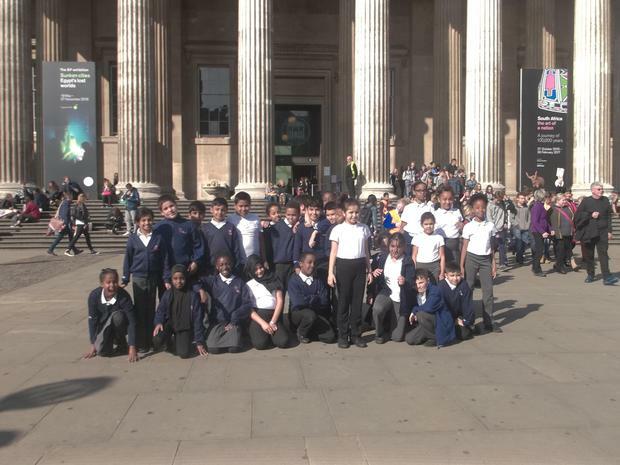 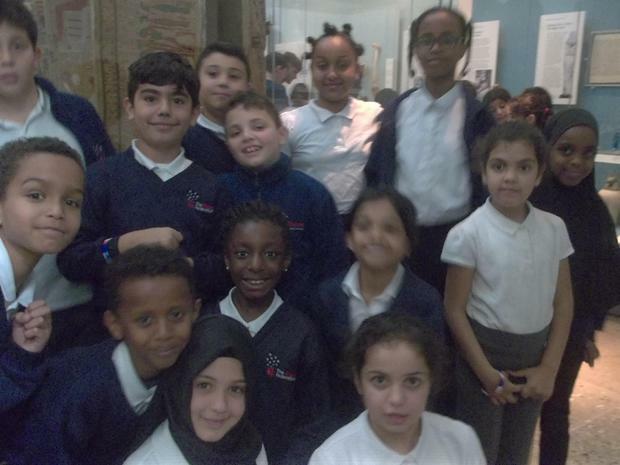 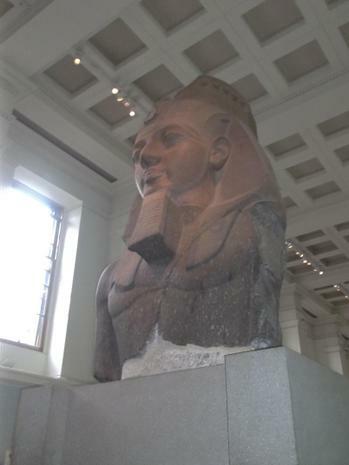 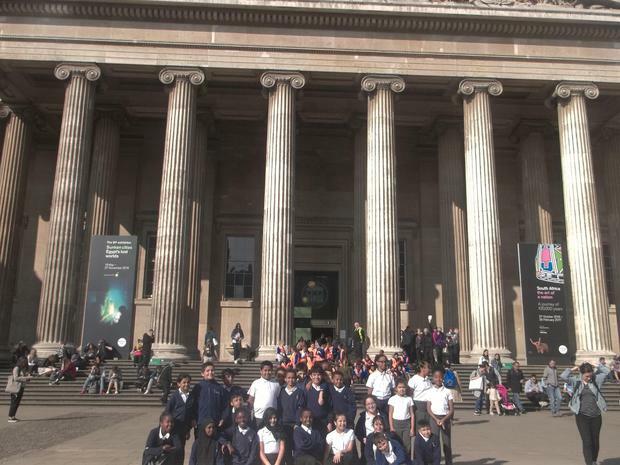 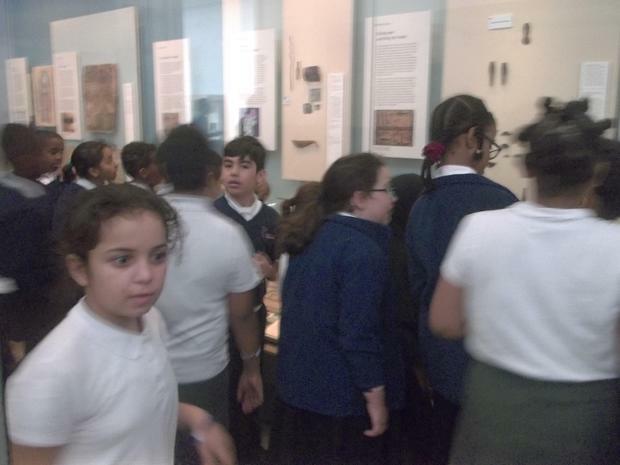 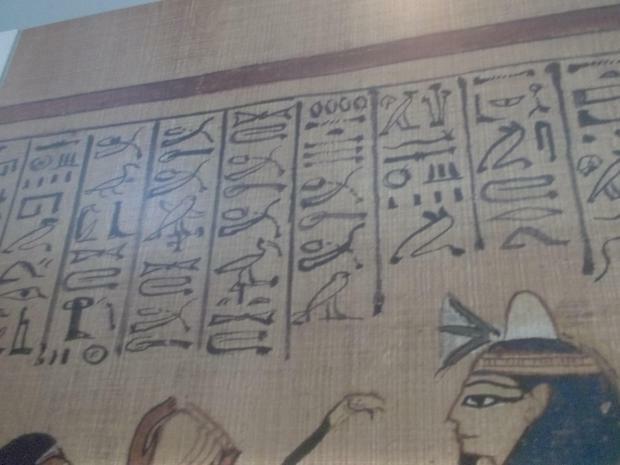 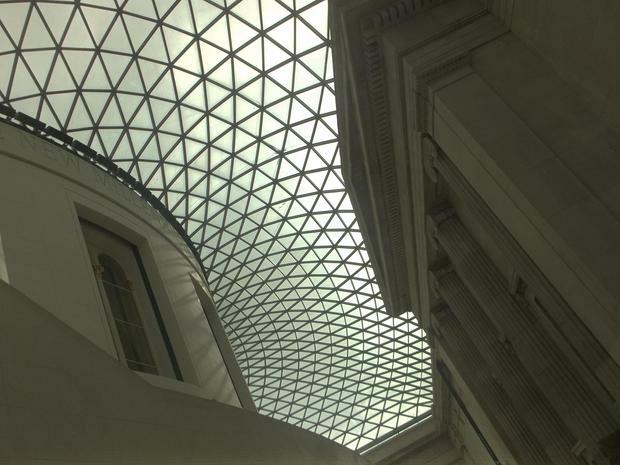 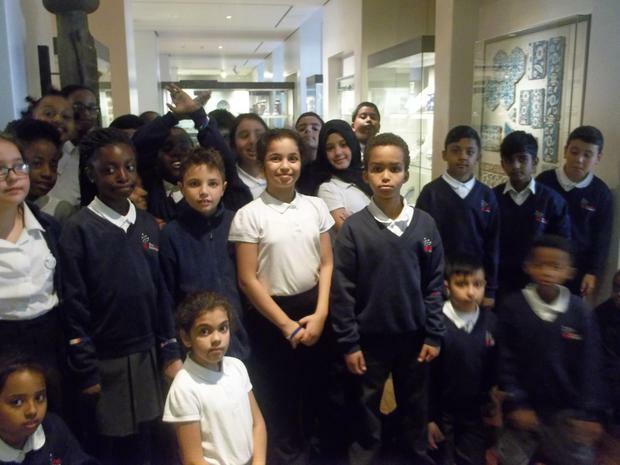 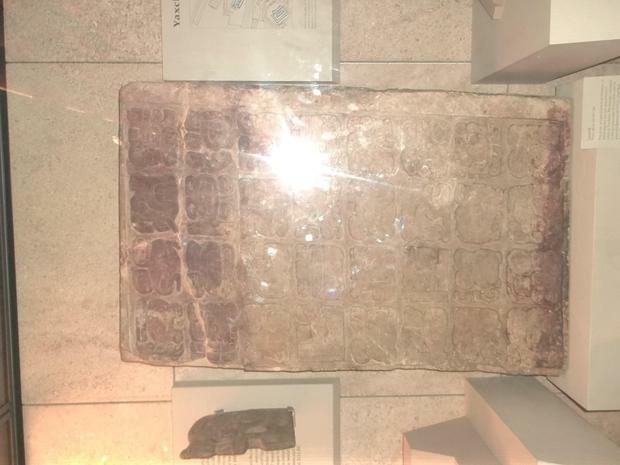 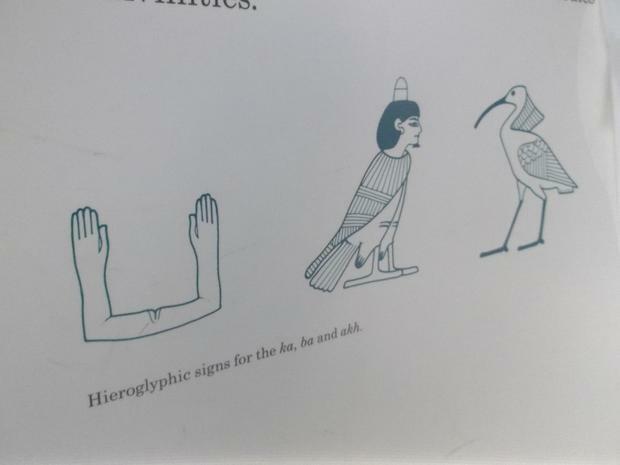 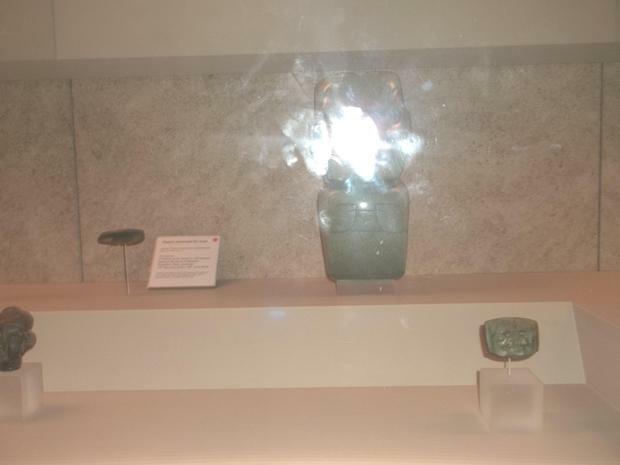 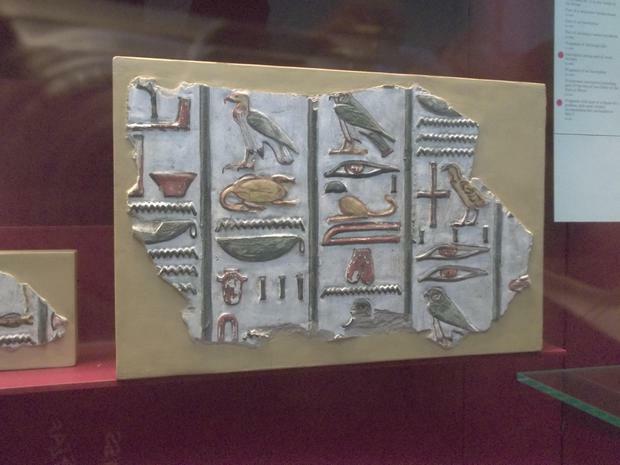 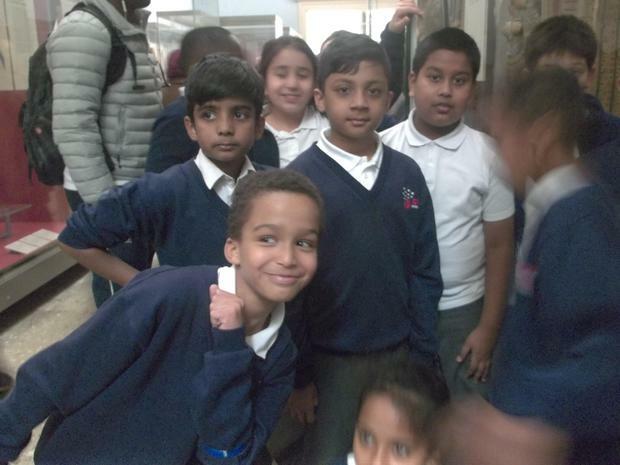 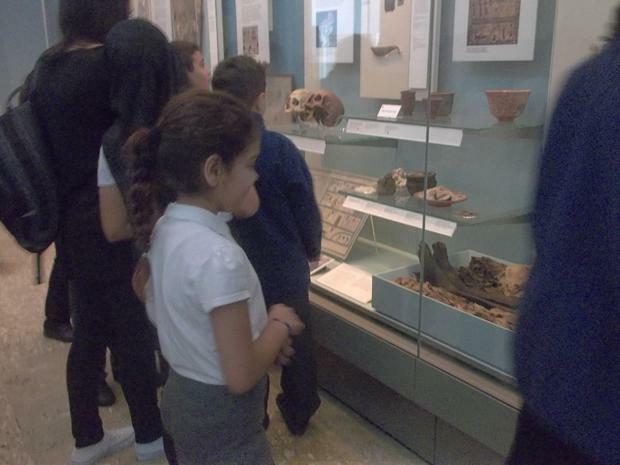 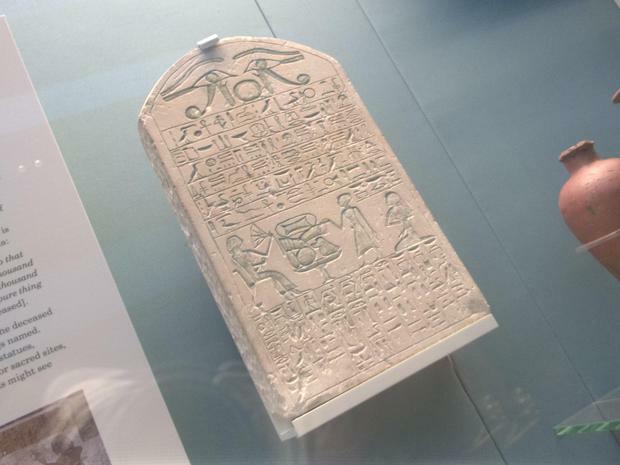 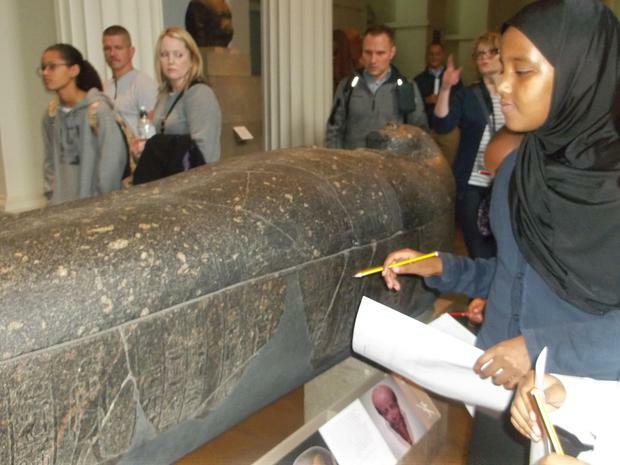 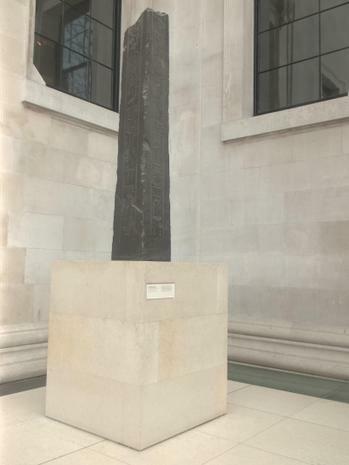 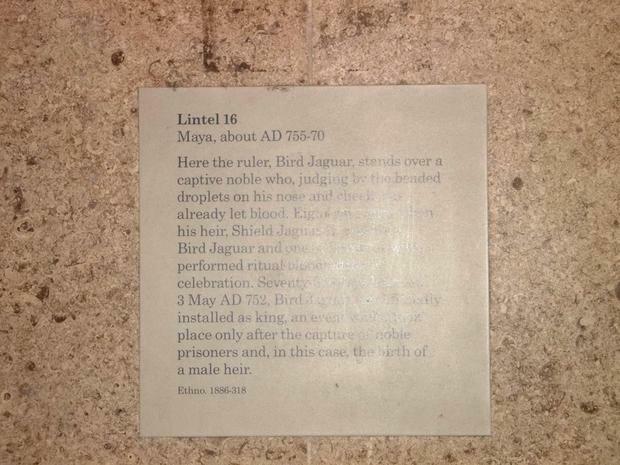 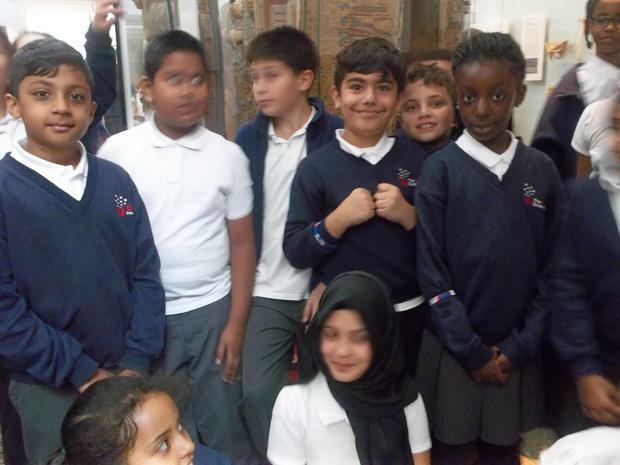 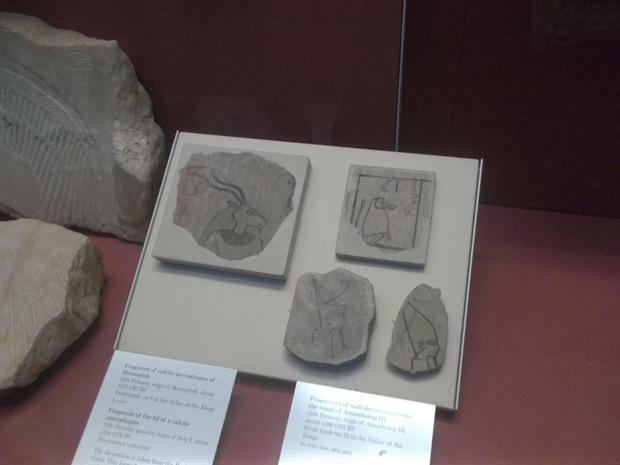 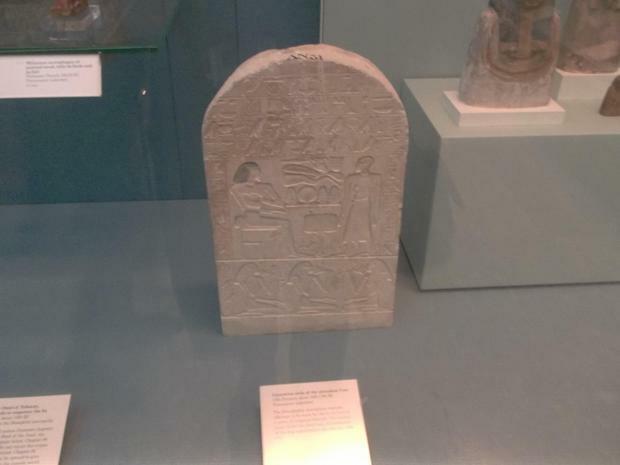 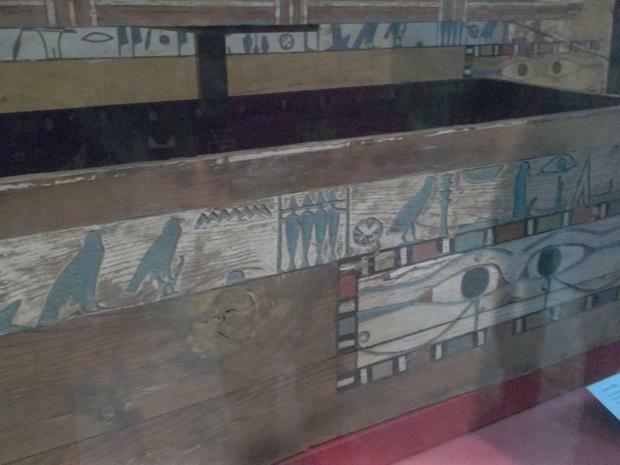 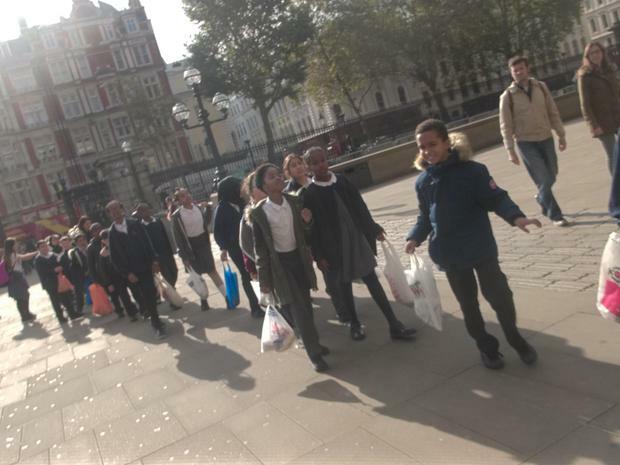 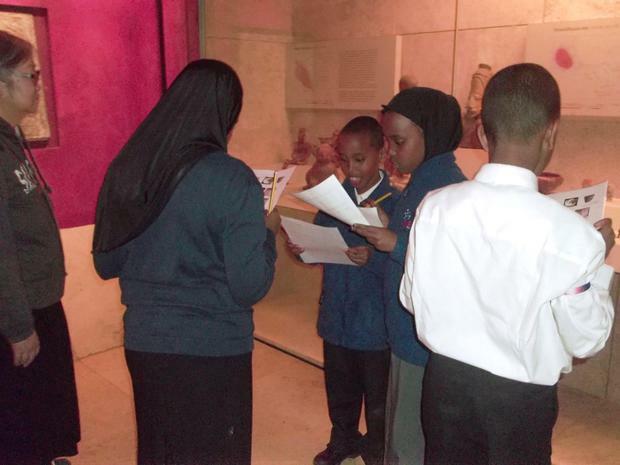 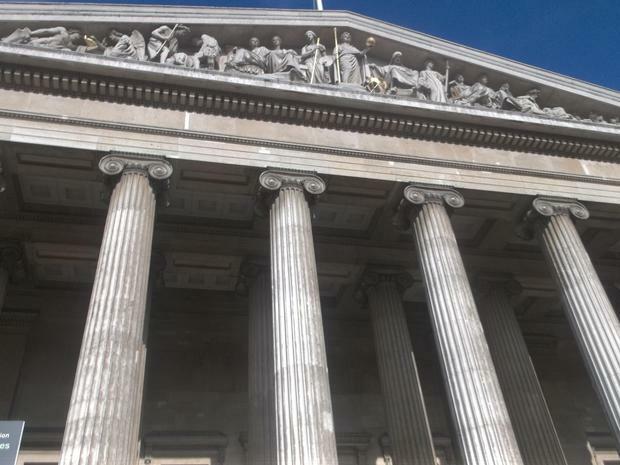 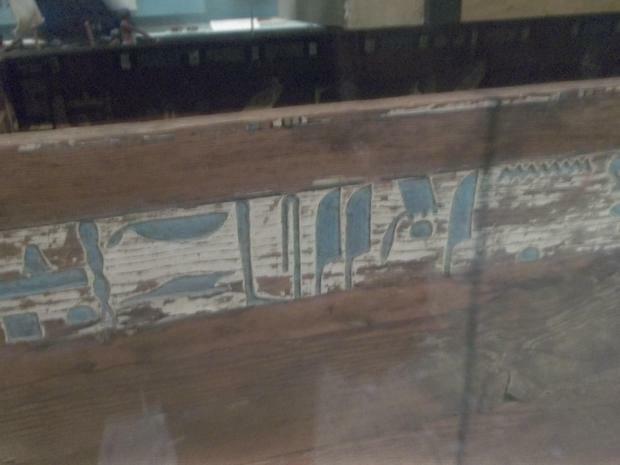 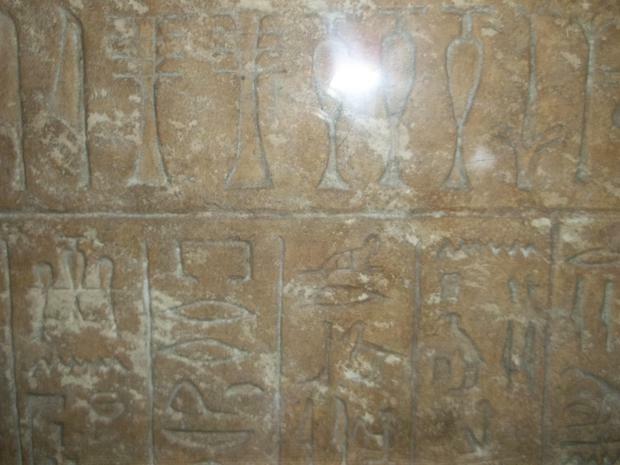 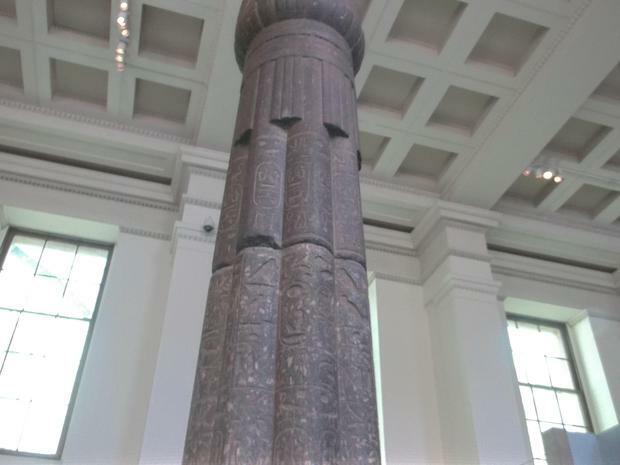 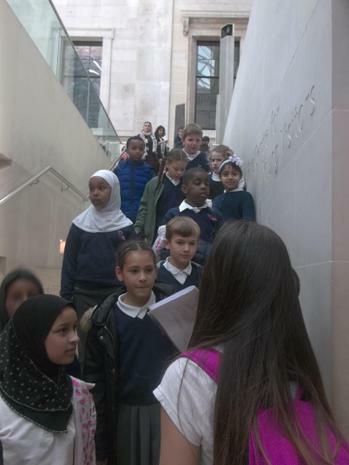 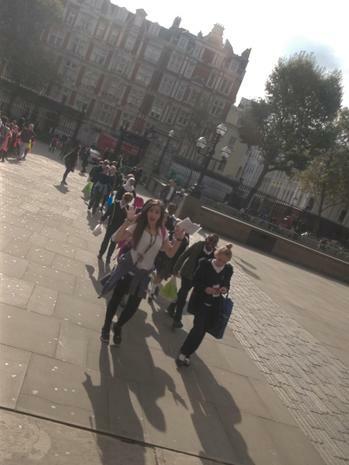 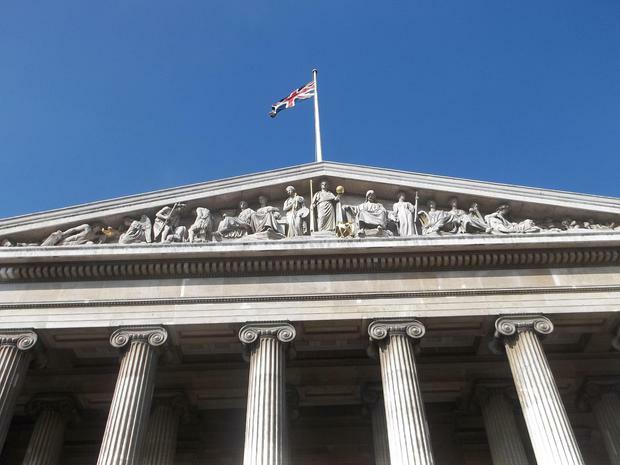 Year 5 really enjoyed their trip to the British Museum. 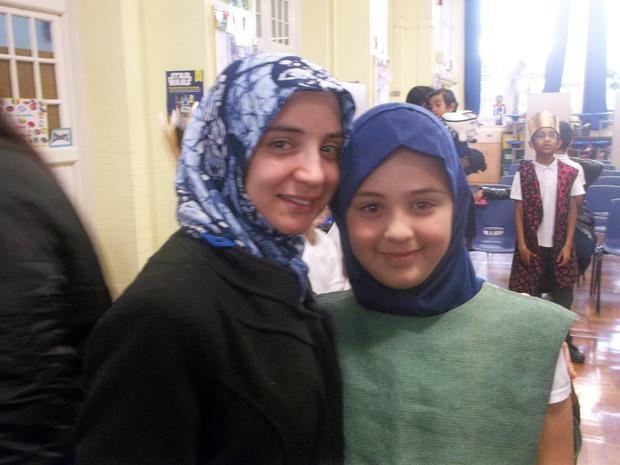 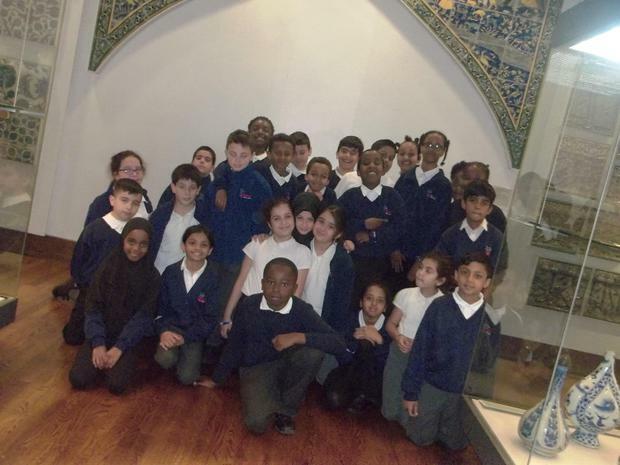 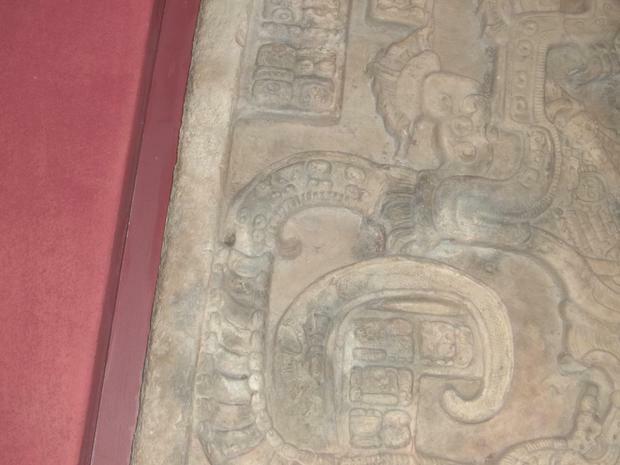 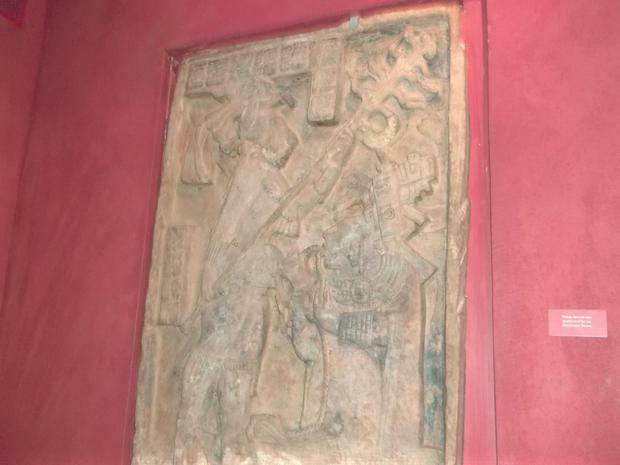 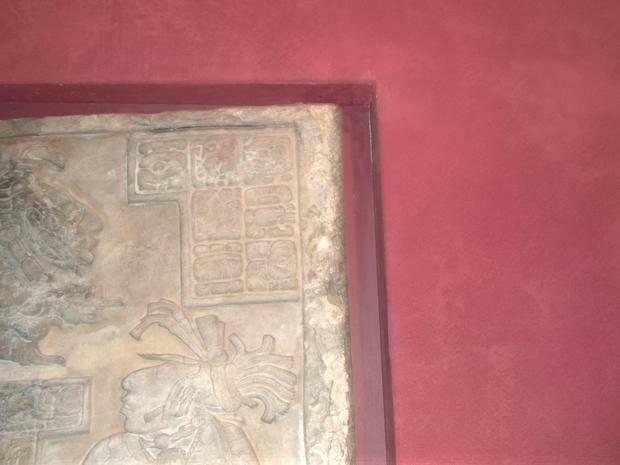 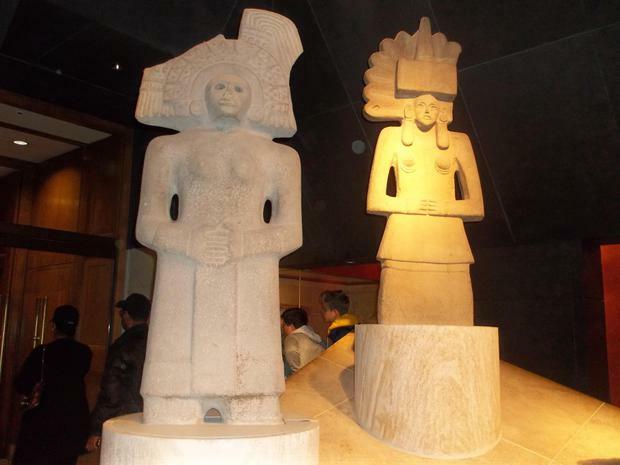 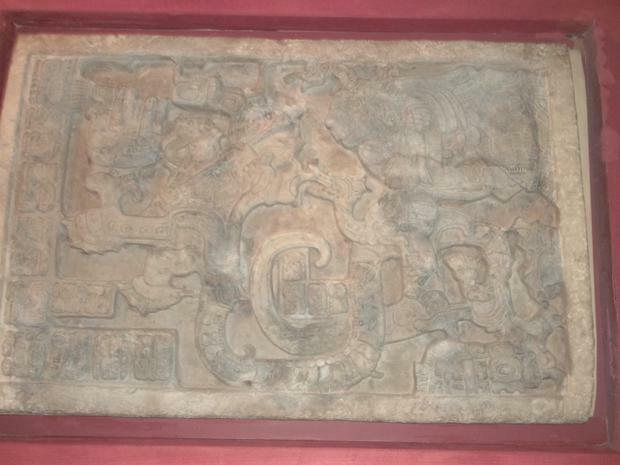 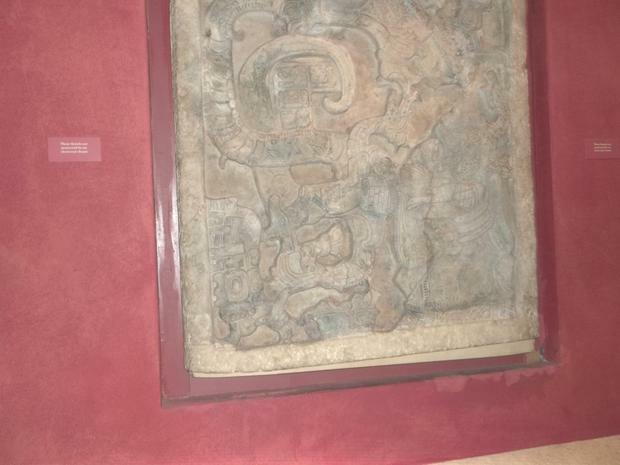 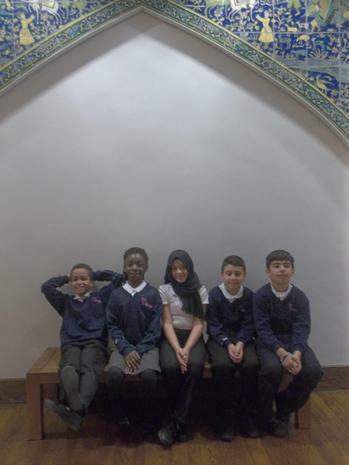 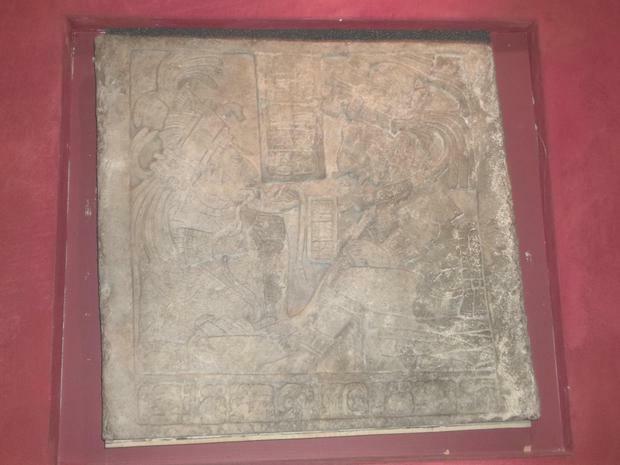 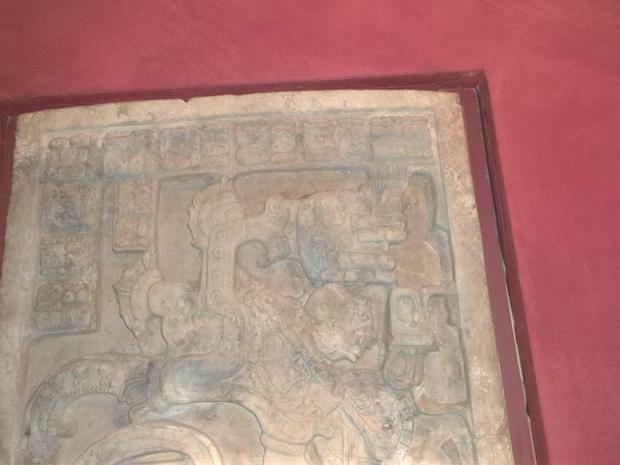 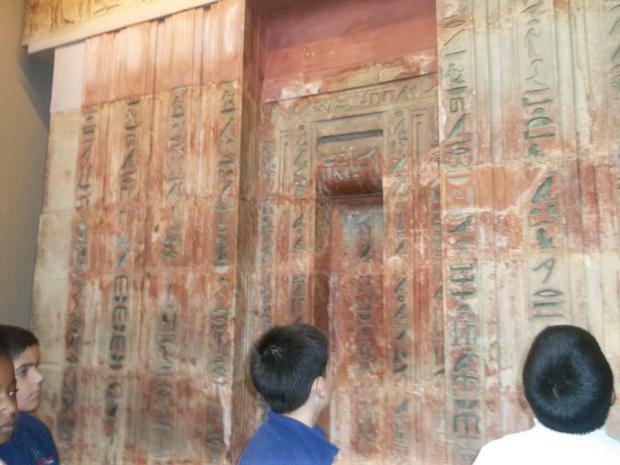 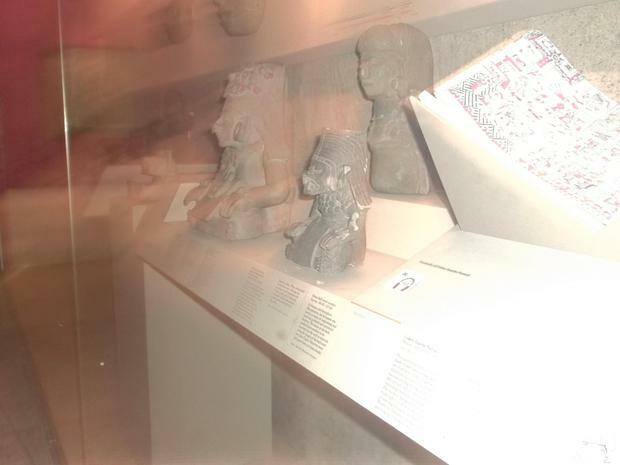 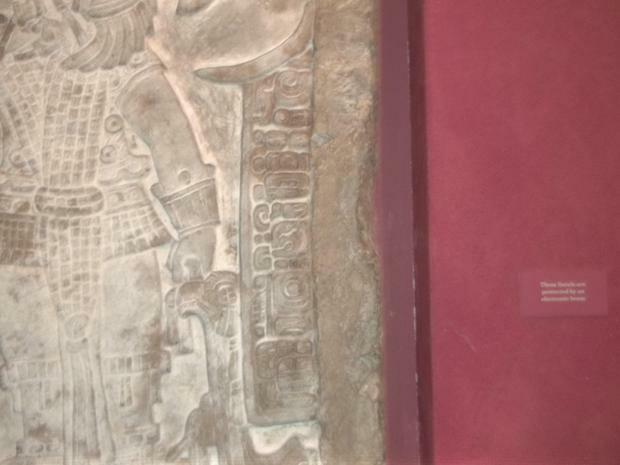 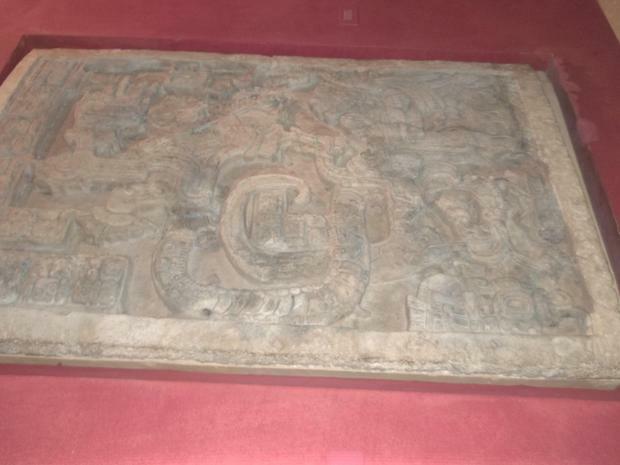 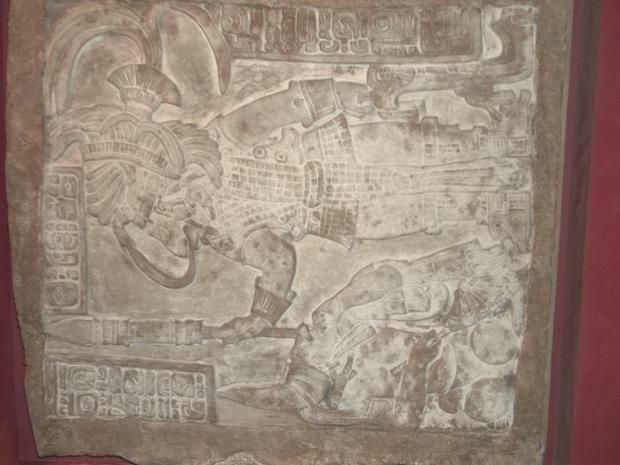 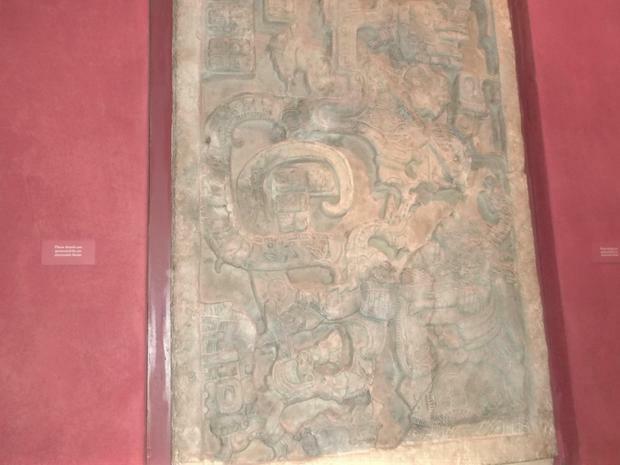 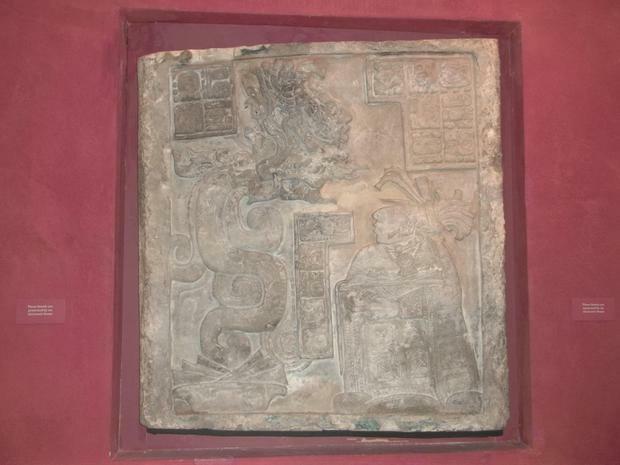 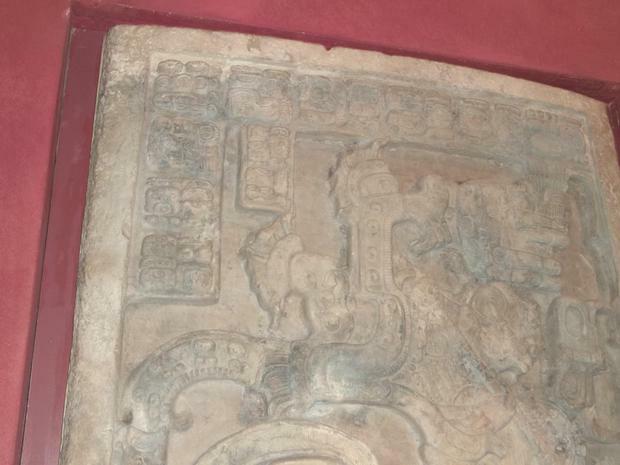 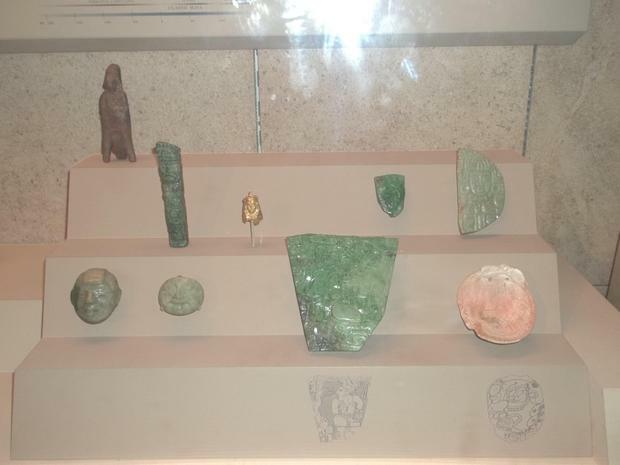 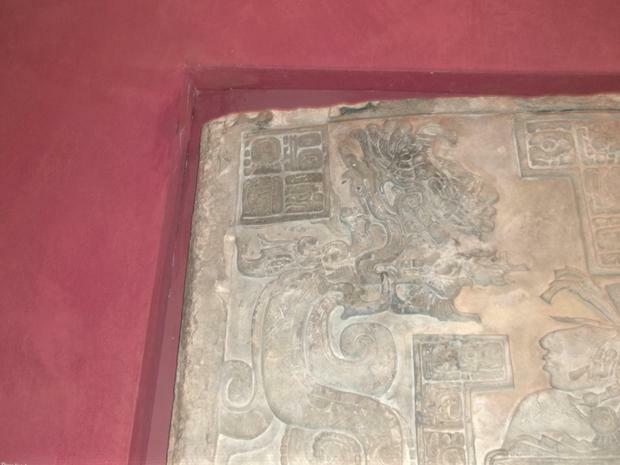 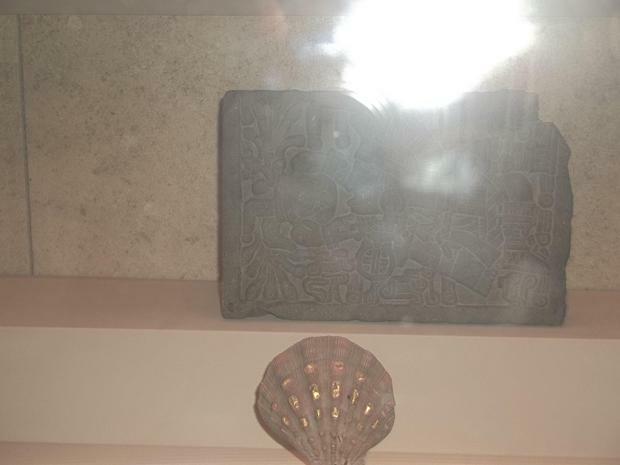 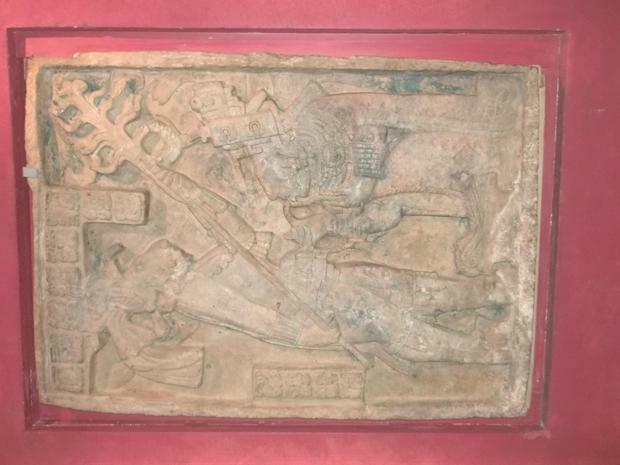 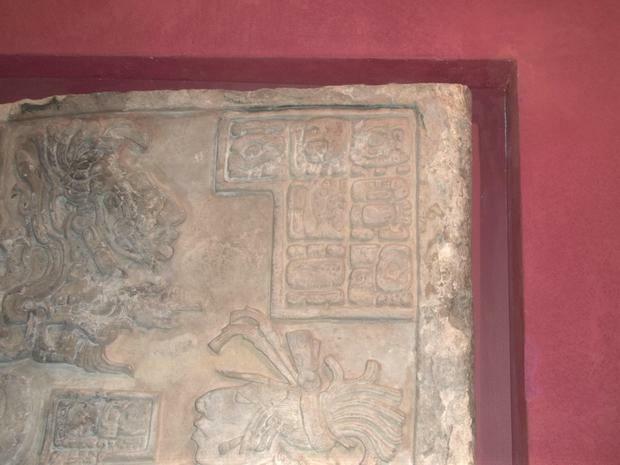 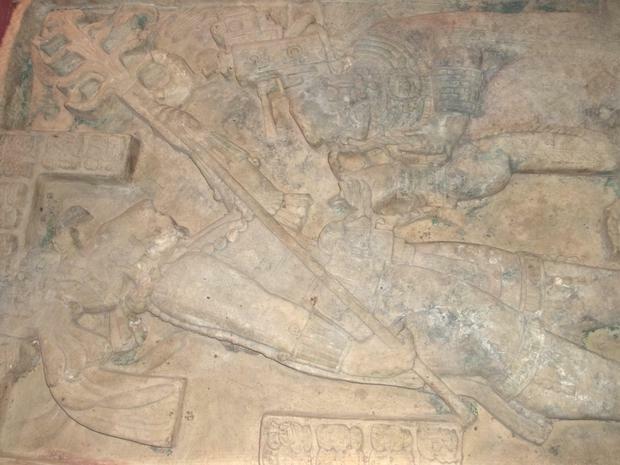 We looked at the Mexican Mayan exhibition and the Islamic exhibition. 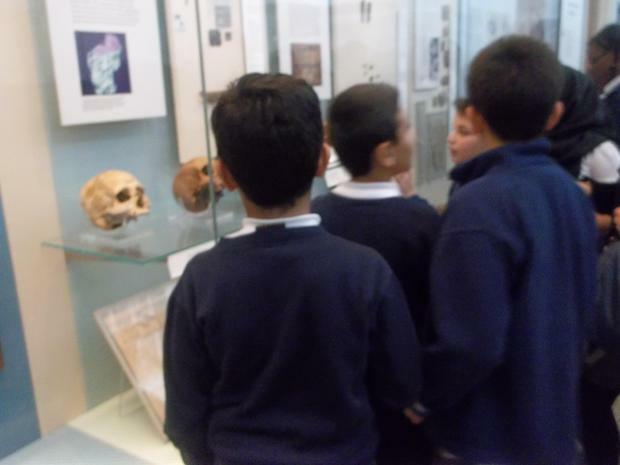 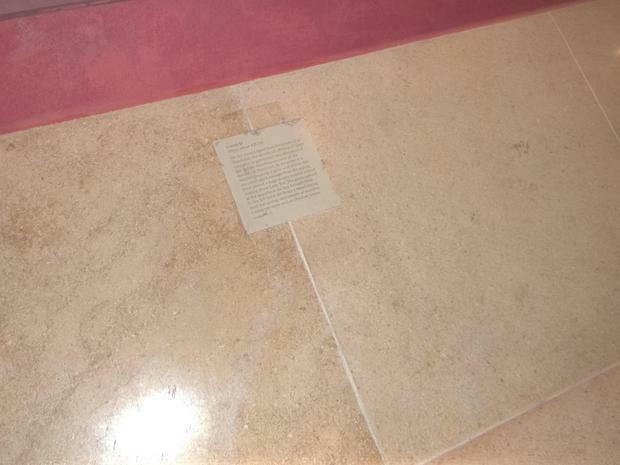 Have a look at what we found out.